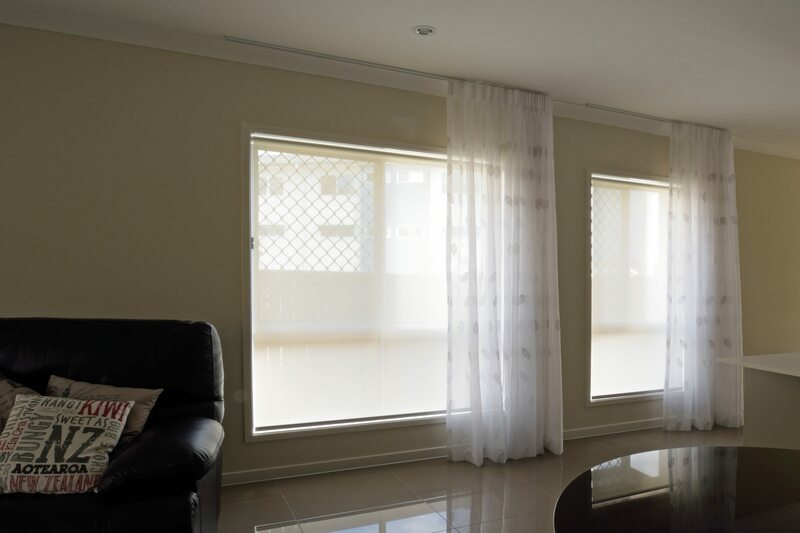 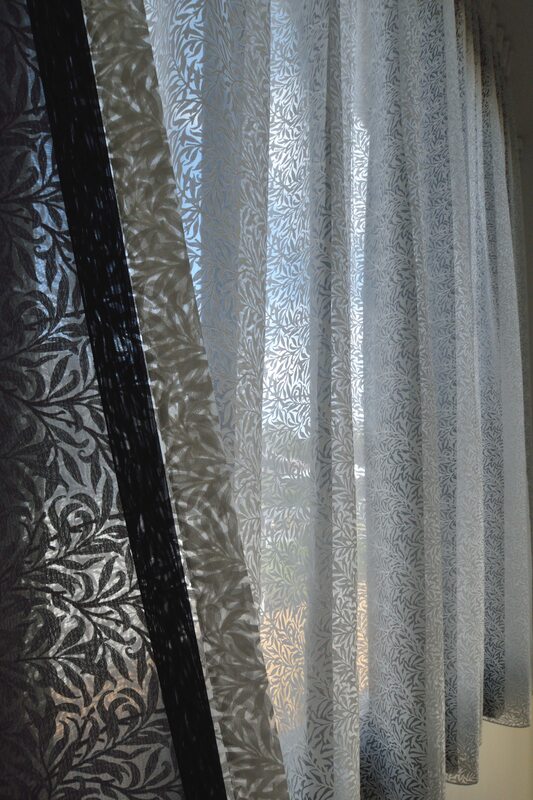 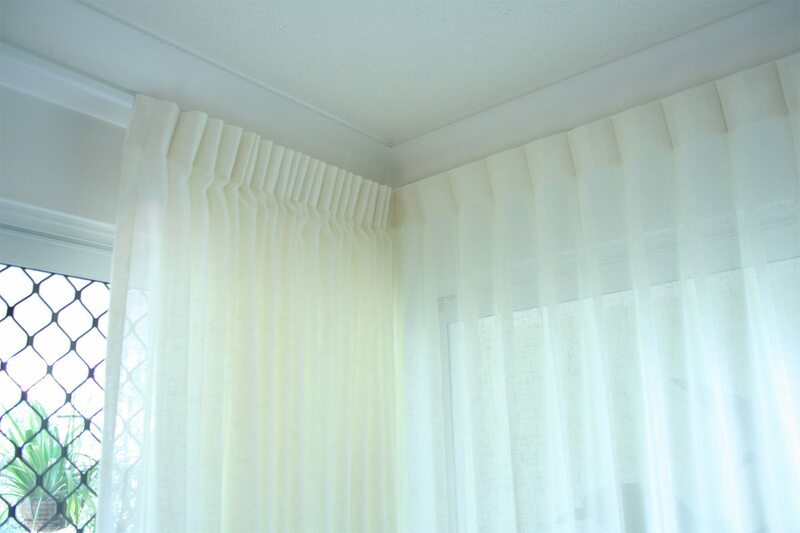 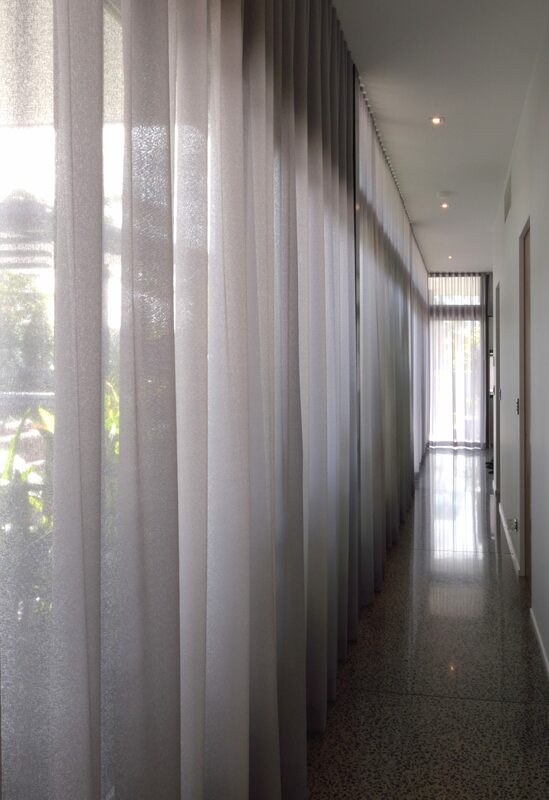 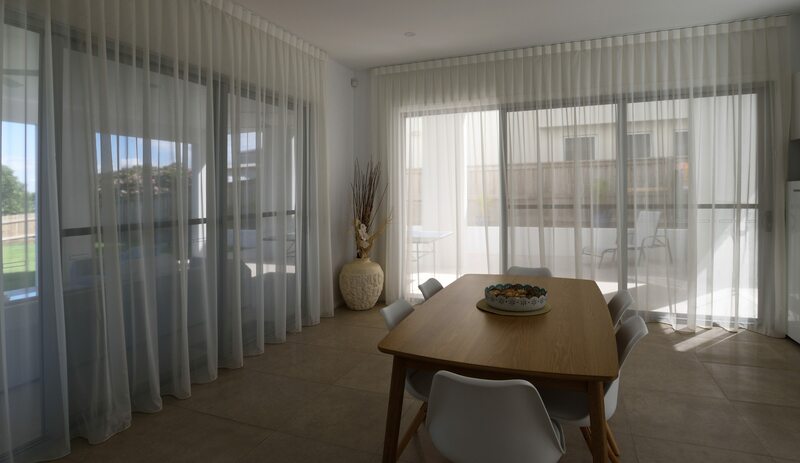 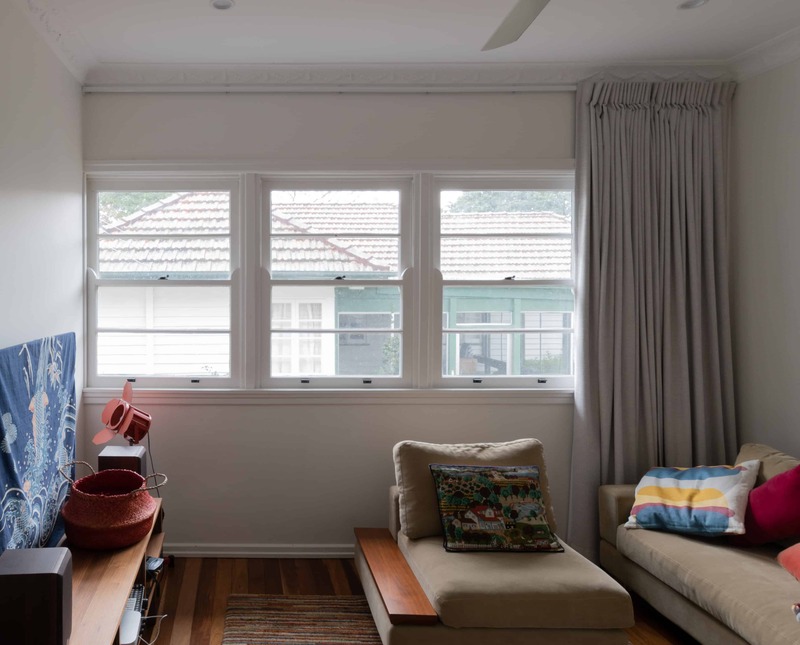 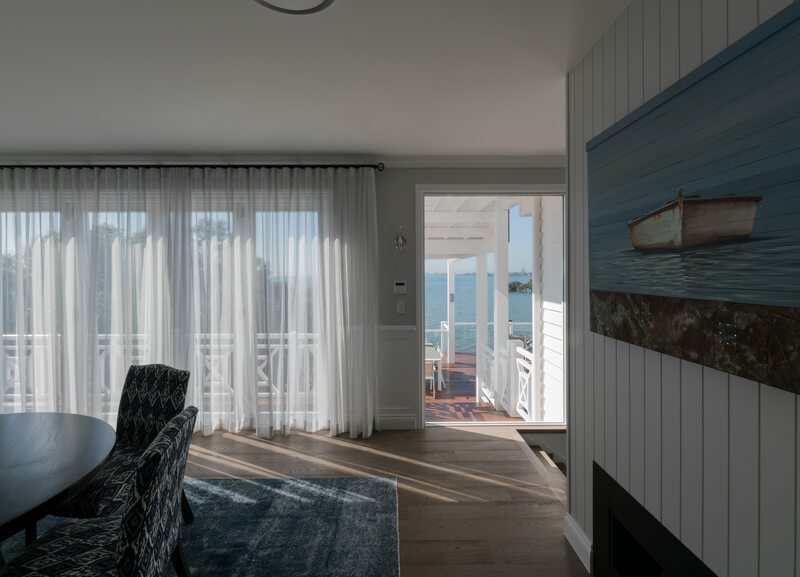 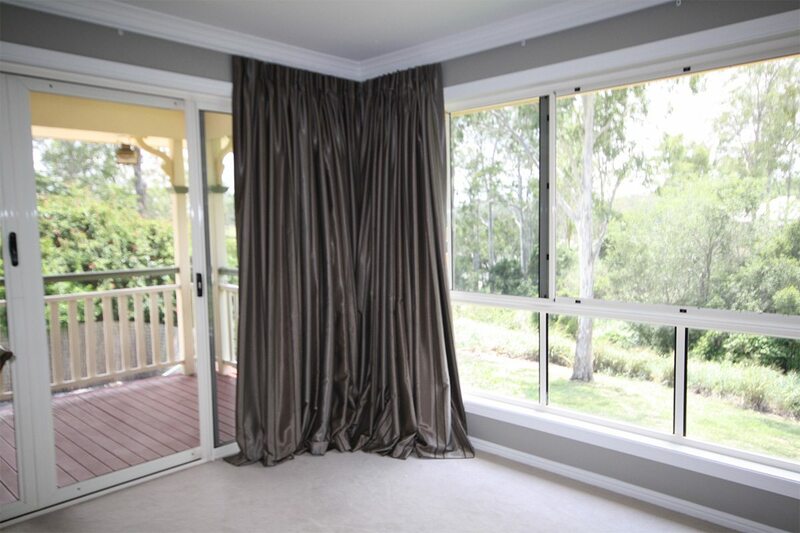 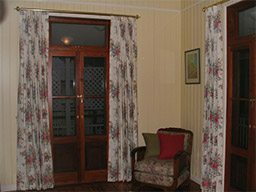 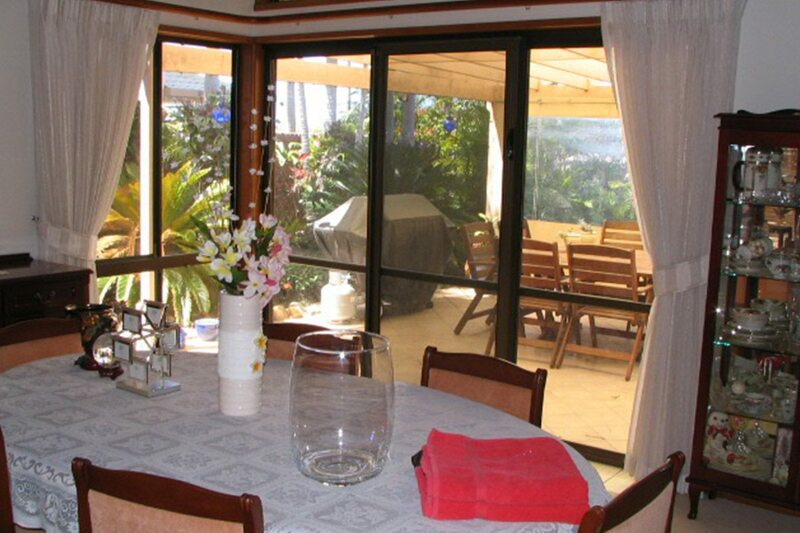 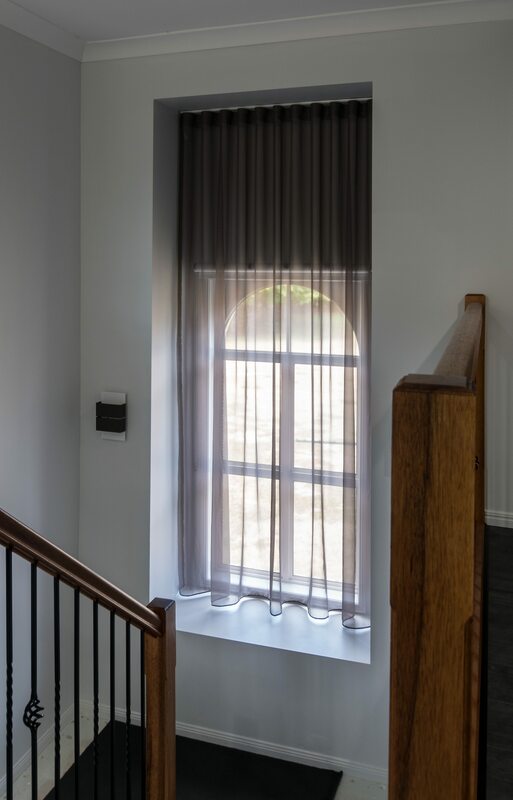 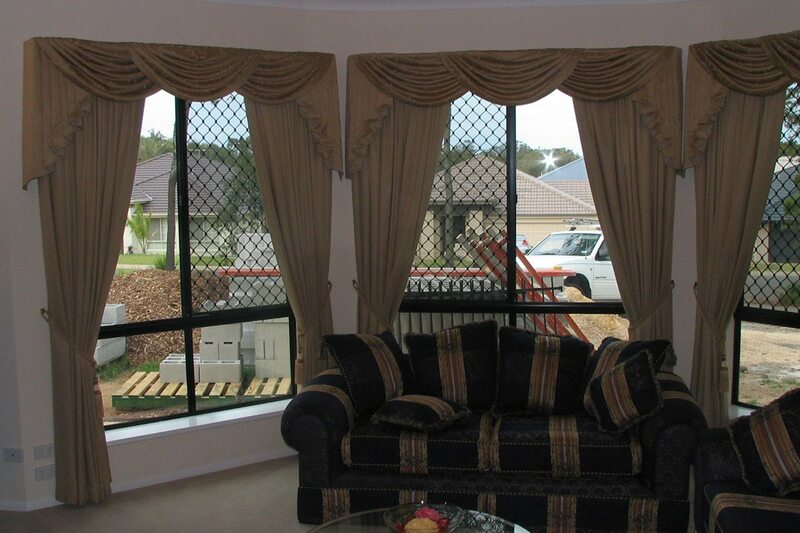 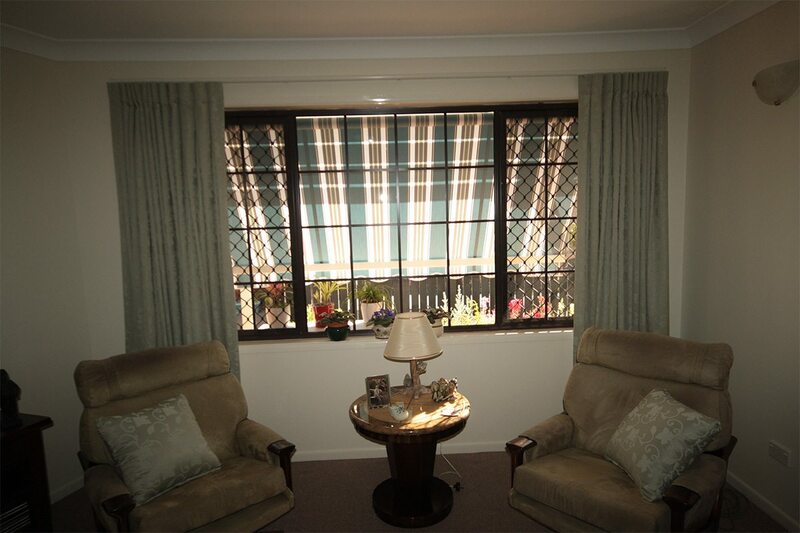 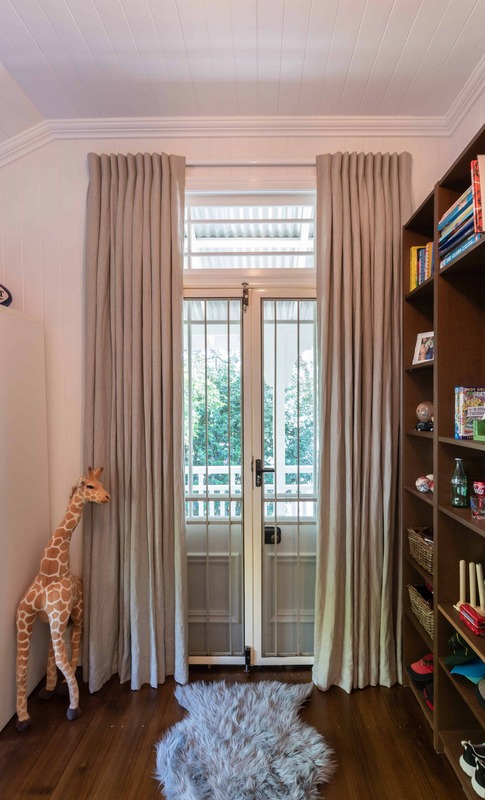 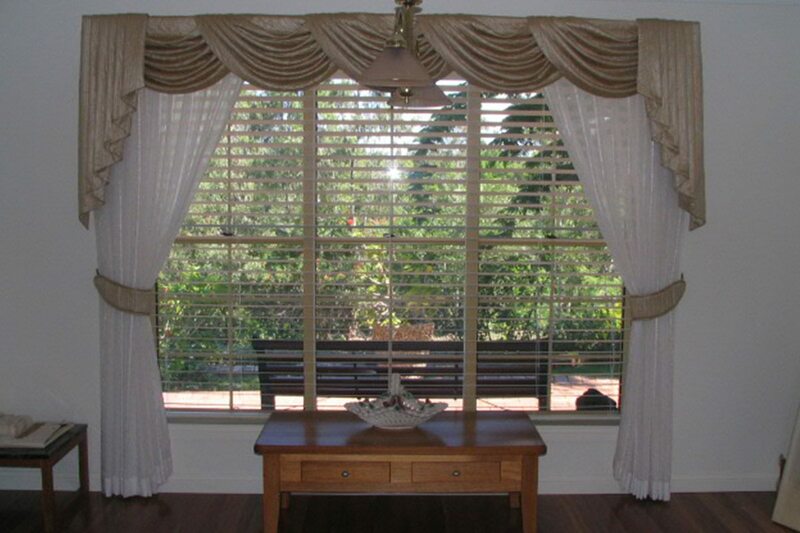 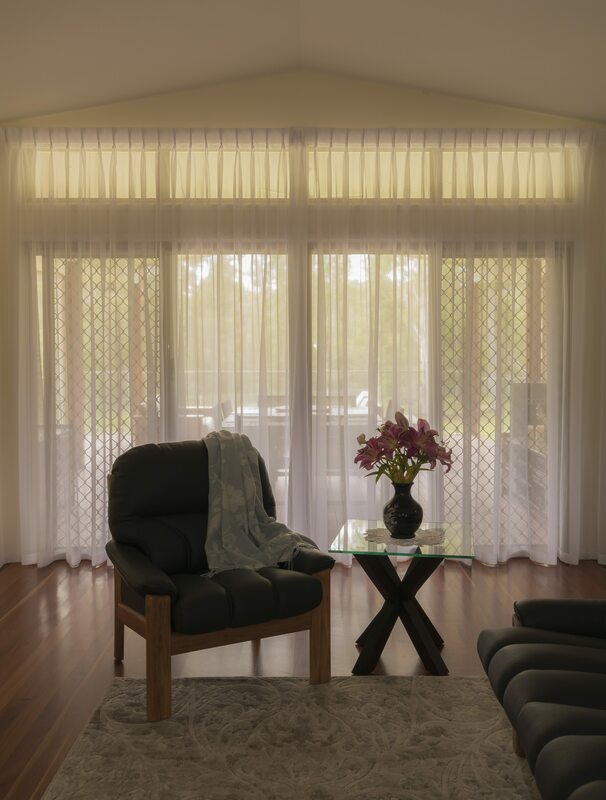 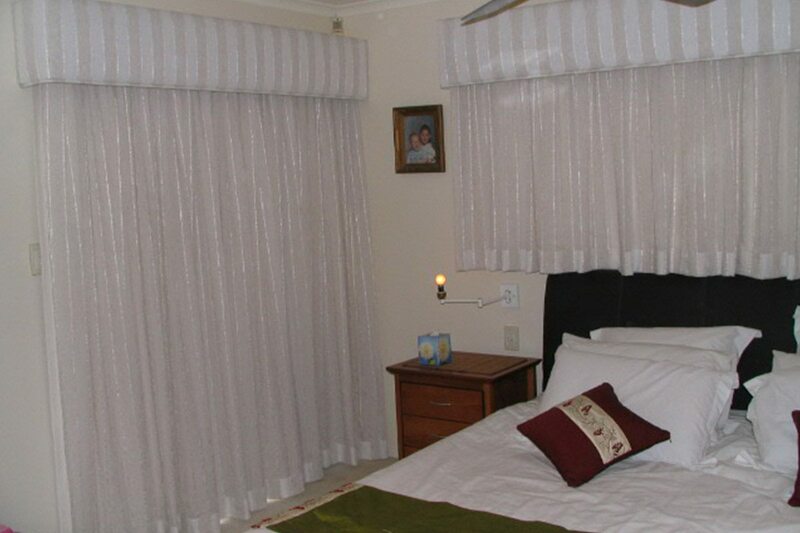 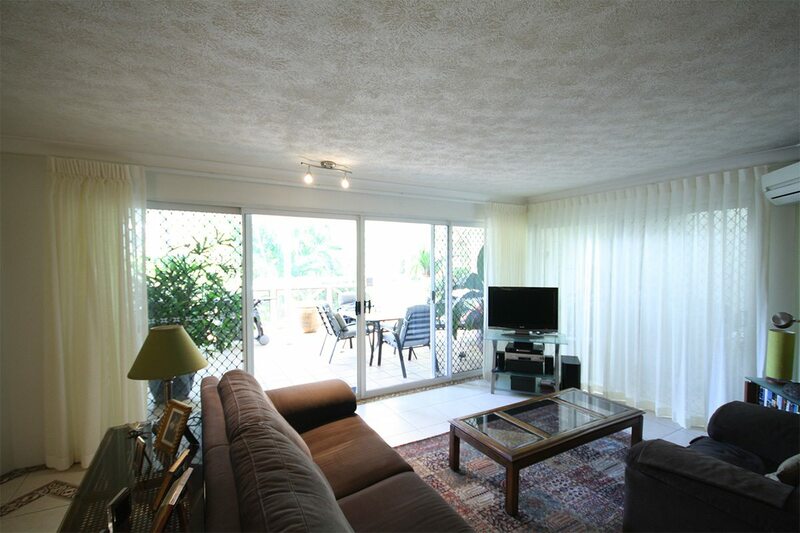 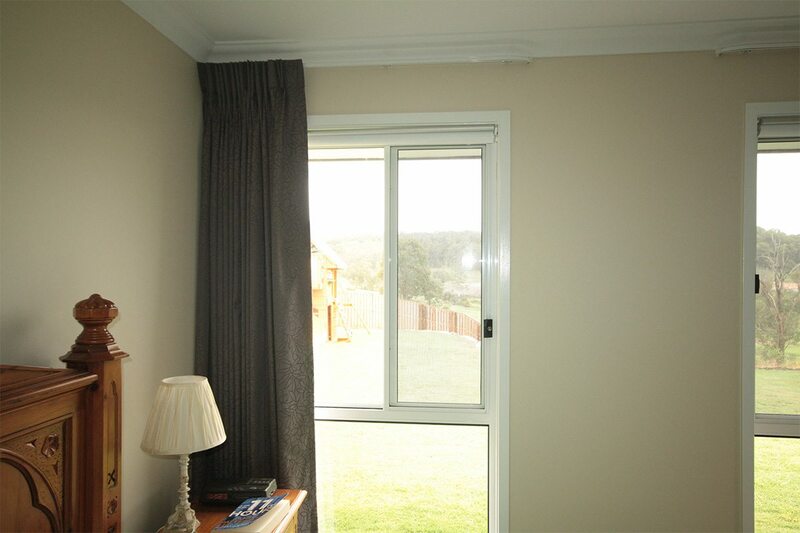 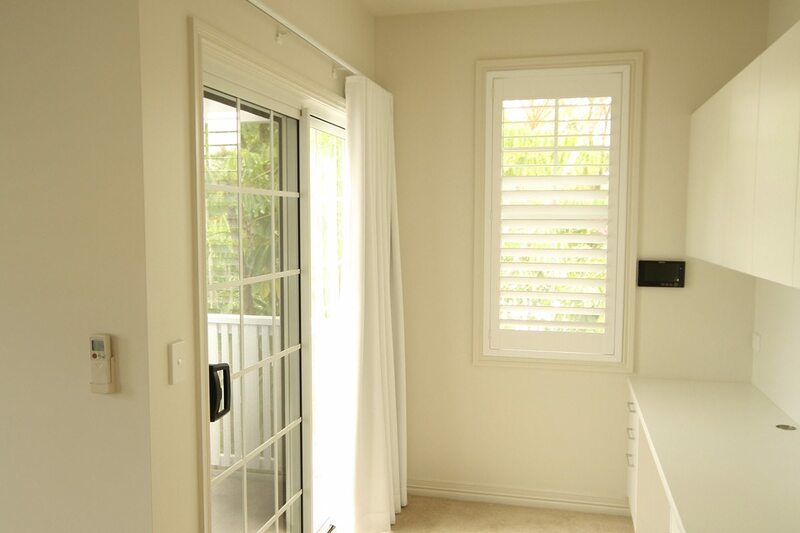 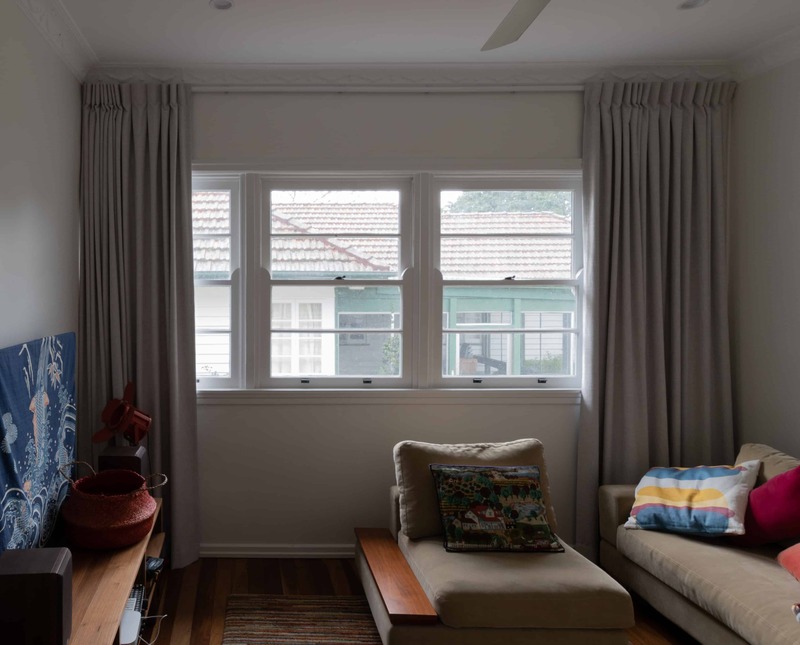 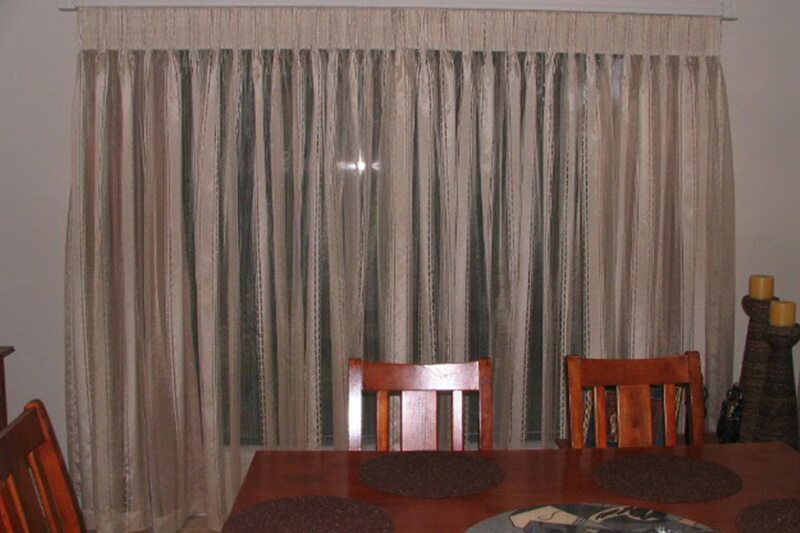 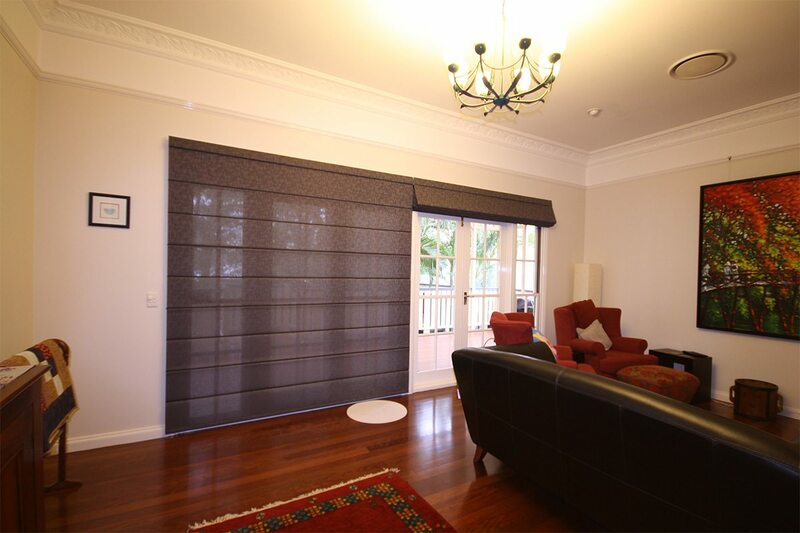 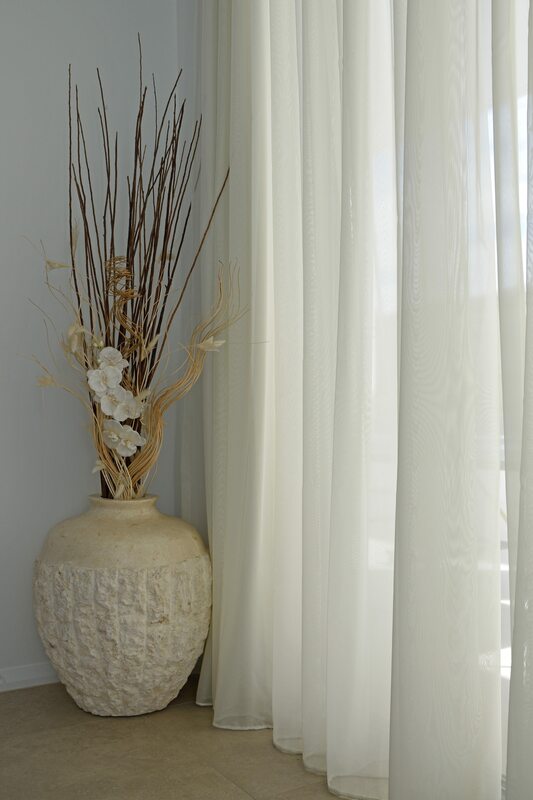 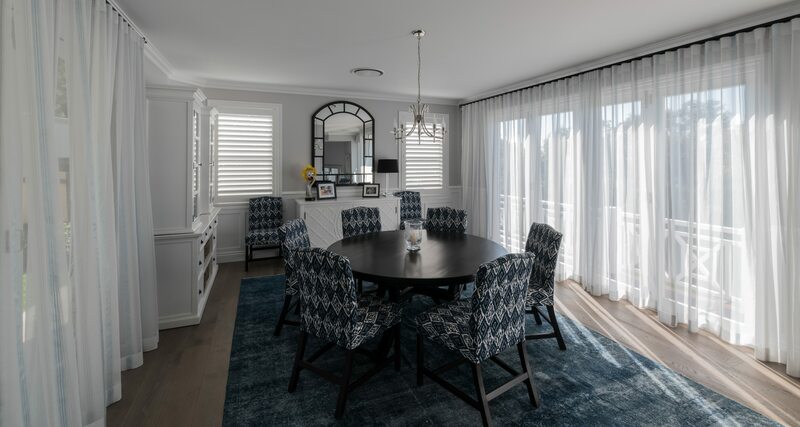 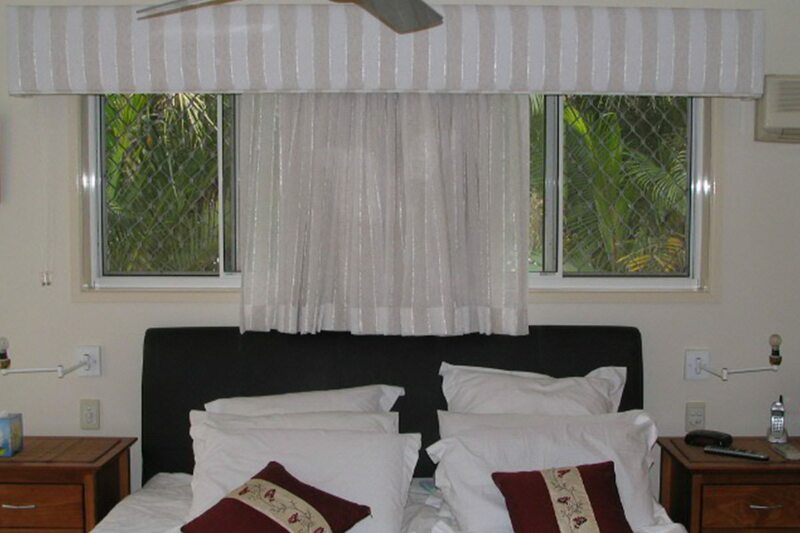 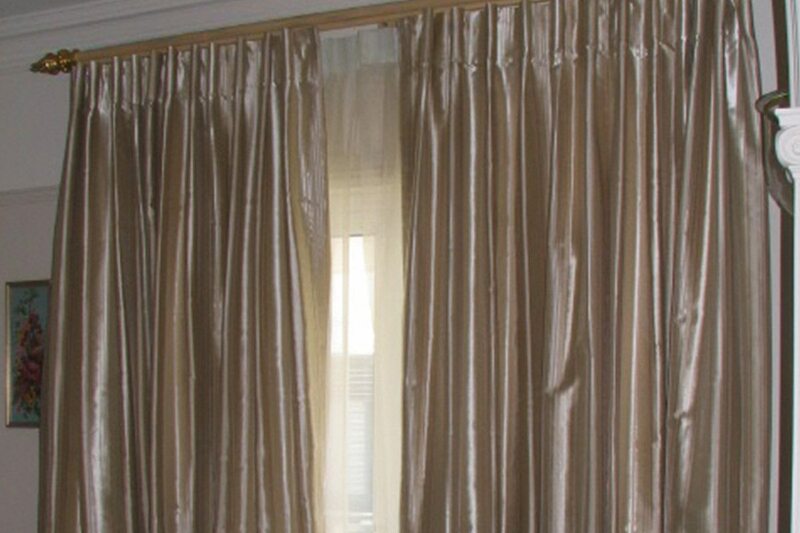 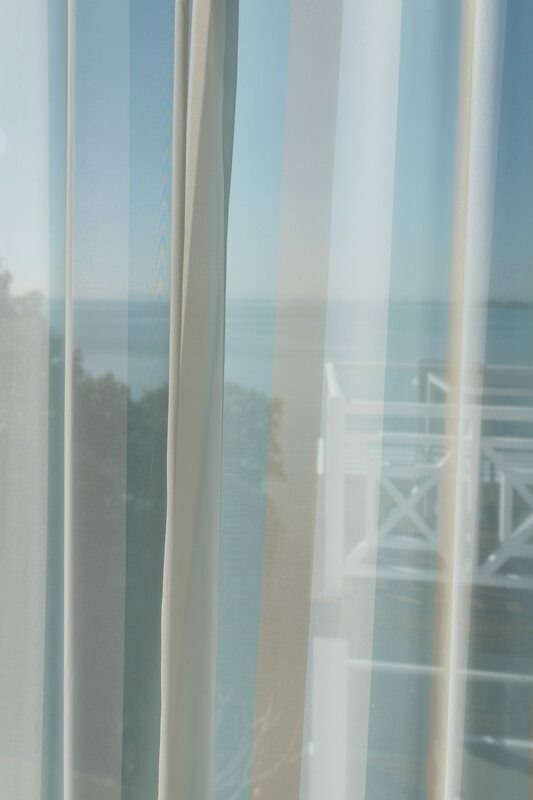 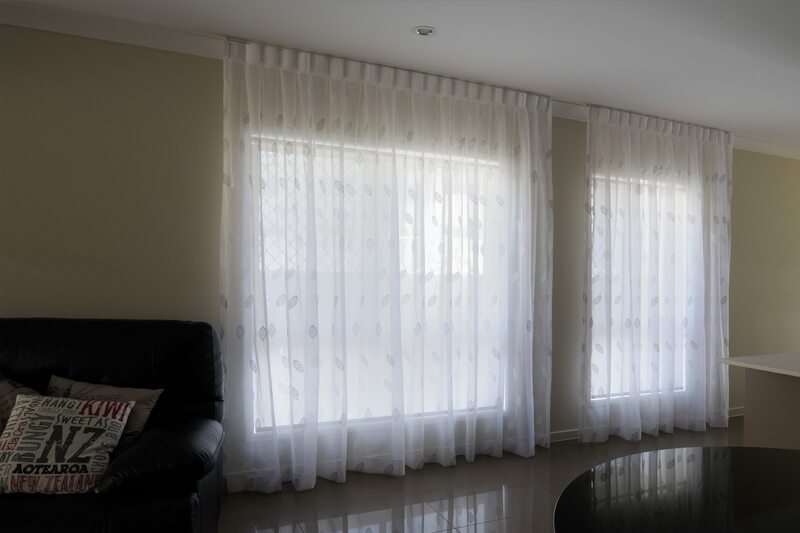 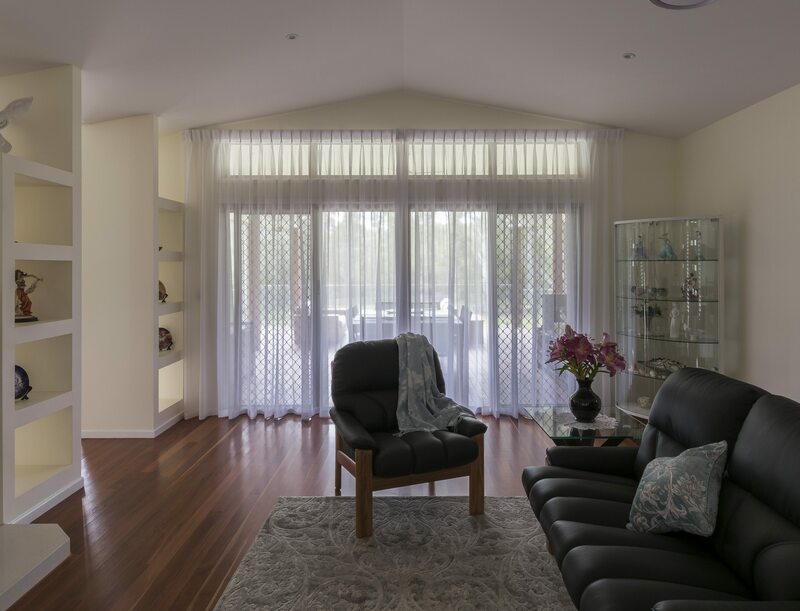 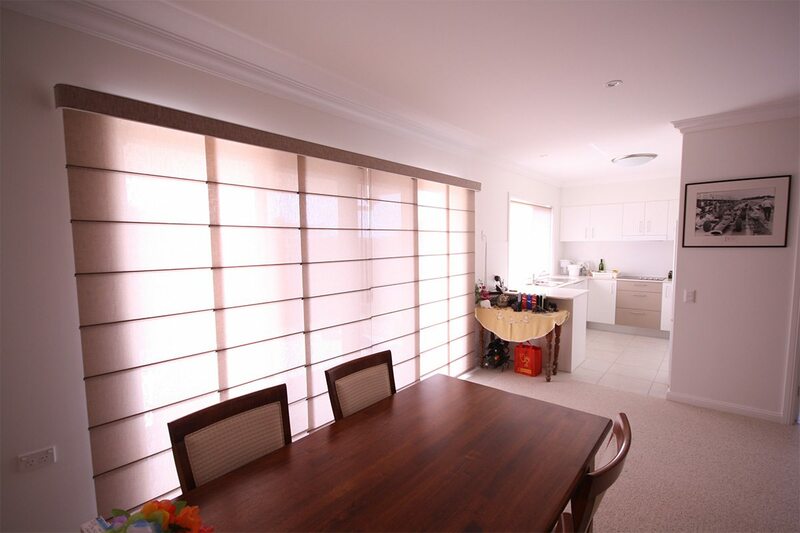 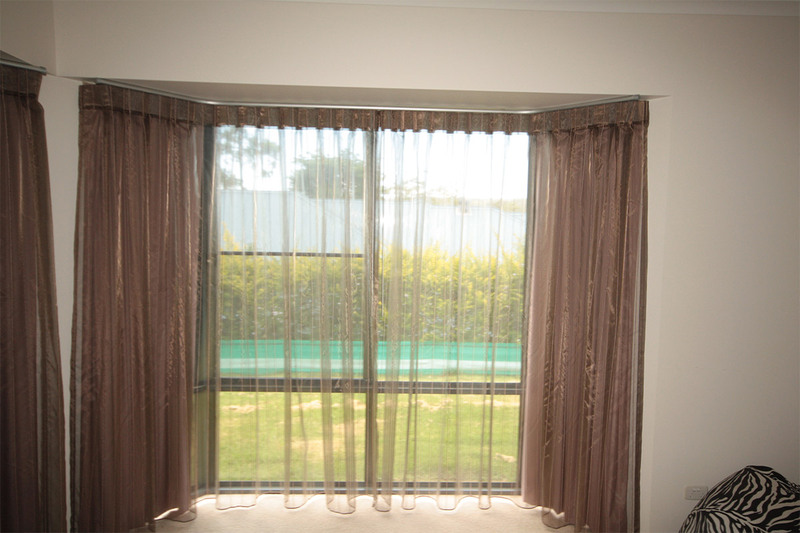 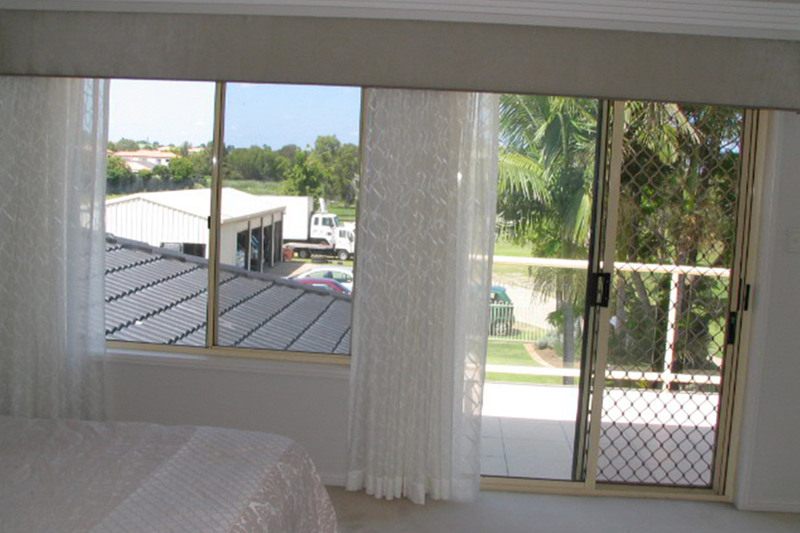 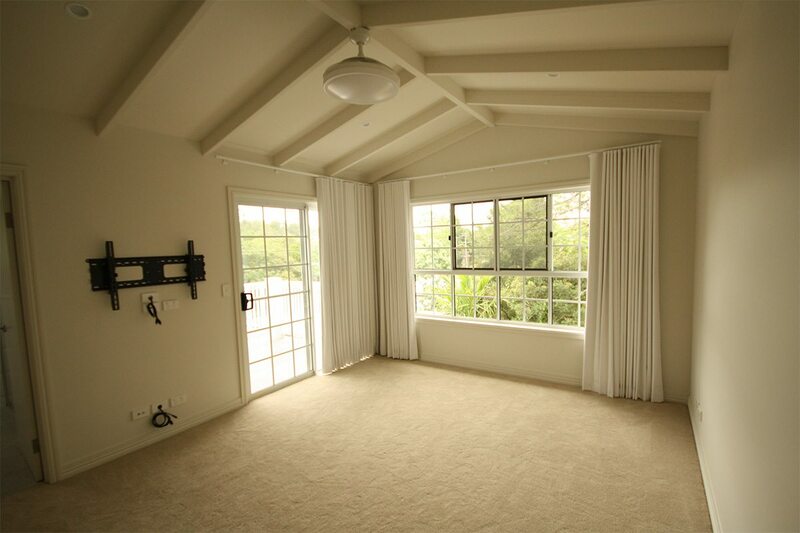 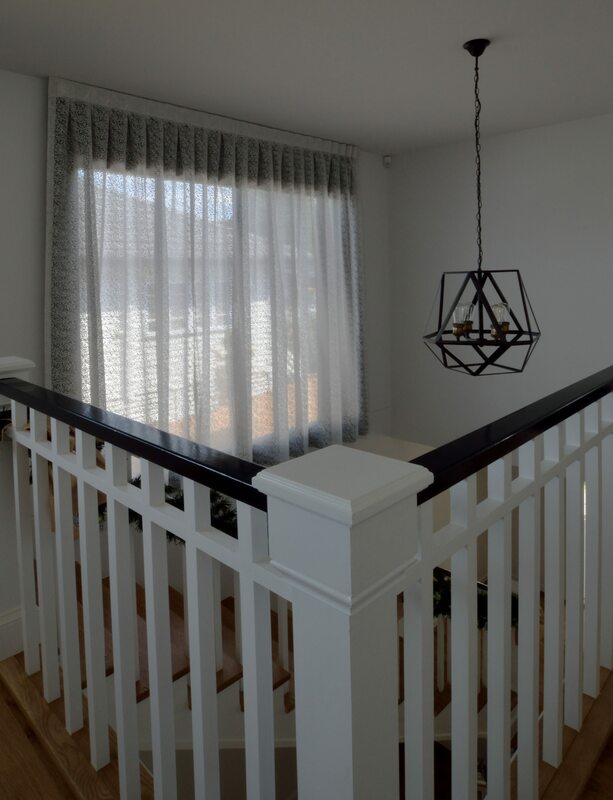 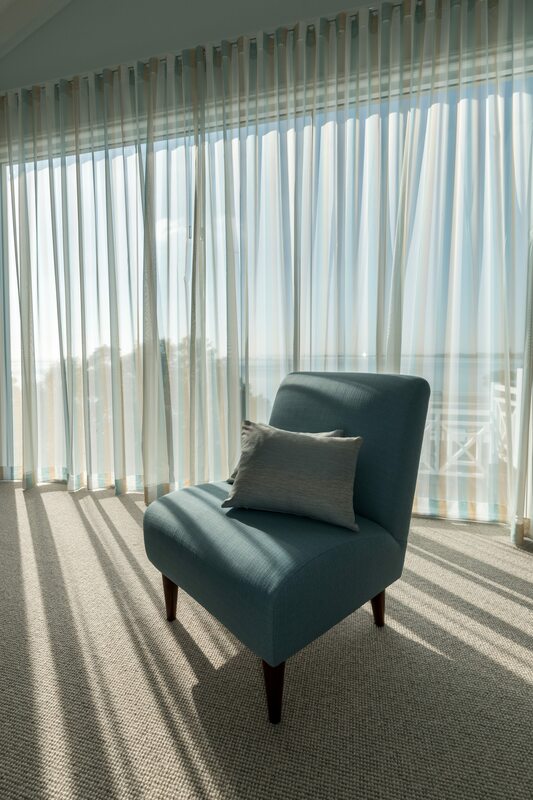 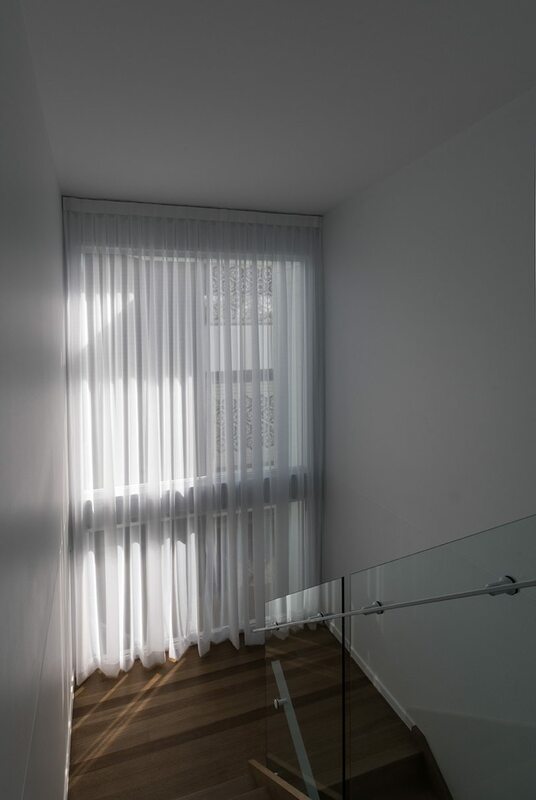 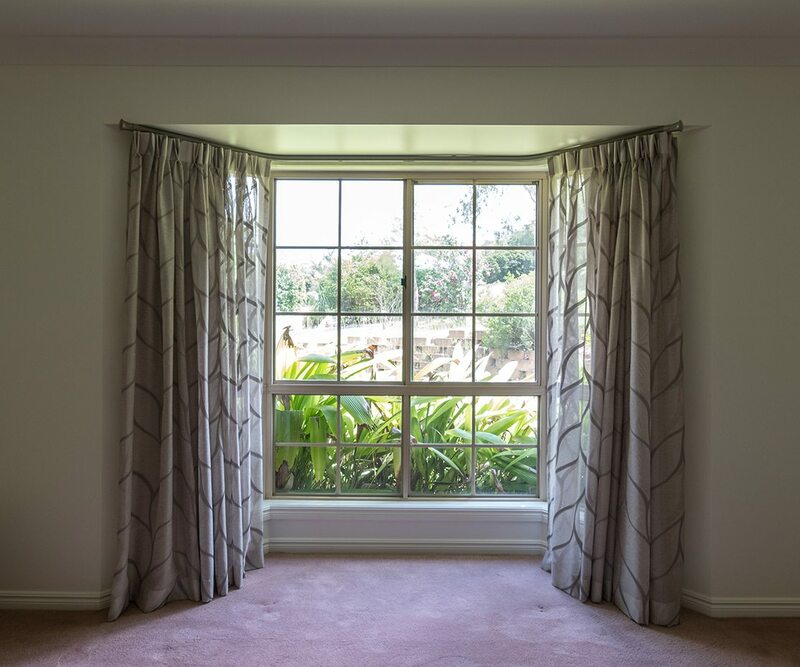 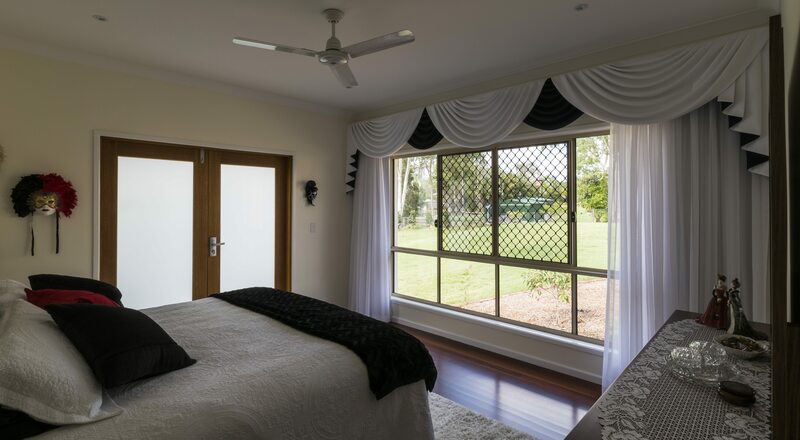 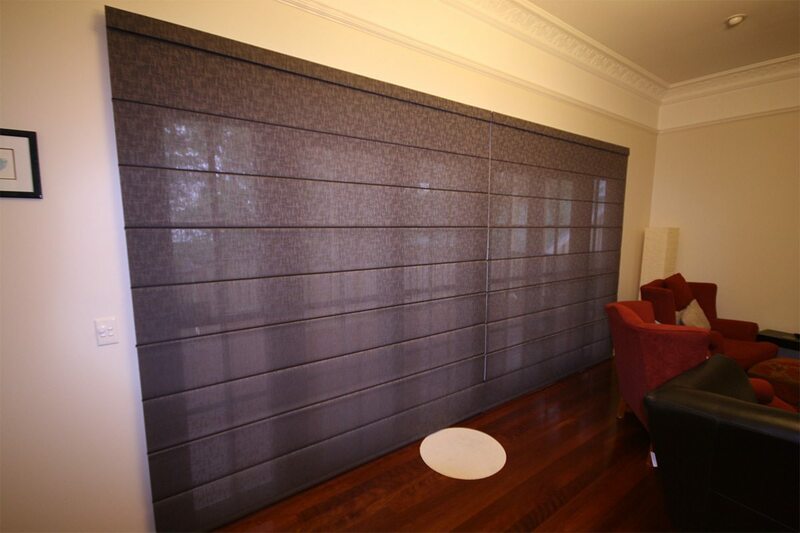 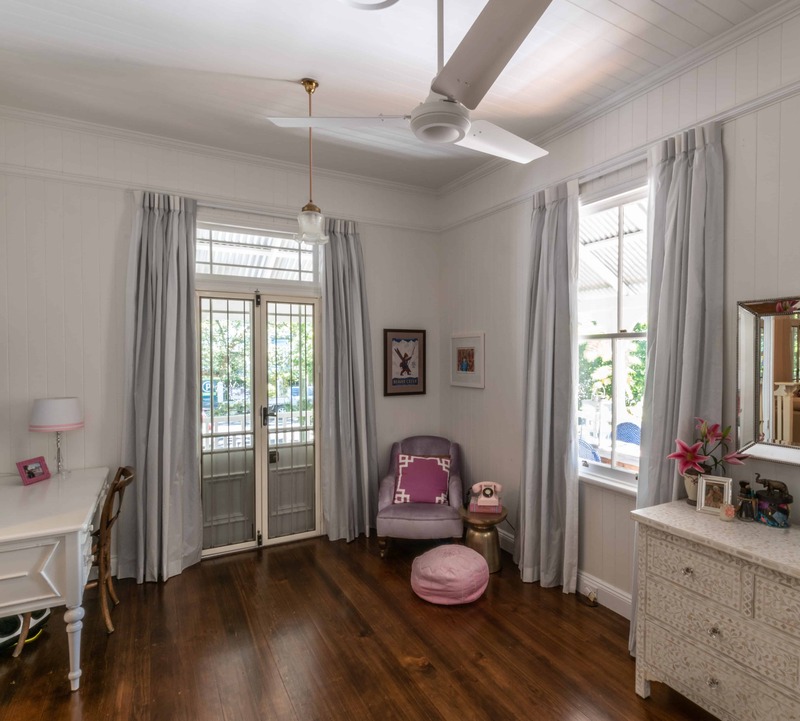 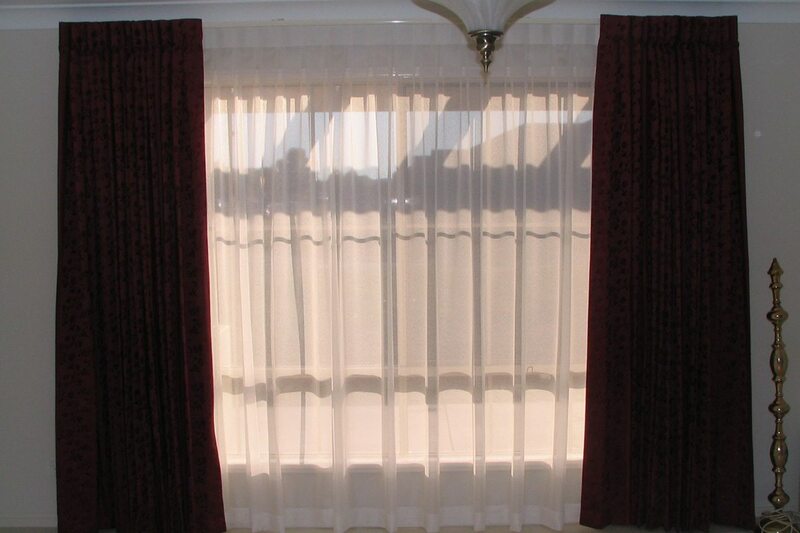 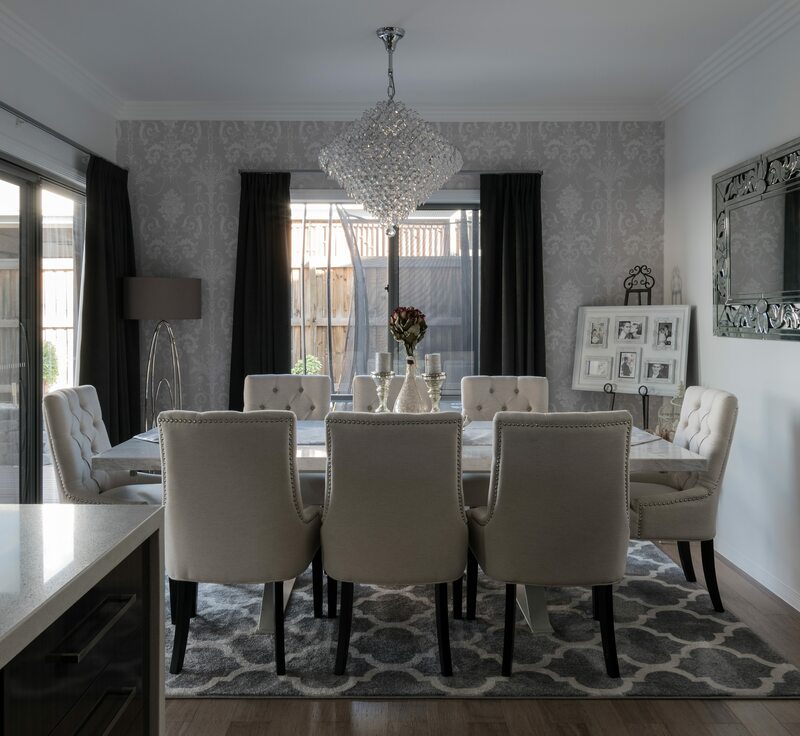 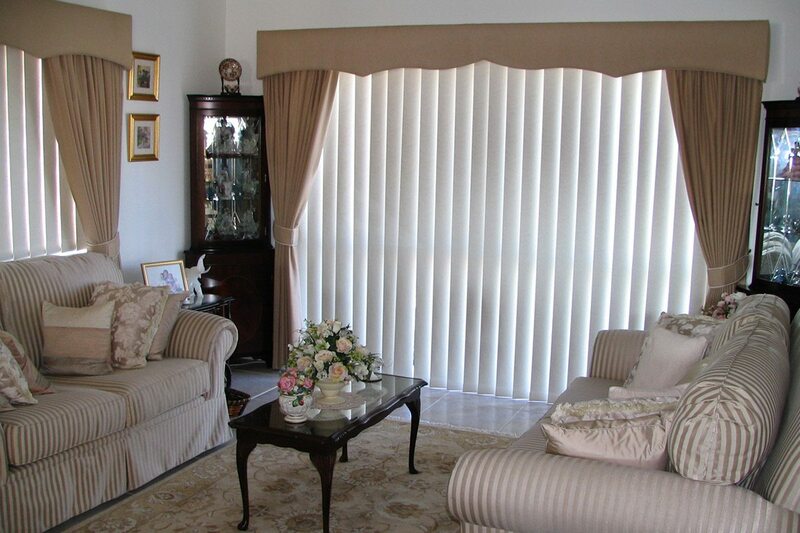 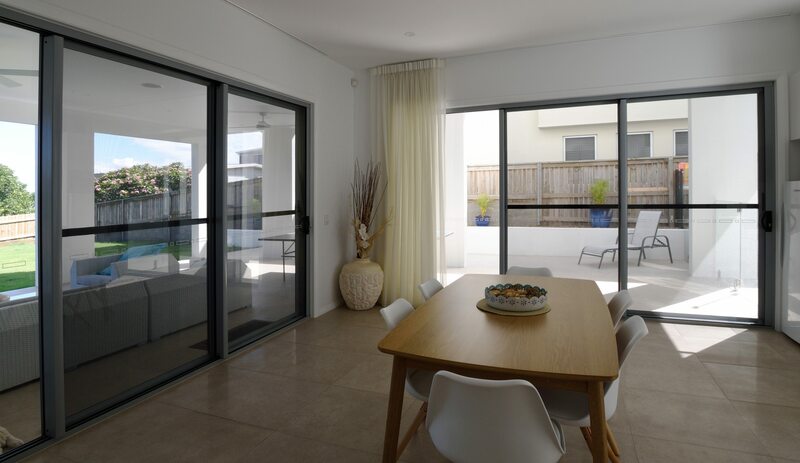 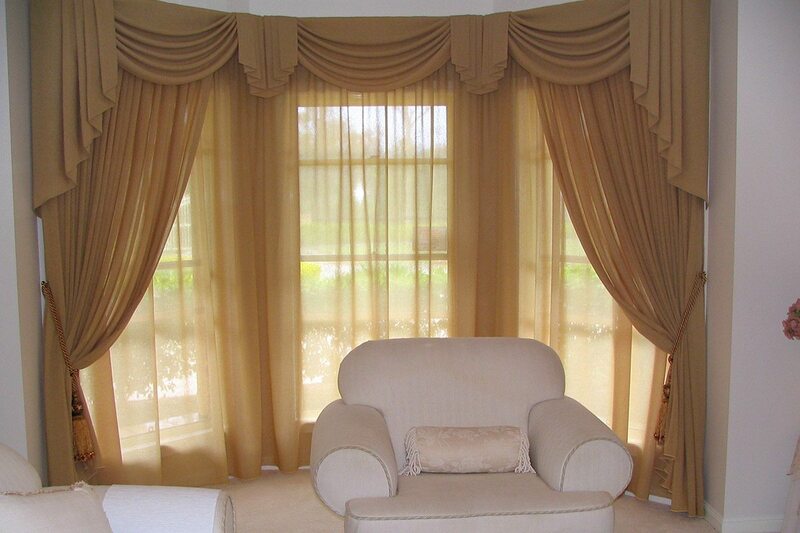 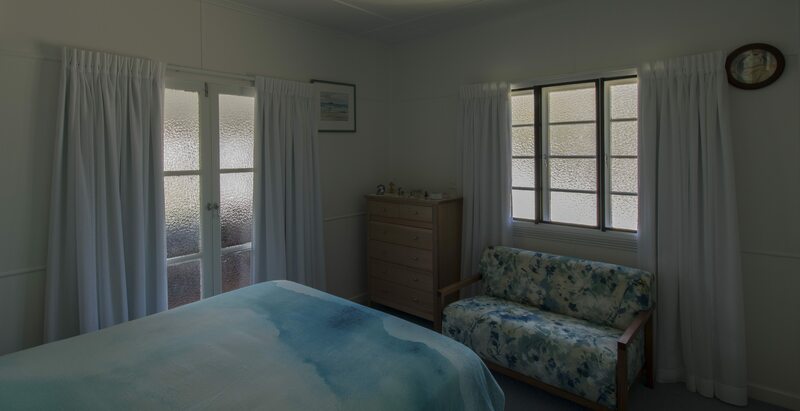 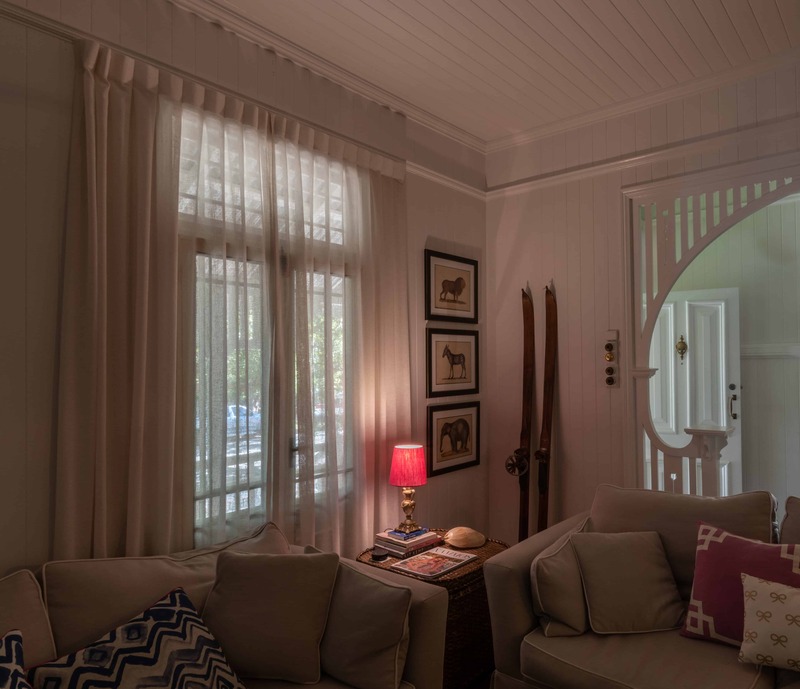 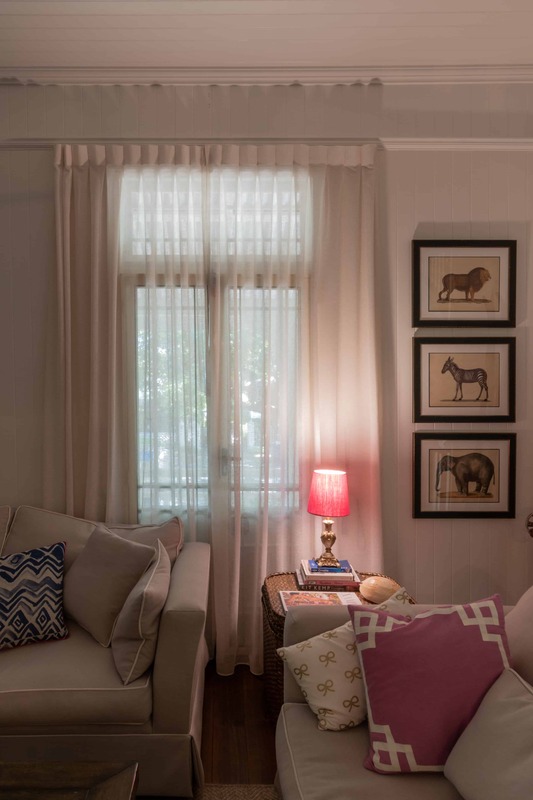 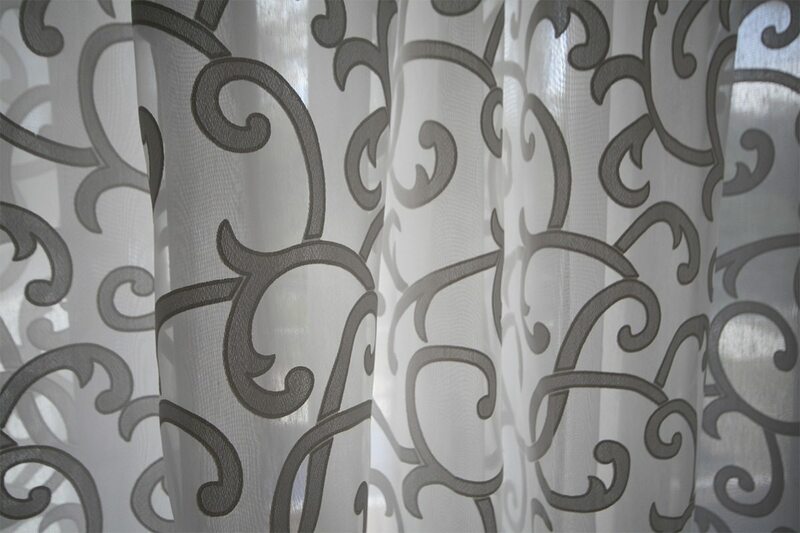 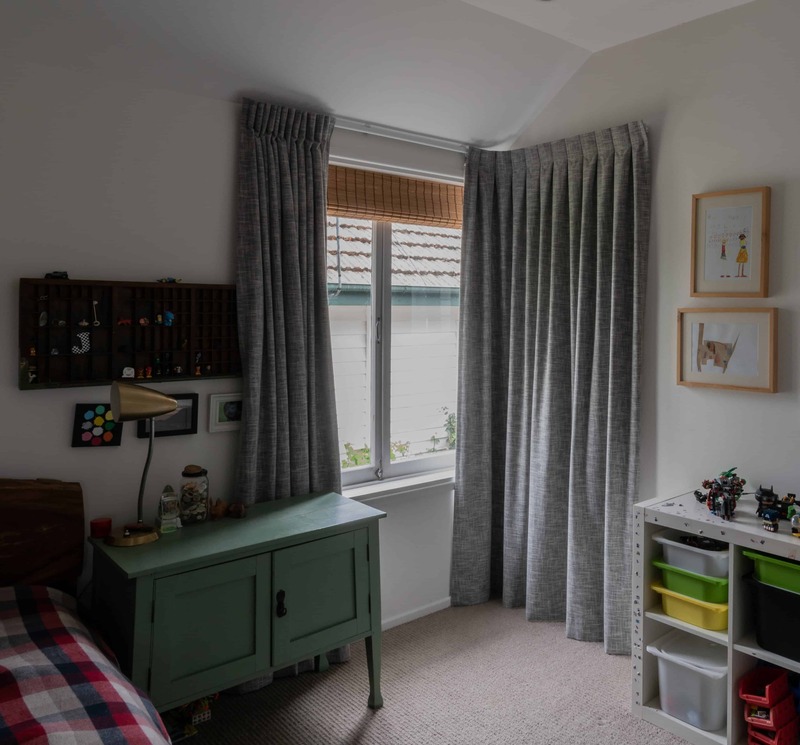 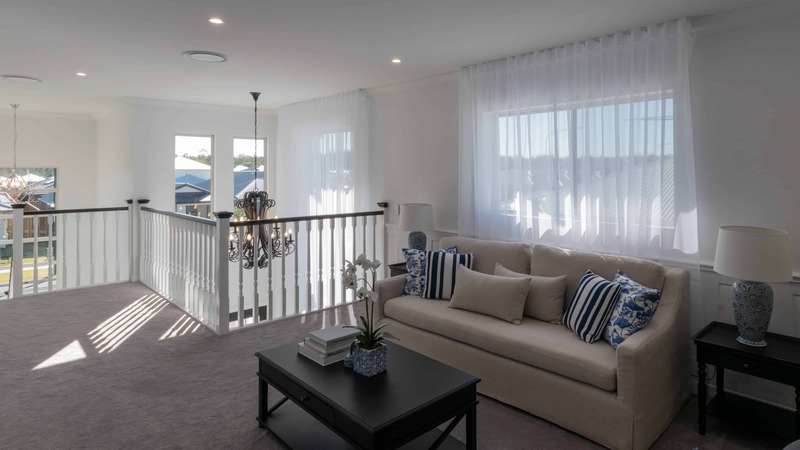 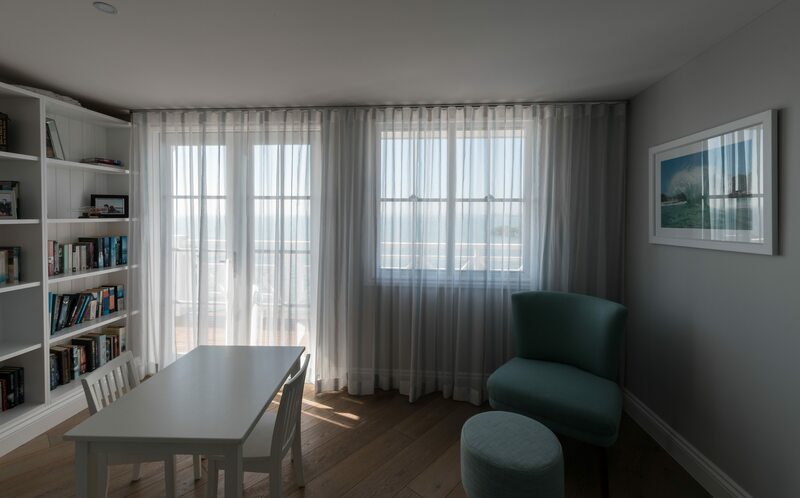 Pleated curtains on a standard track made from sheer with a detachable block out lining on french doors. 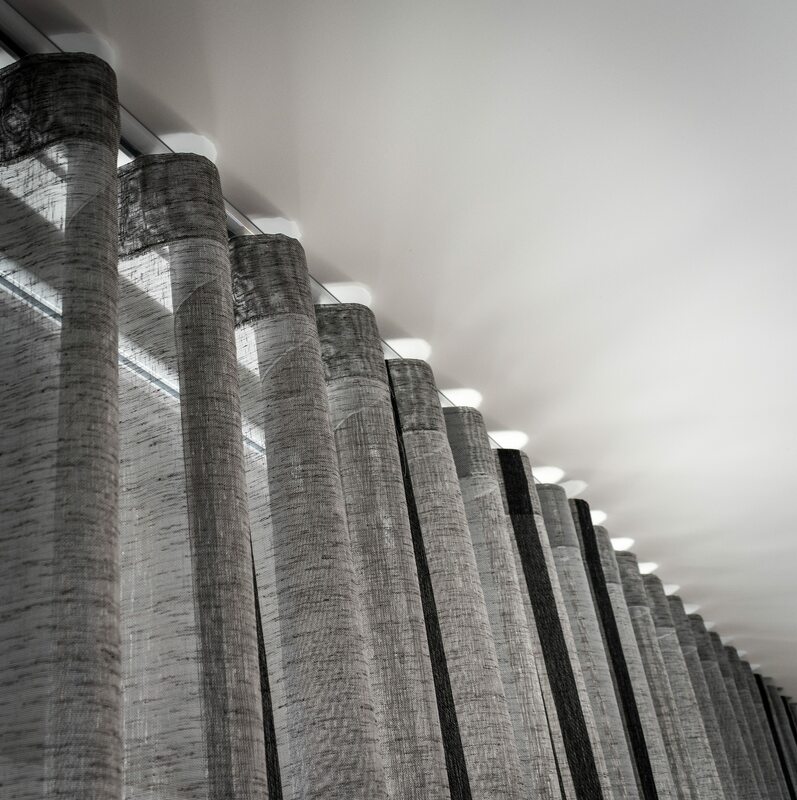 Three layers of triple weave and bumph used for noise reduction on an uninterrupted track. 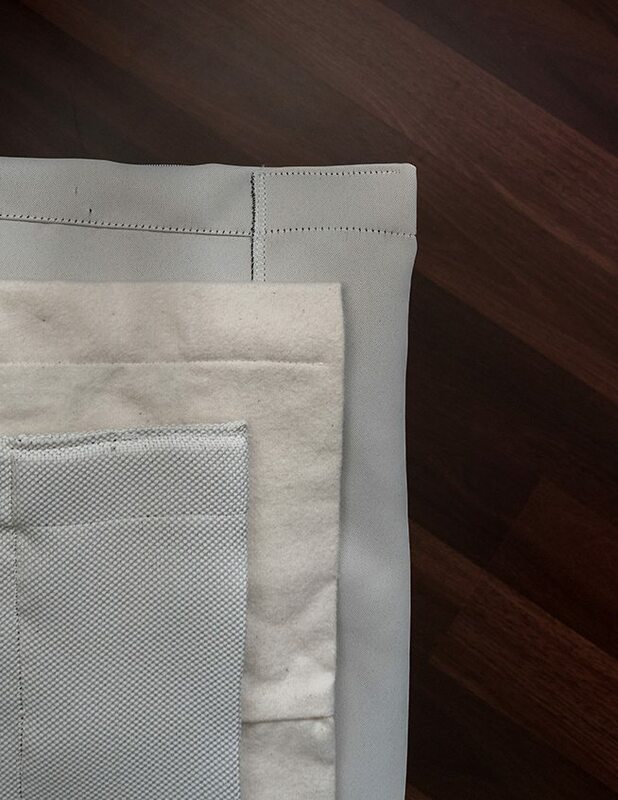 This shows a detachable lining with an extra layer of bumph used for sound reduction. 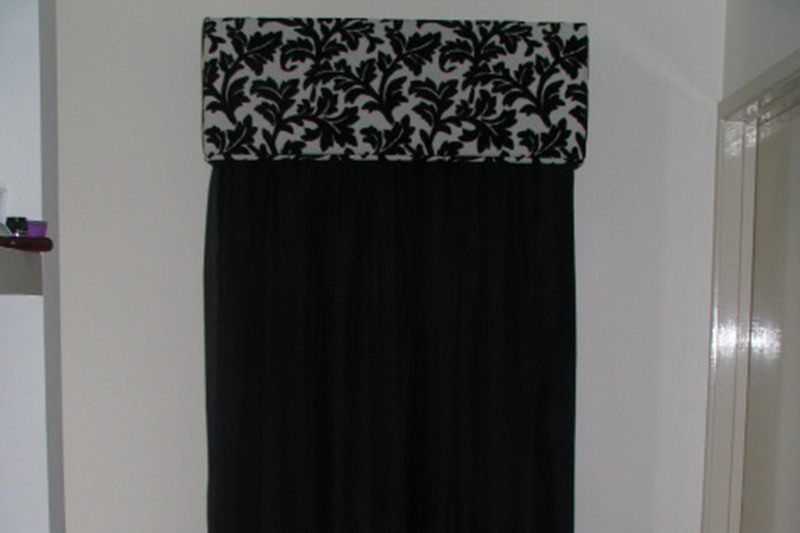 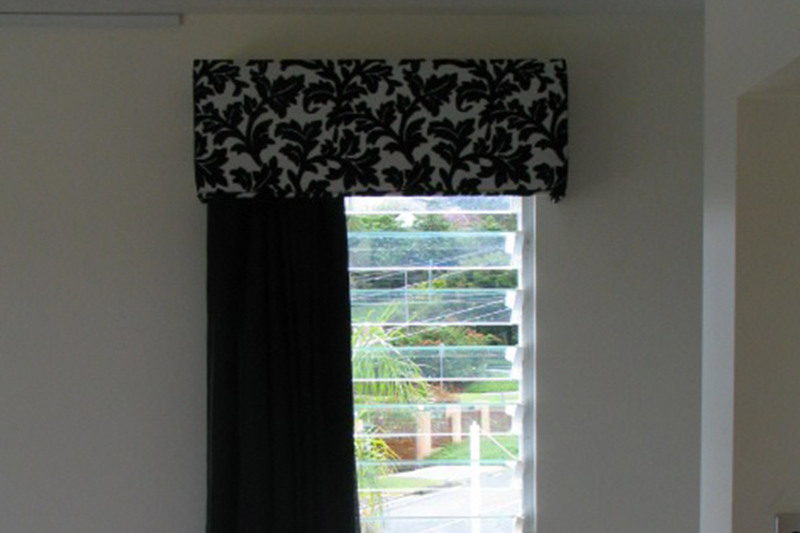 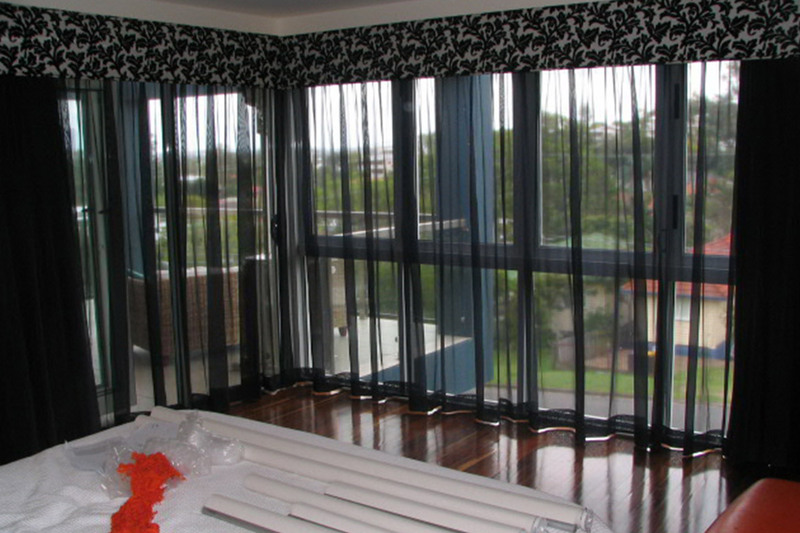 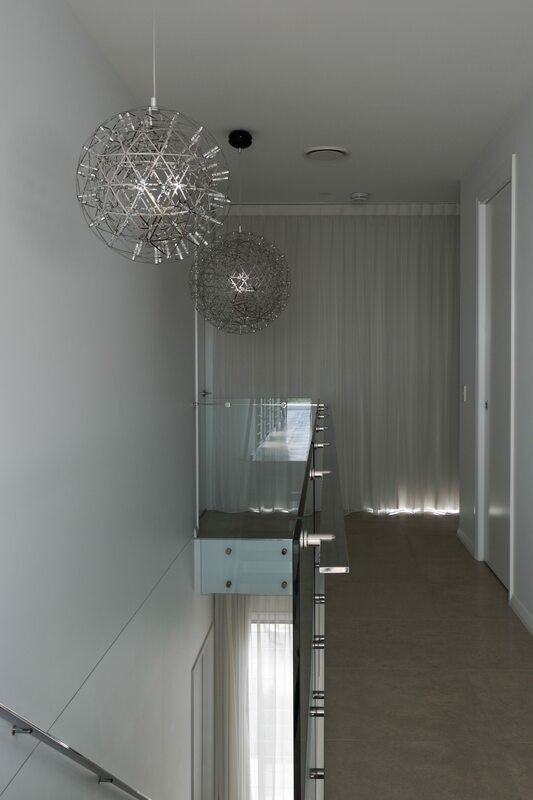 Contemporary pole with finials, this is a black clear sheer with a black block out lining behind. 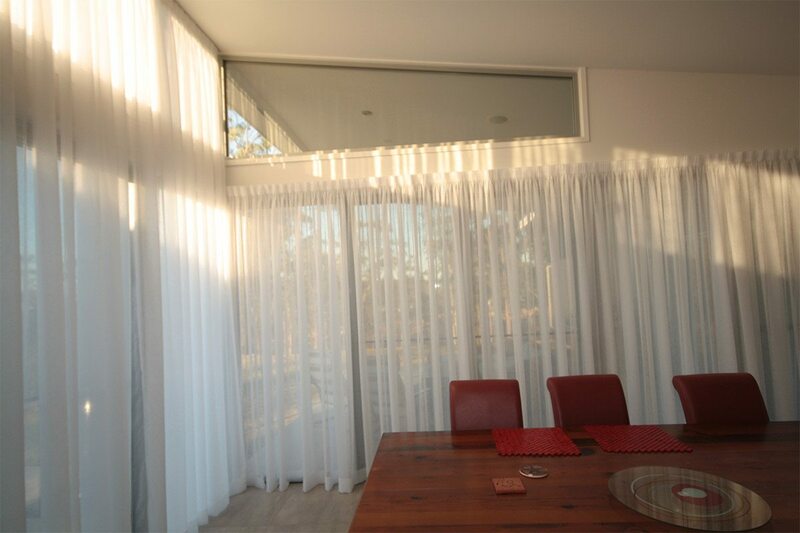 Sheer and lining have been taken out past the side of windows to allow maximum light. 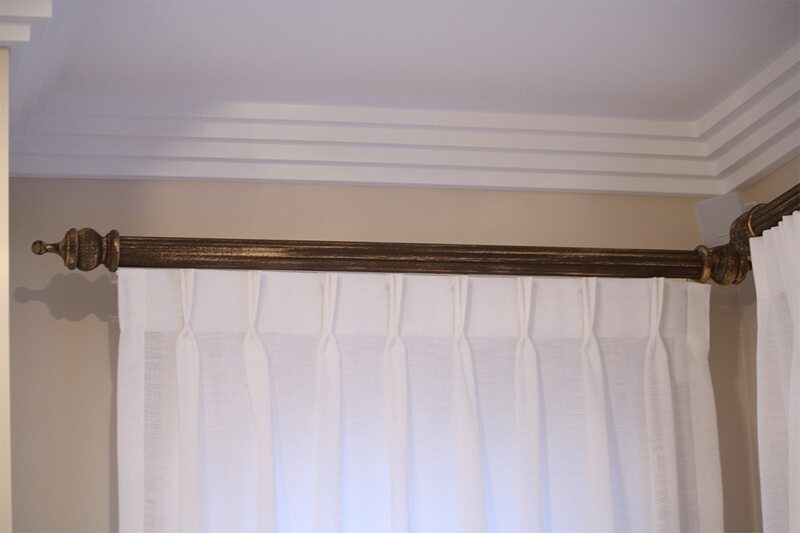 A Triple Pinch Pleat sheer installed from the ceiling on a small profile track with a shaped end to fit snug into cornice. 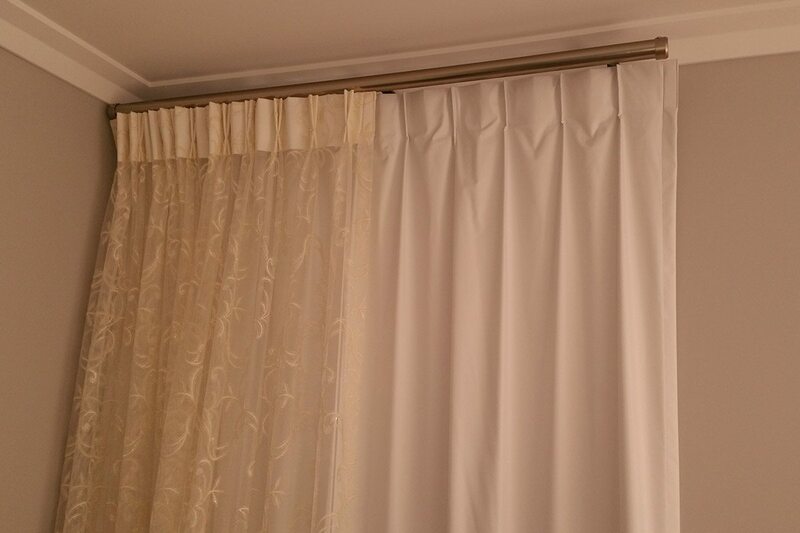 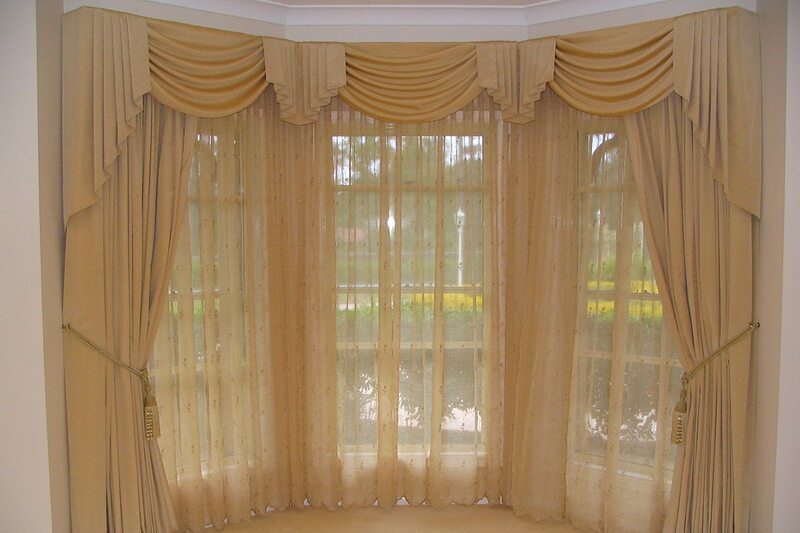 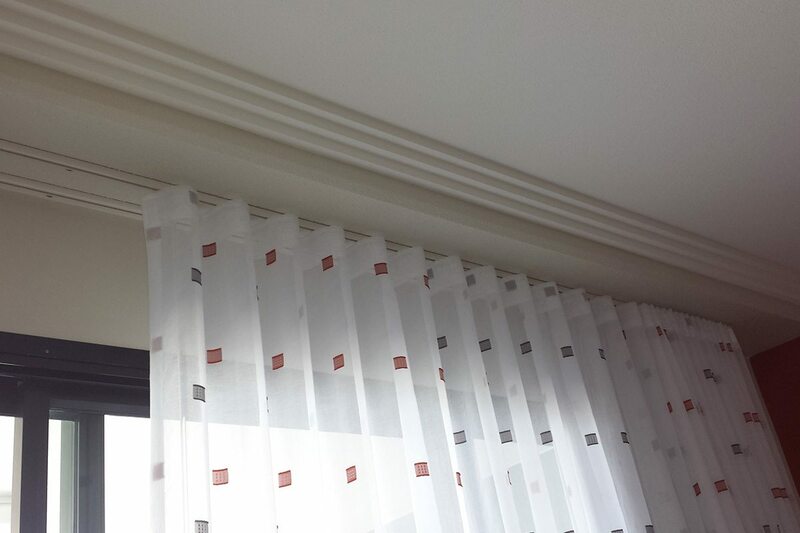 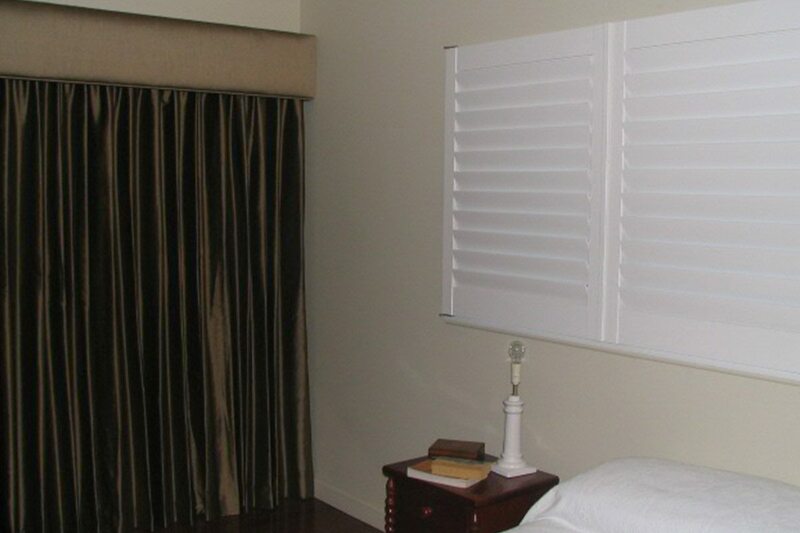 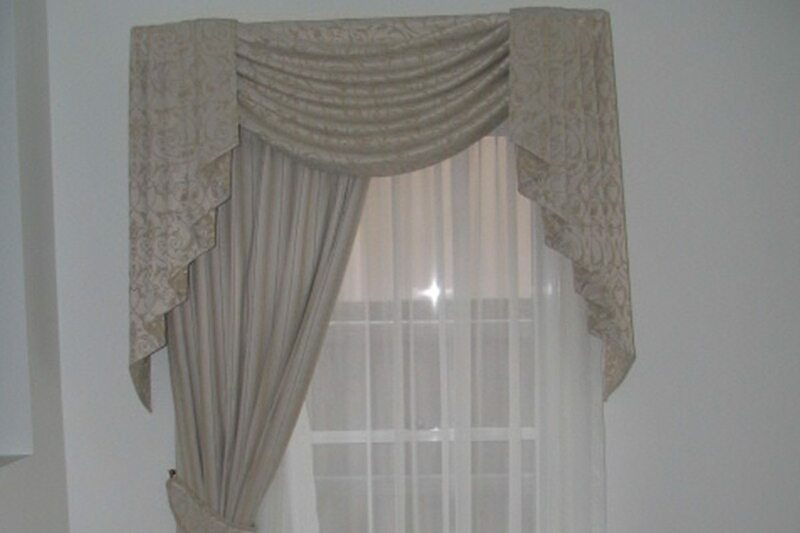 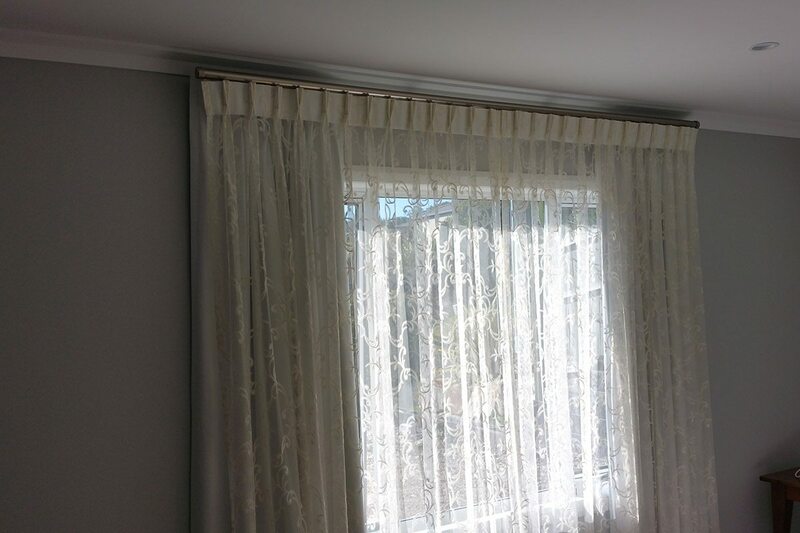 These are straight self piped pelmets with a short curtain to accommodate cabinetry along side of long curtains. 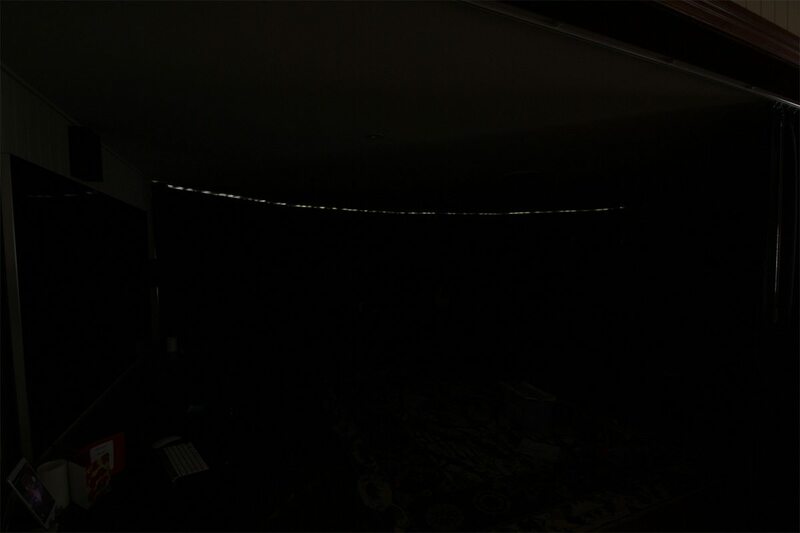 This will produce a cave like darkness when closed. 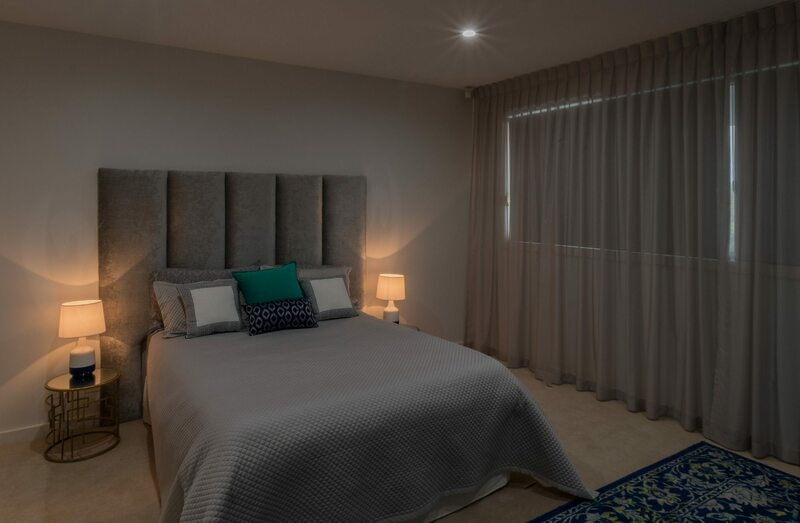 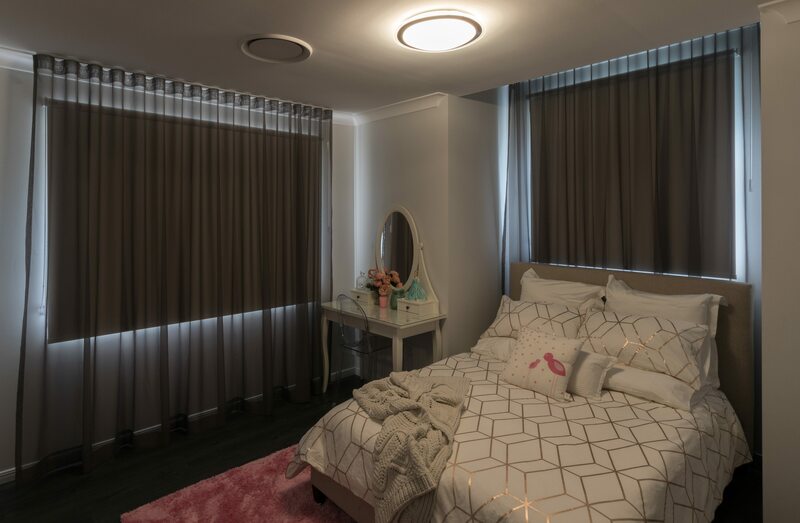 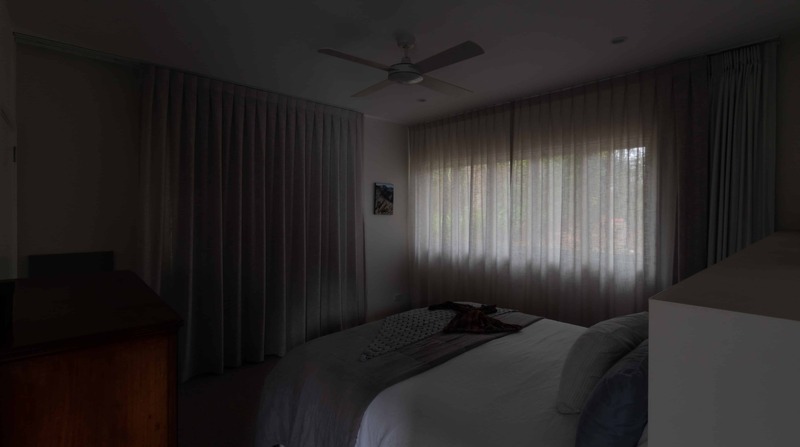 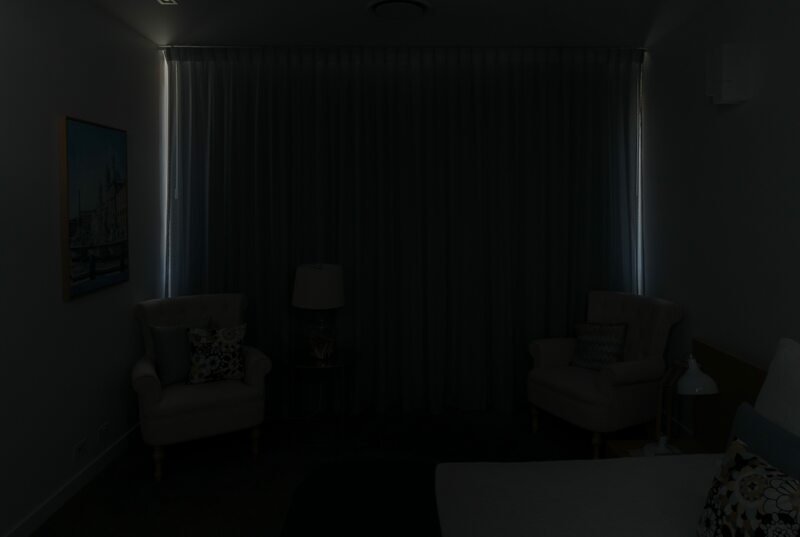 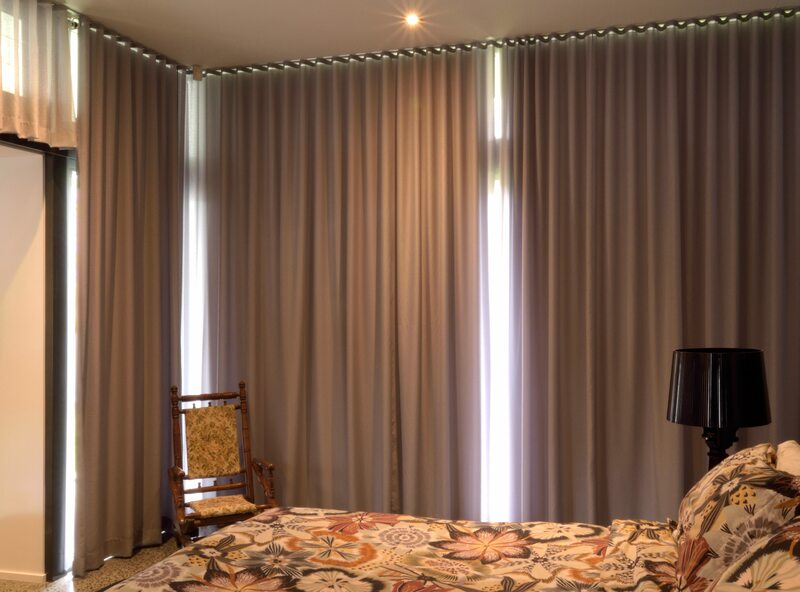 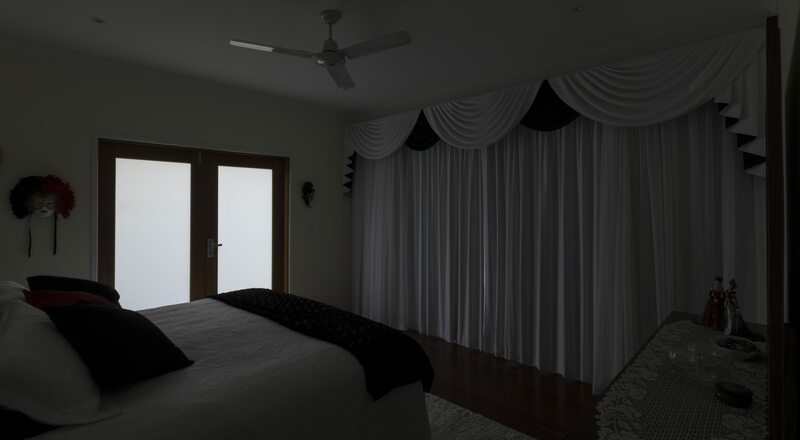 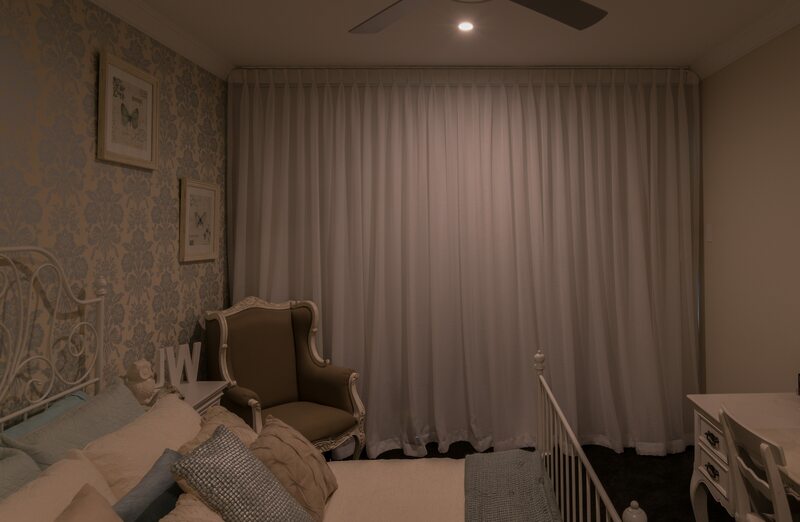 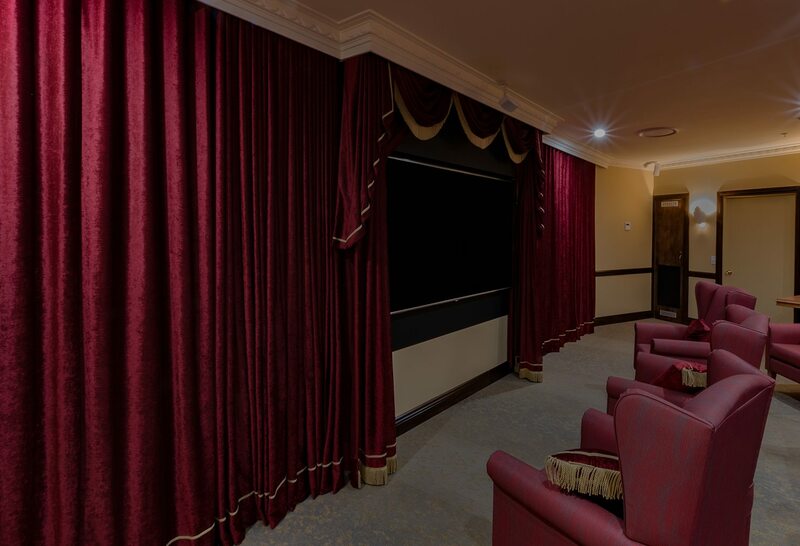 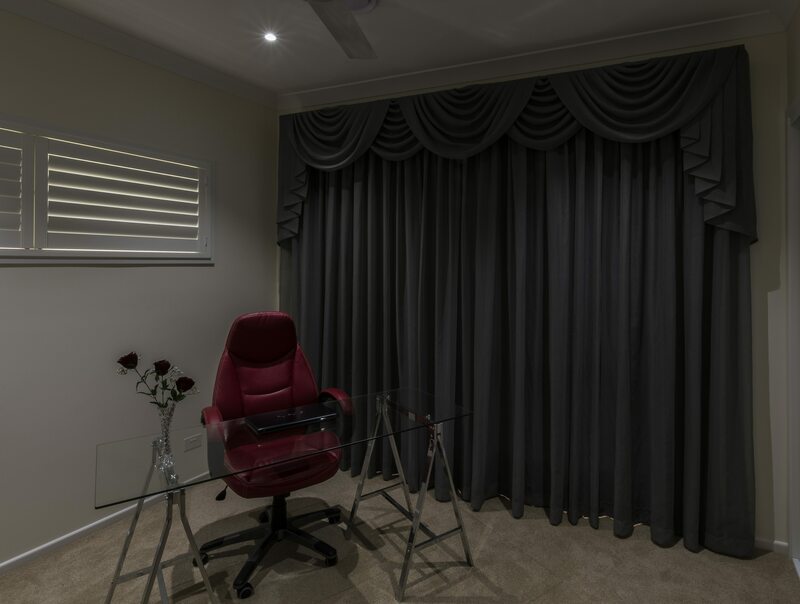 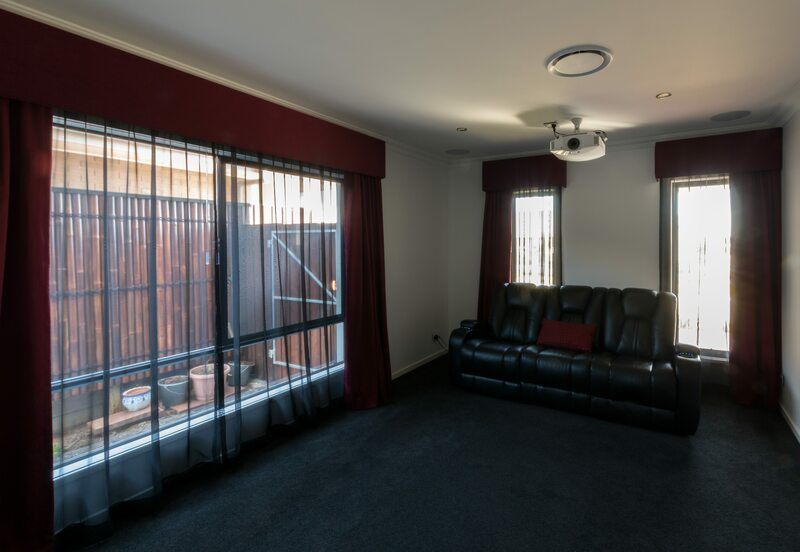 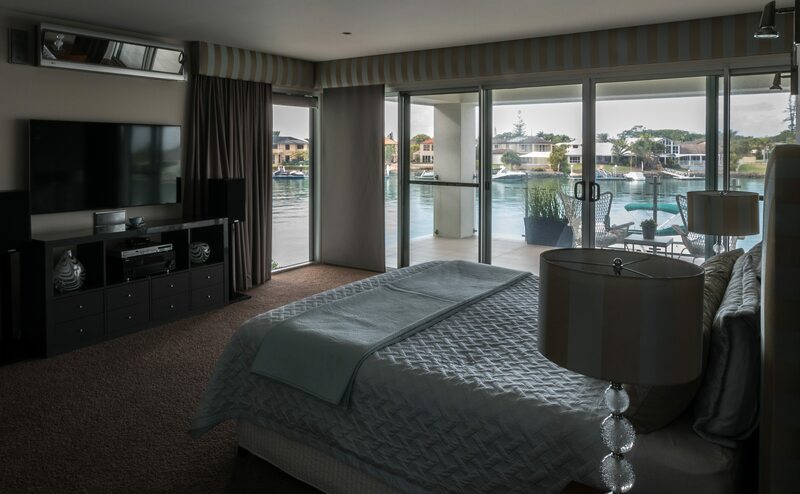 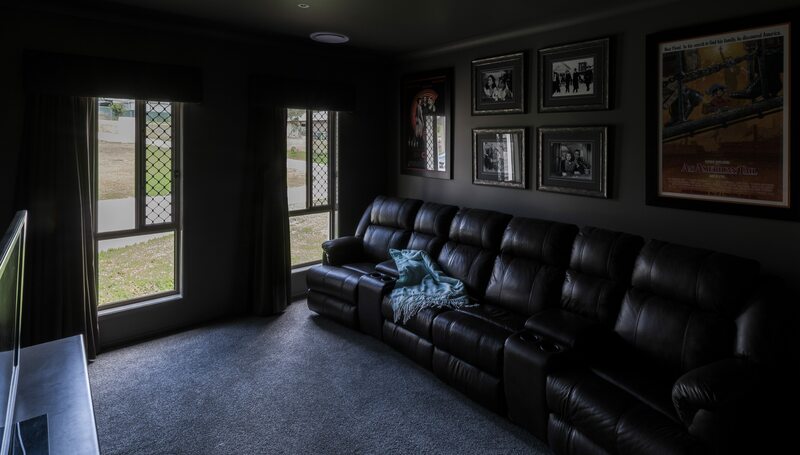 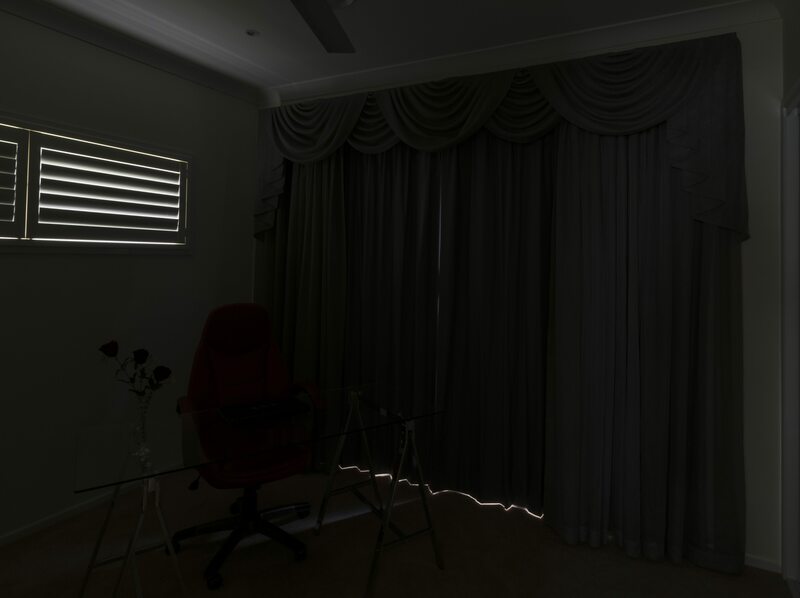 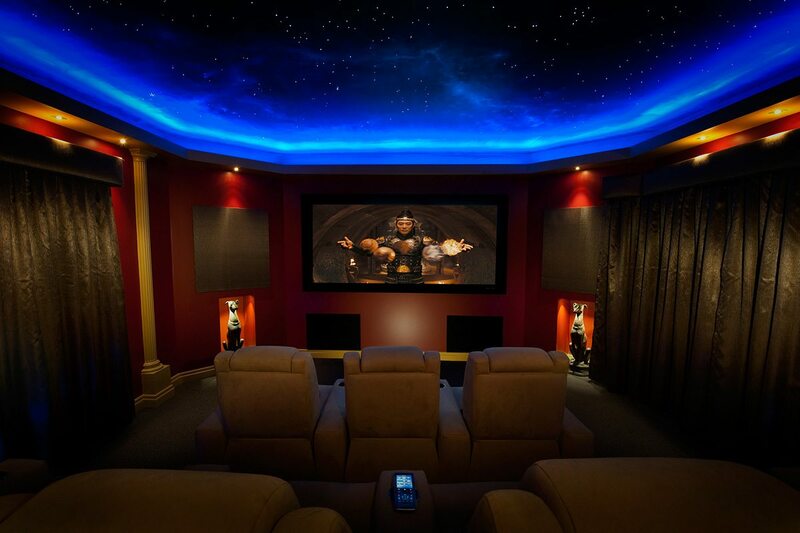 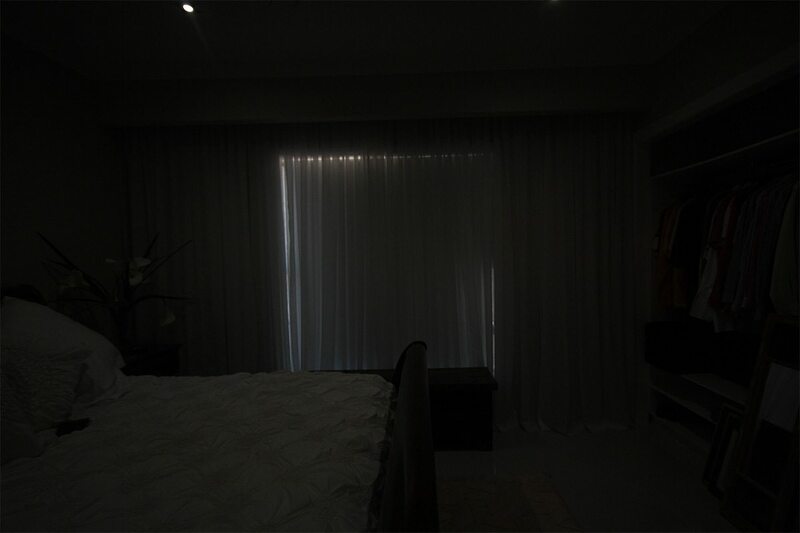 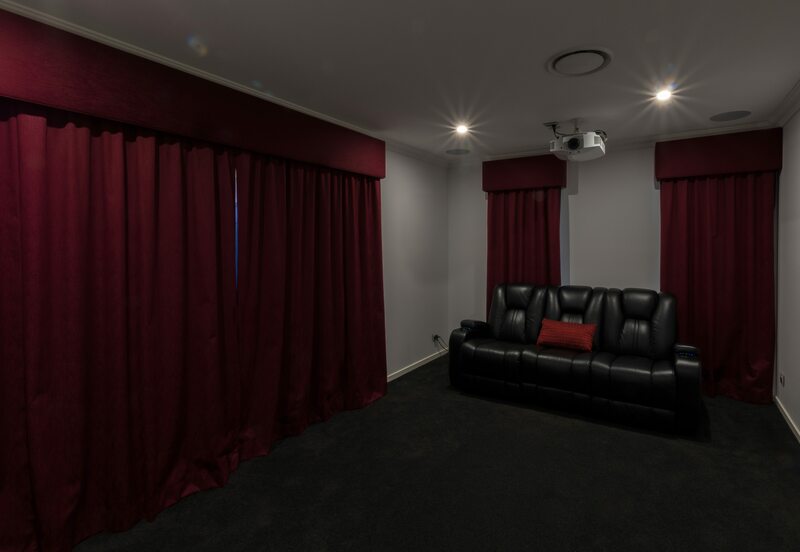 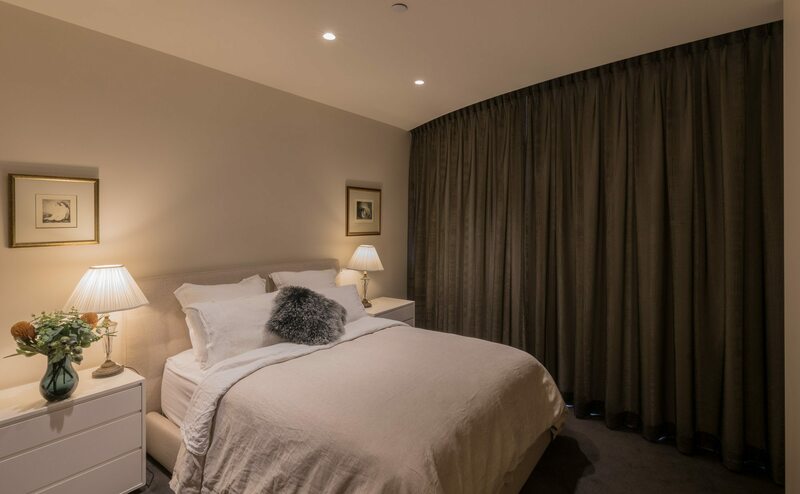 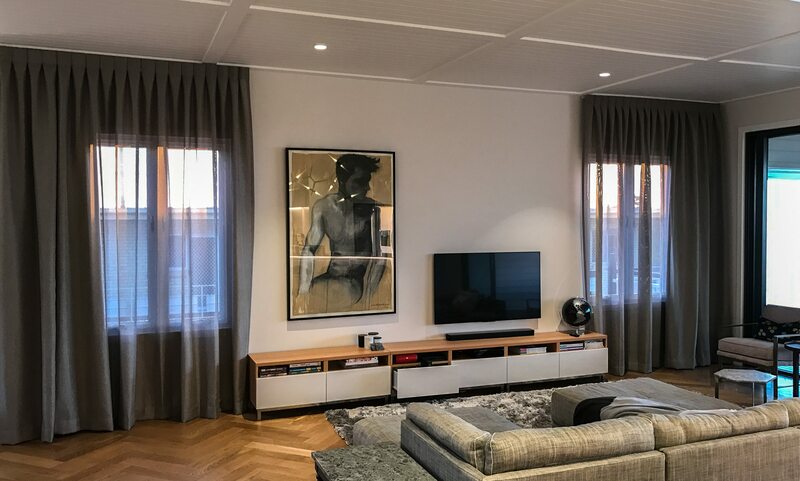 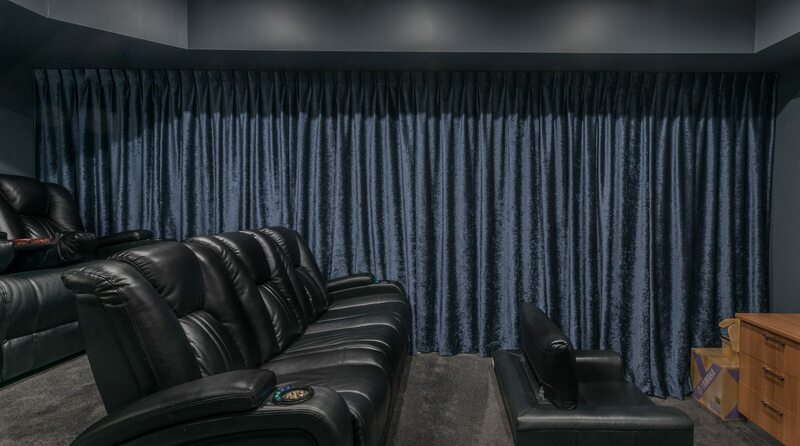 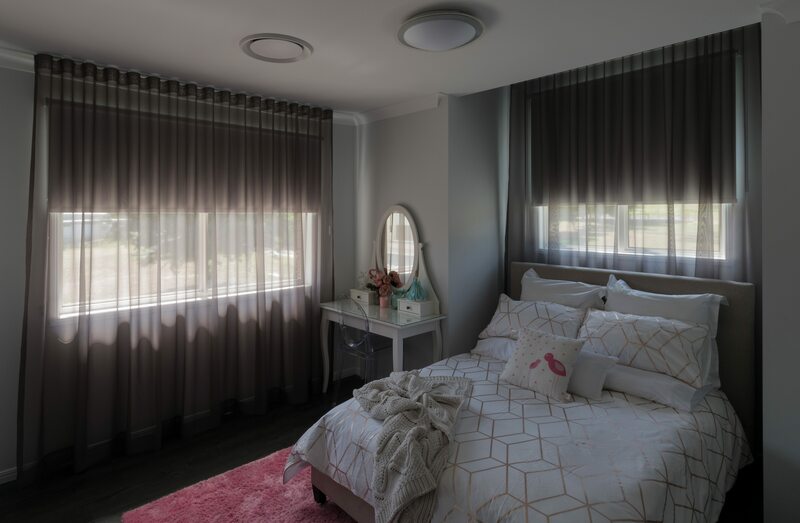 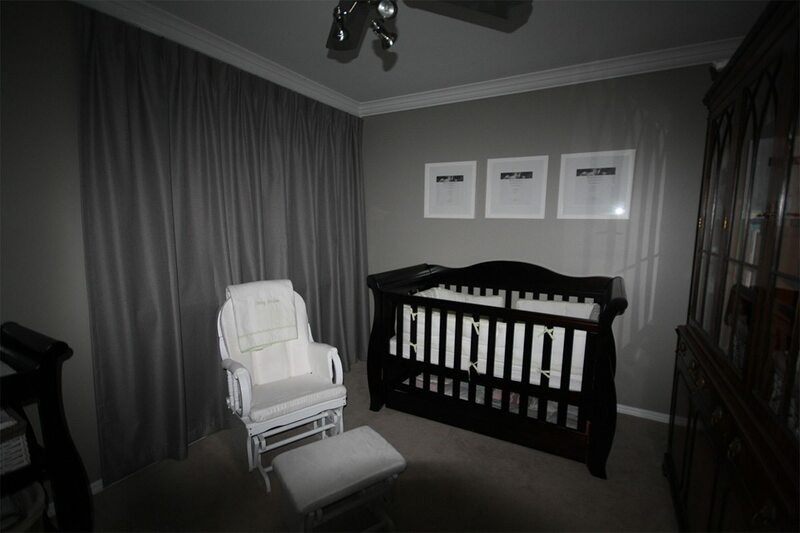 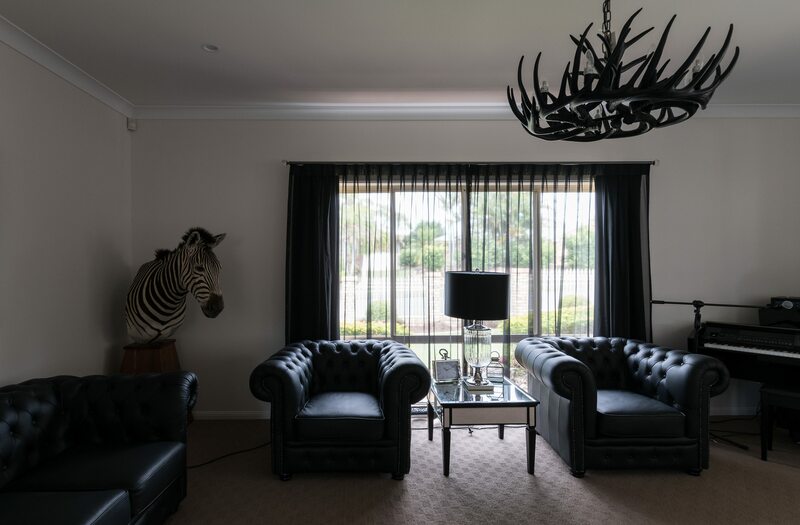 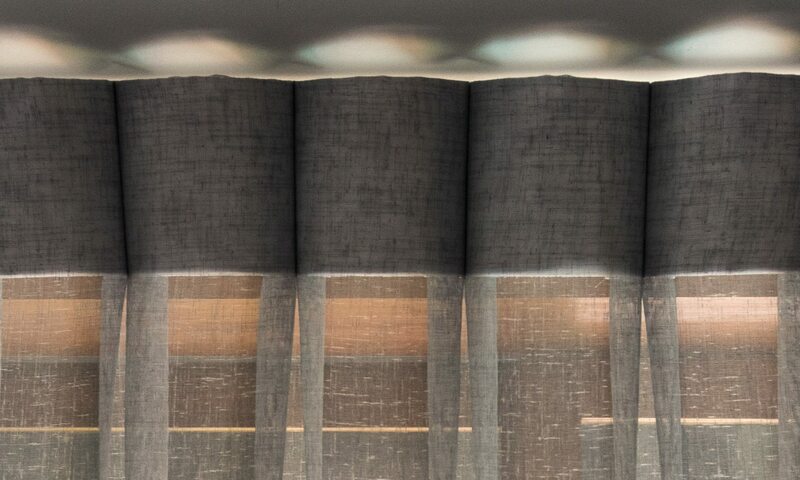 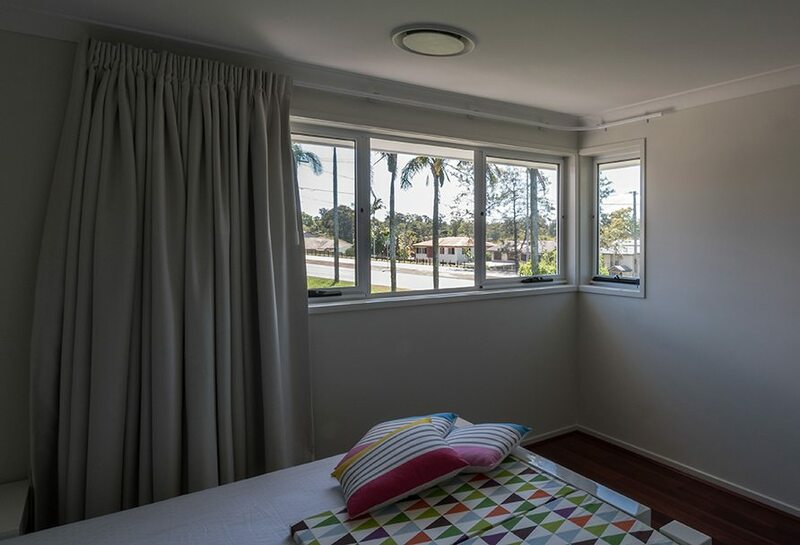 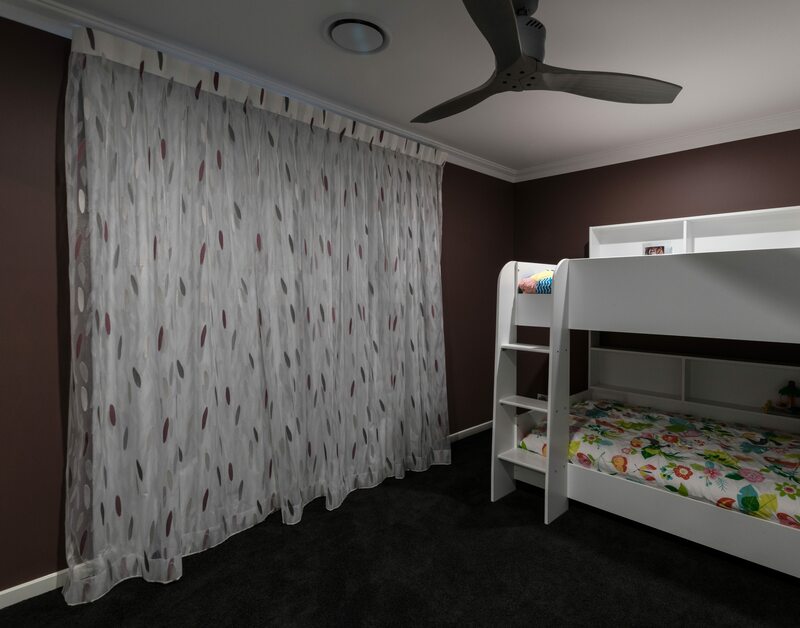 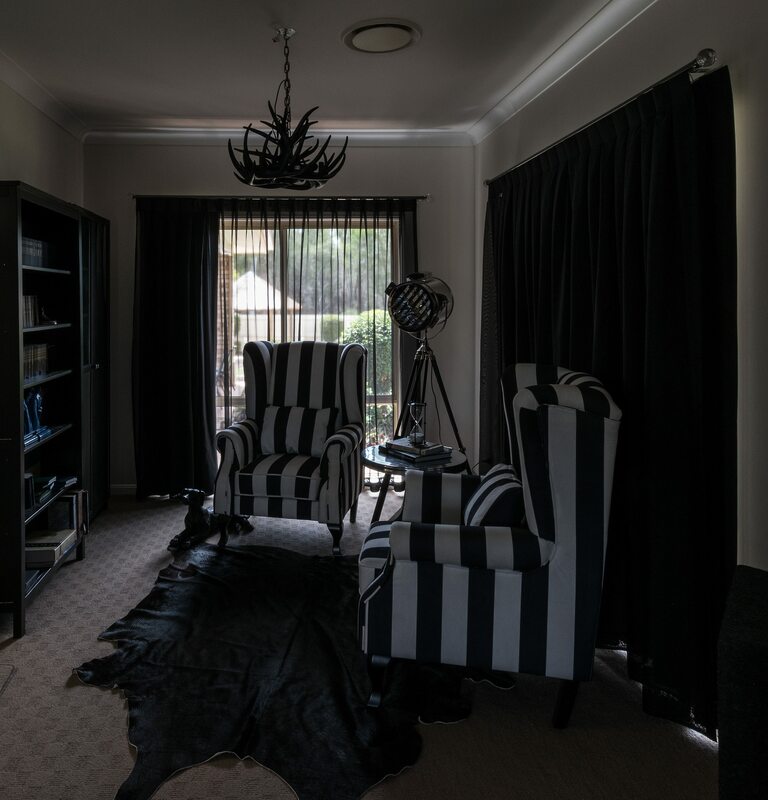 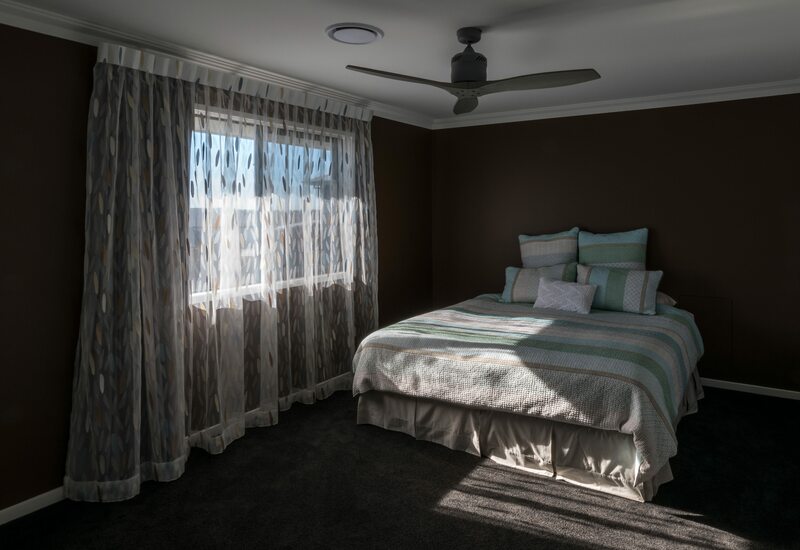 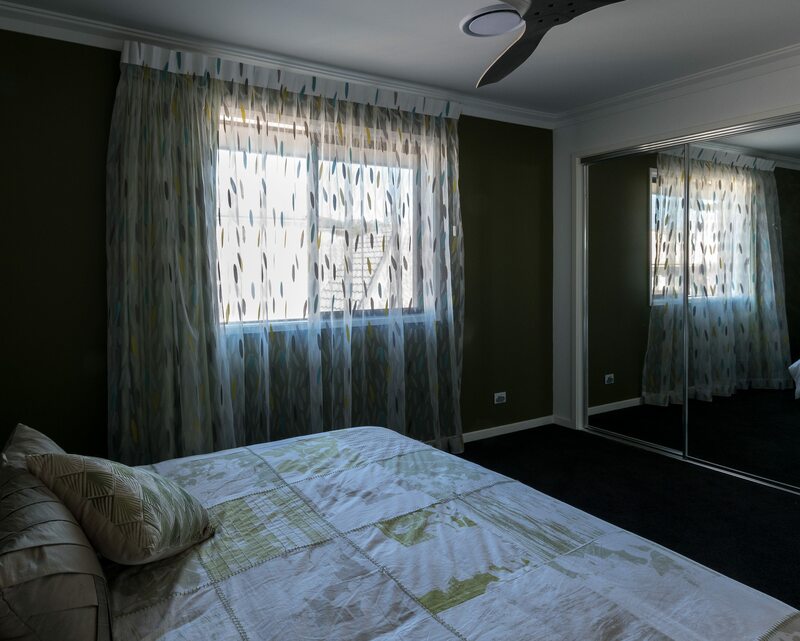 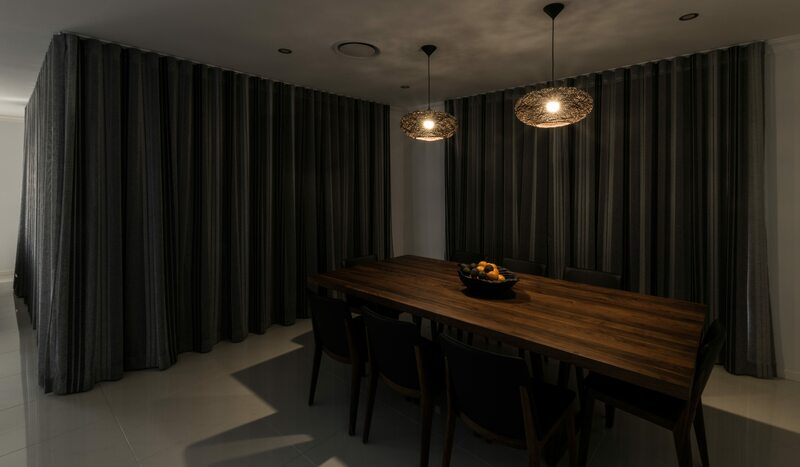 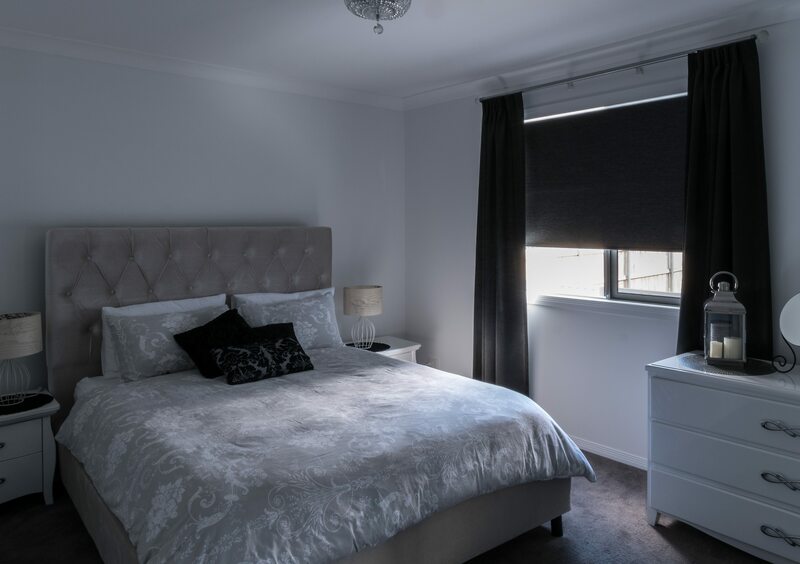 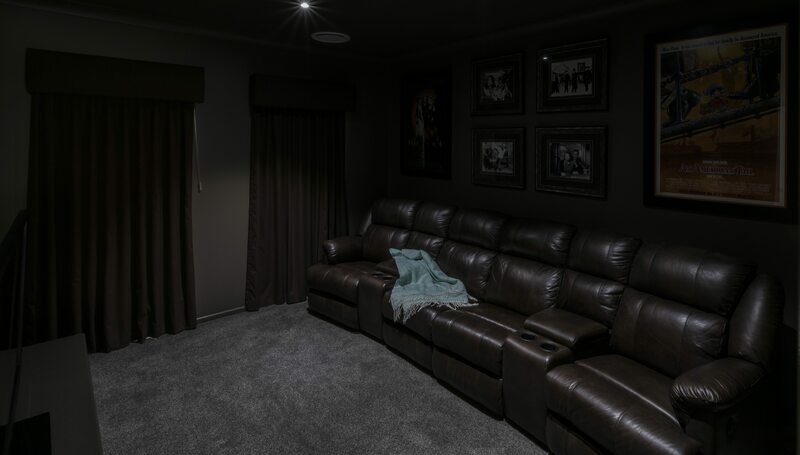 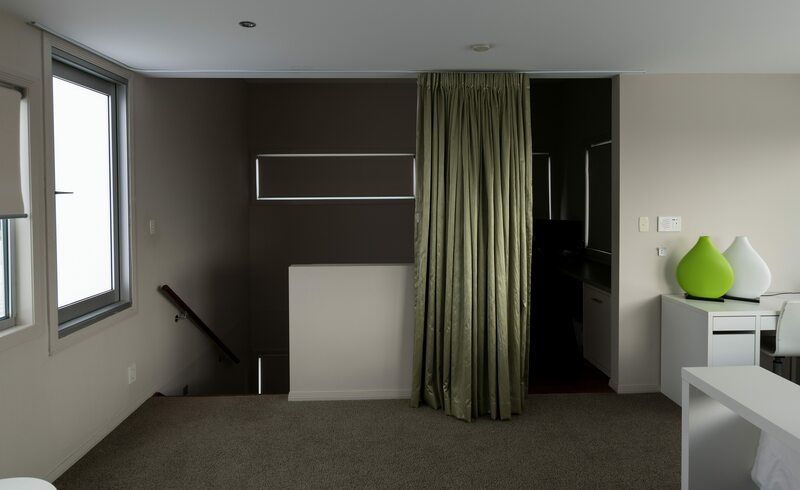 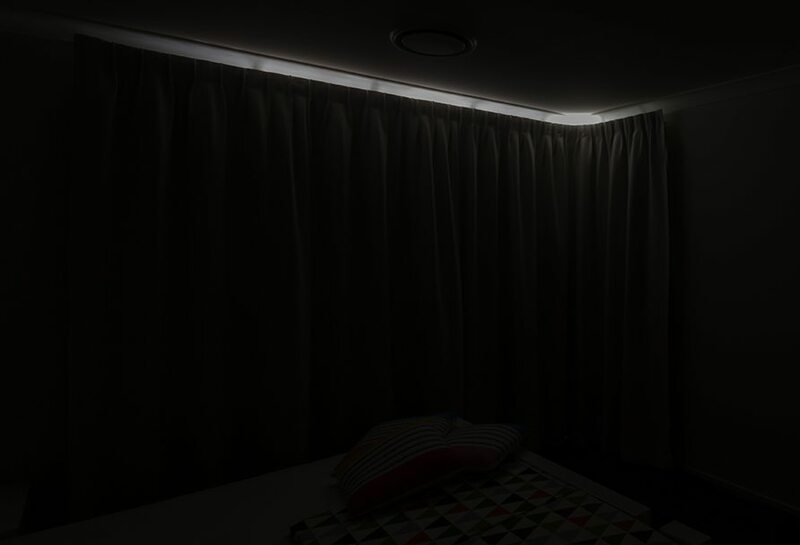 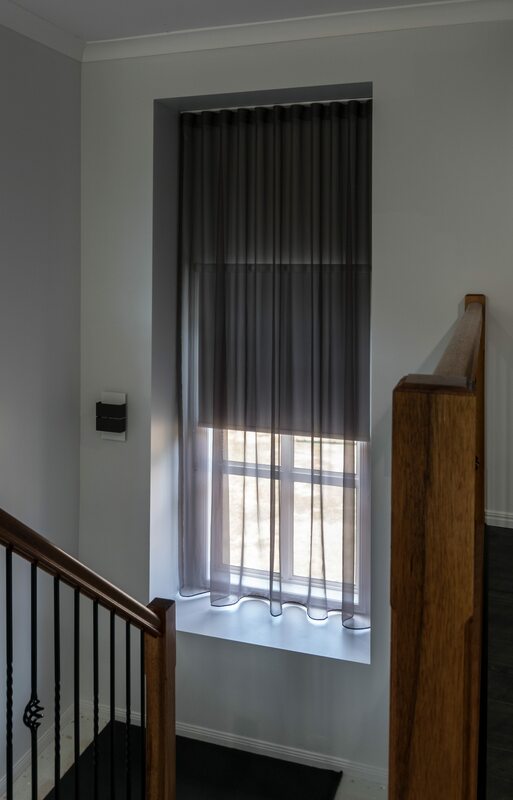 With the curtains closed, it will give a cave dark effect with the block out lined curtains directly under straight self piped pelmets. 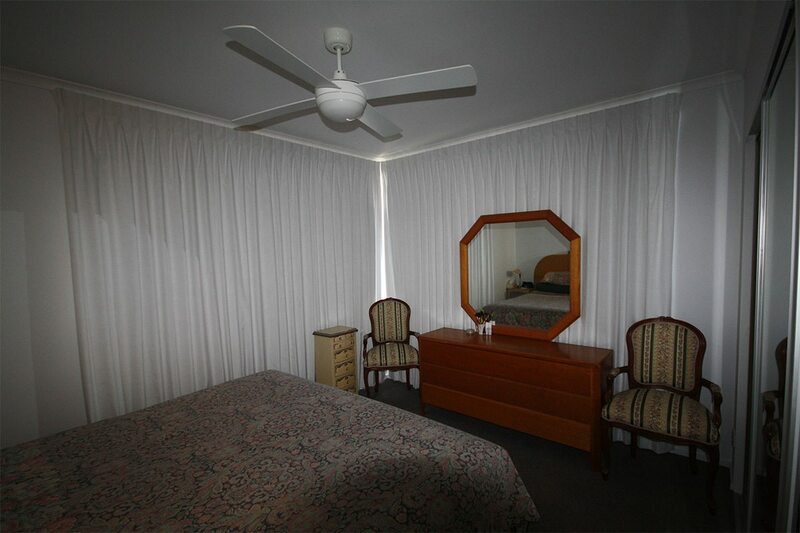 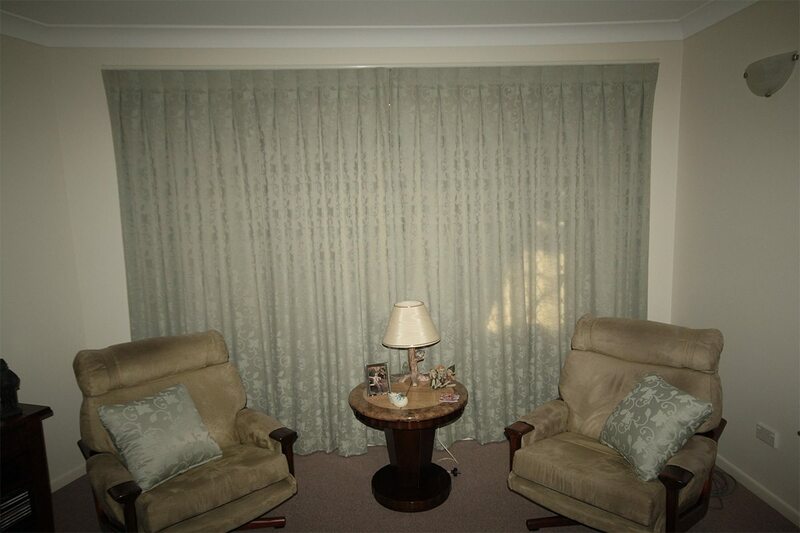 Long and short curtains half opened for your interest. 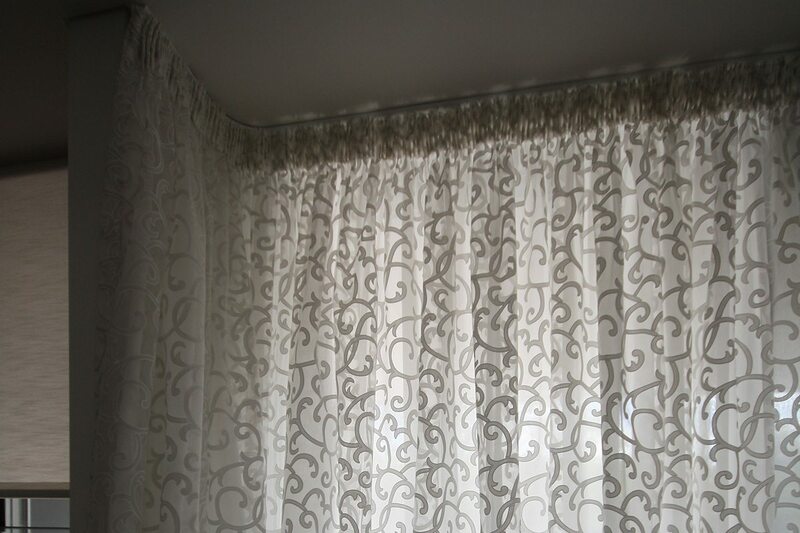 Wide pencil pleat sheer on a bent iron age pole with finials. 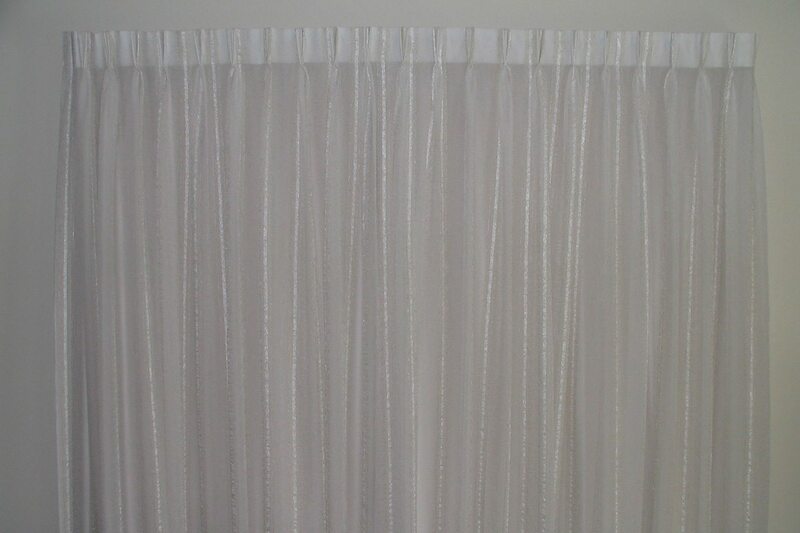 Double pinch pleat organza sheer, installed on a 35 mm chrome pole with flat end caps. 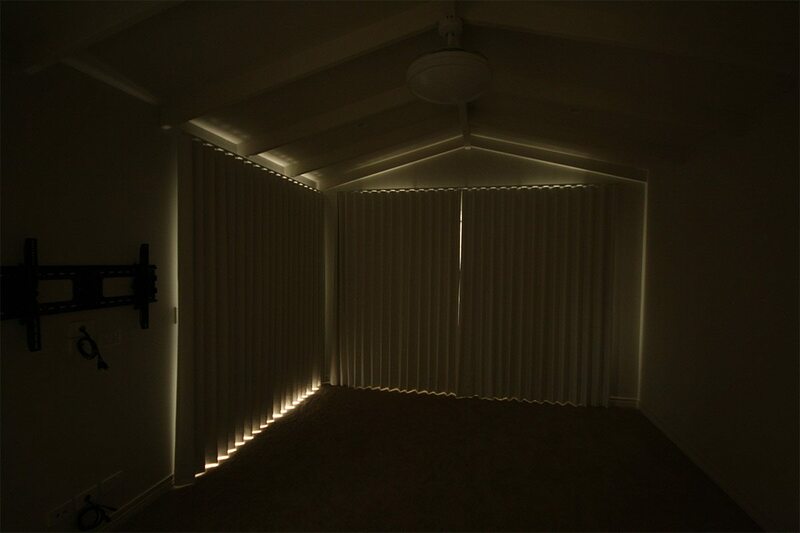 There are block out linings on a seperrate track behind. 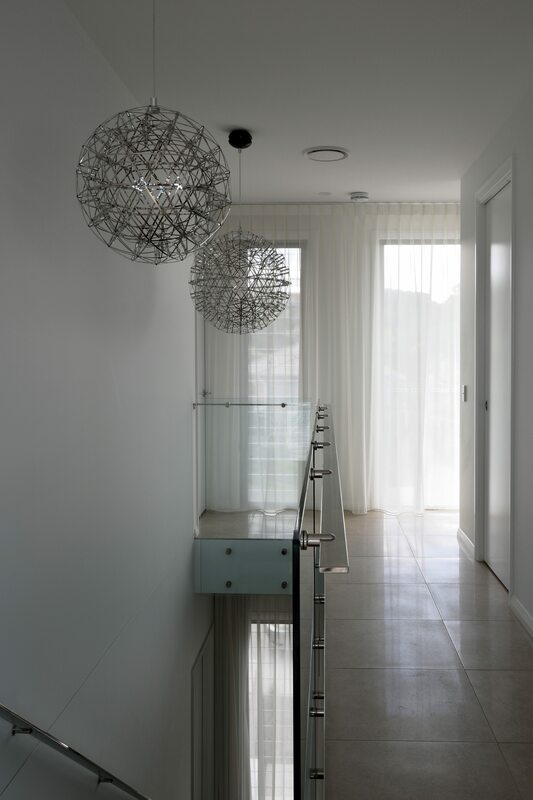 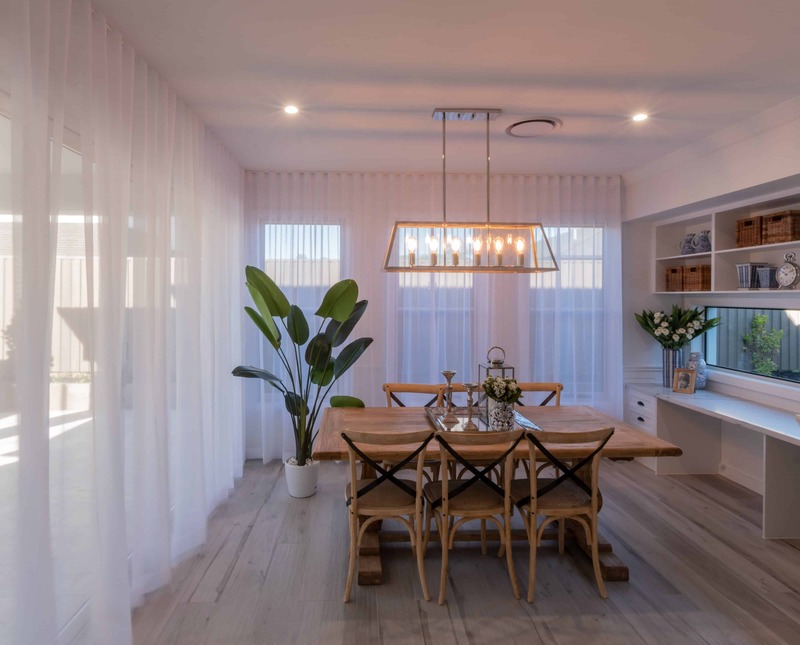 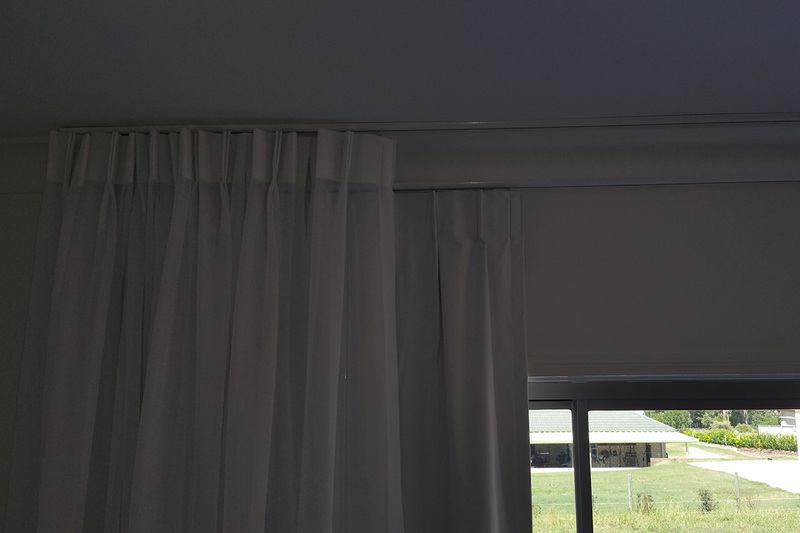 Timber poles with finials, inverted pleat sheer center open with a block out lining on a seperate track. 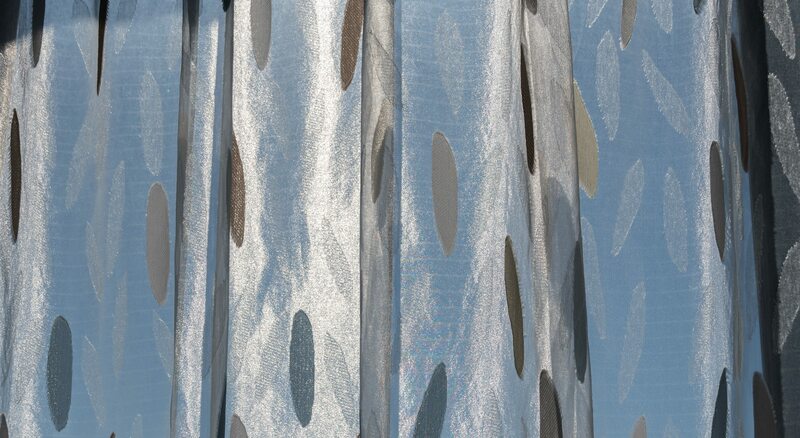 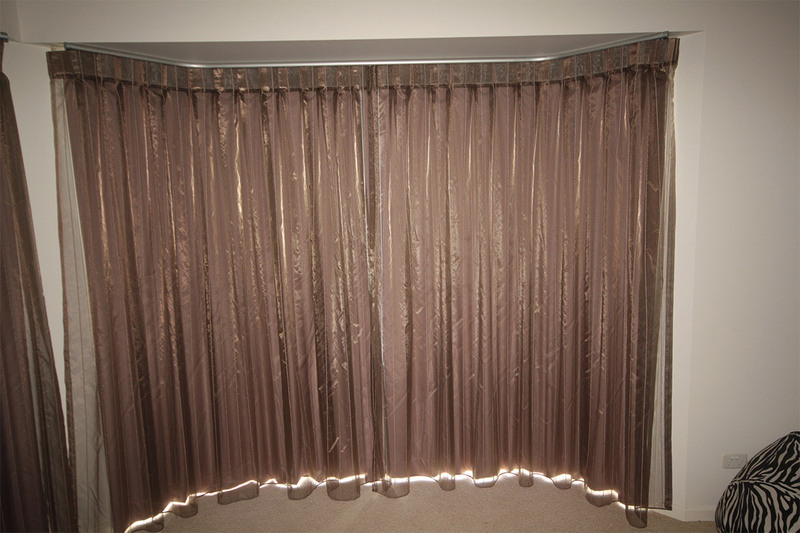 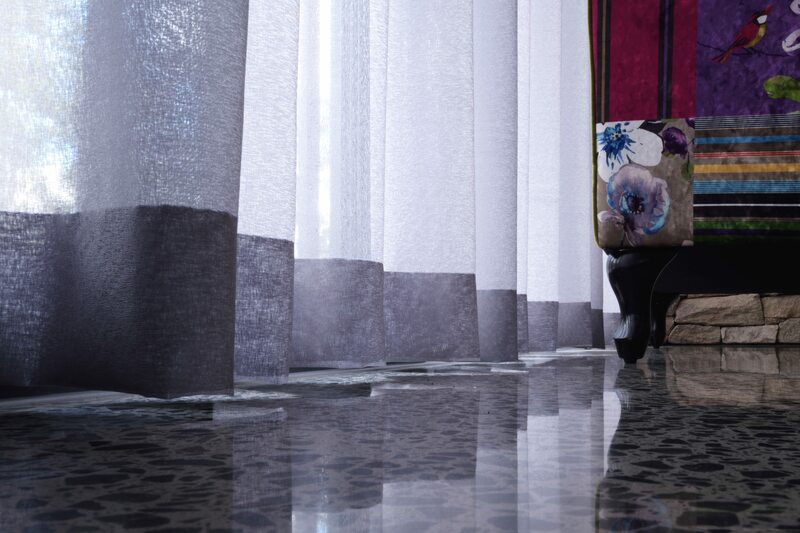 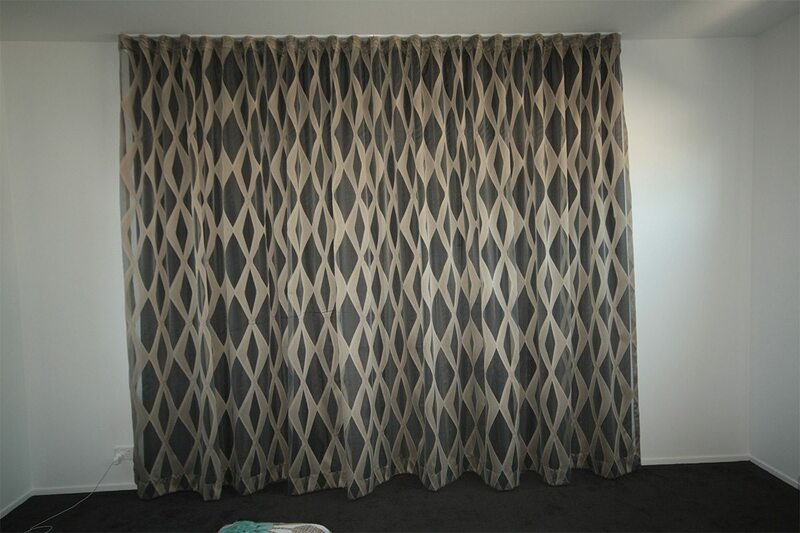 inverted pleat curtain with detachable block out lining on a Iron age satin chrome pole with finials pulling one way. 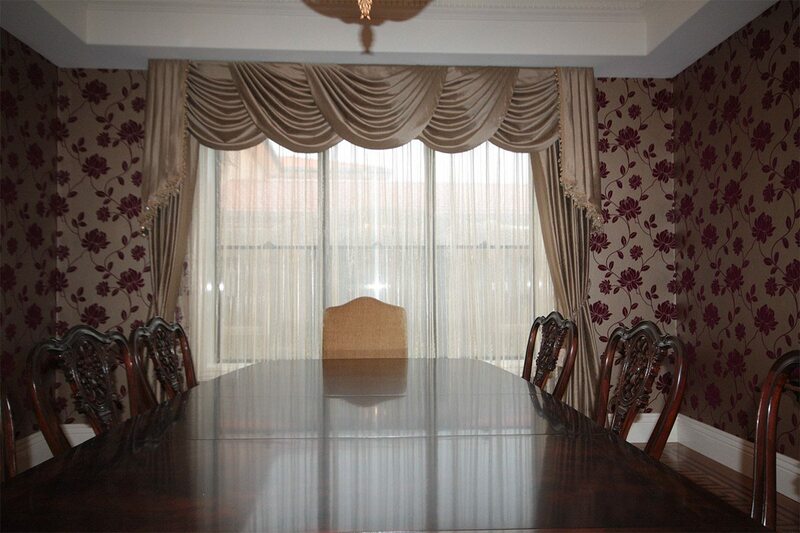 Designer Oliver poles with ornate finials, cartridge pleat curtains with a pencil pleat sheer behind. 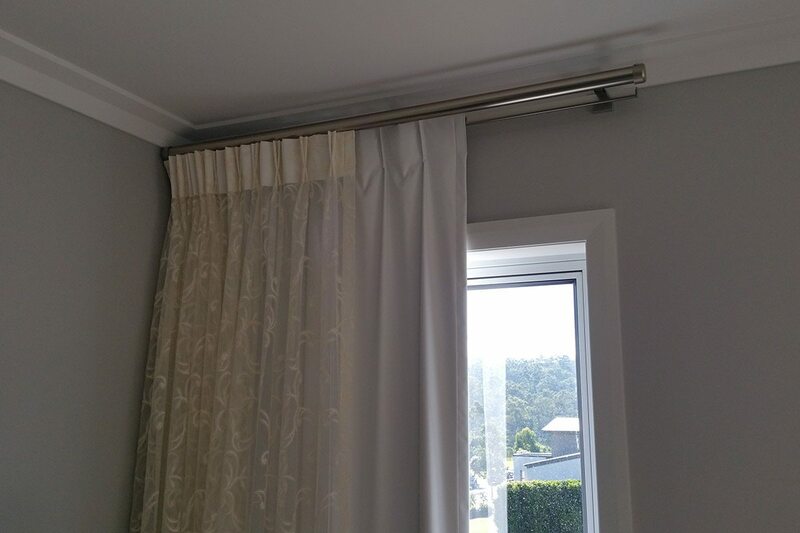 Poles with S fold block out curtains closed. This shows the amount of light weep. 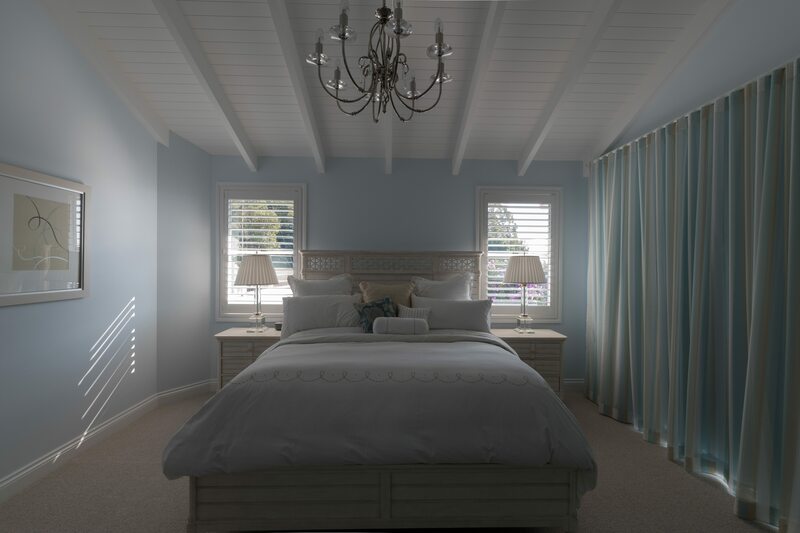 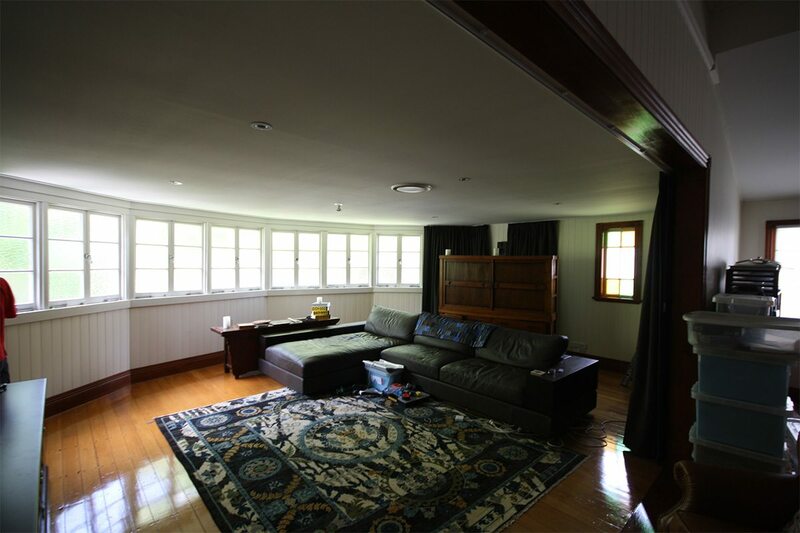 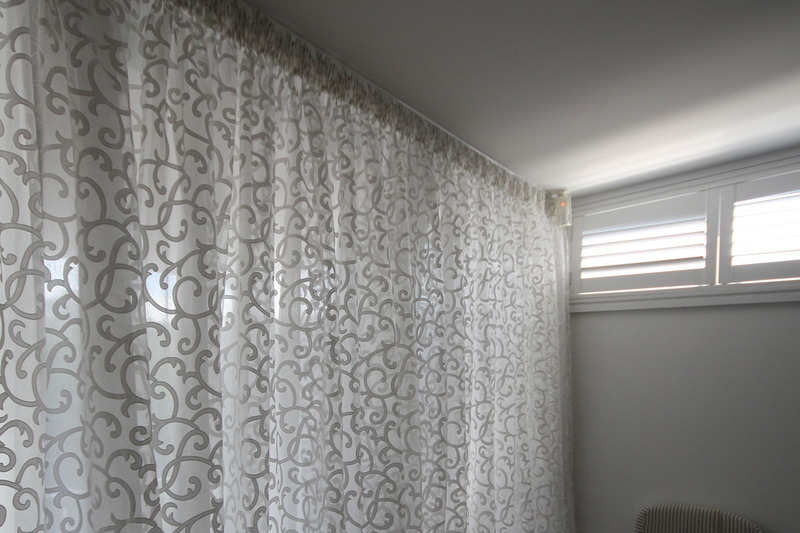 light weep from a budget block out curtain installed under cornice, well past glass opening. 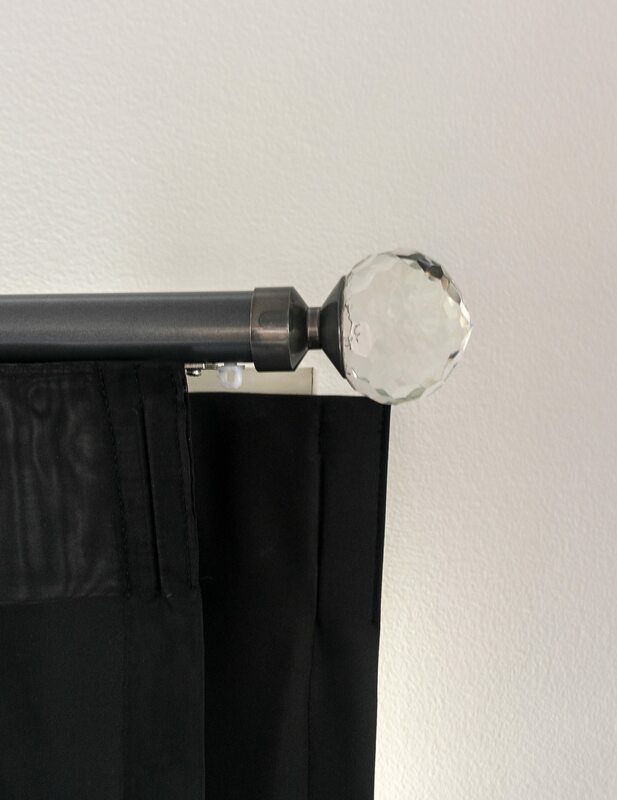 Nickle decorator pole with flat end caps and a track behind. 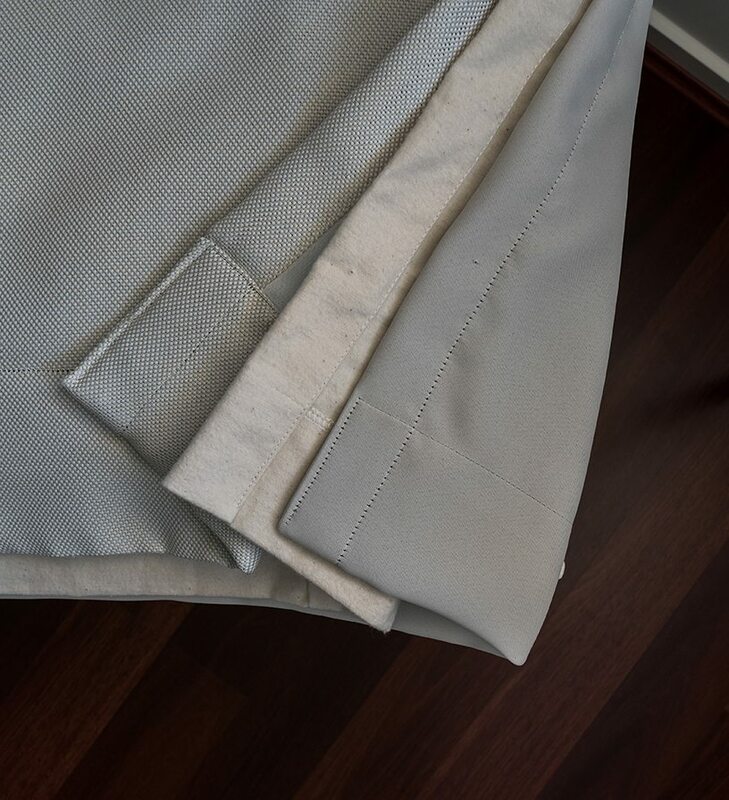 The block out lining has a single pinch pleat and there is a lace on the front track with a double pinch pleat all pulling one way. 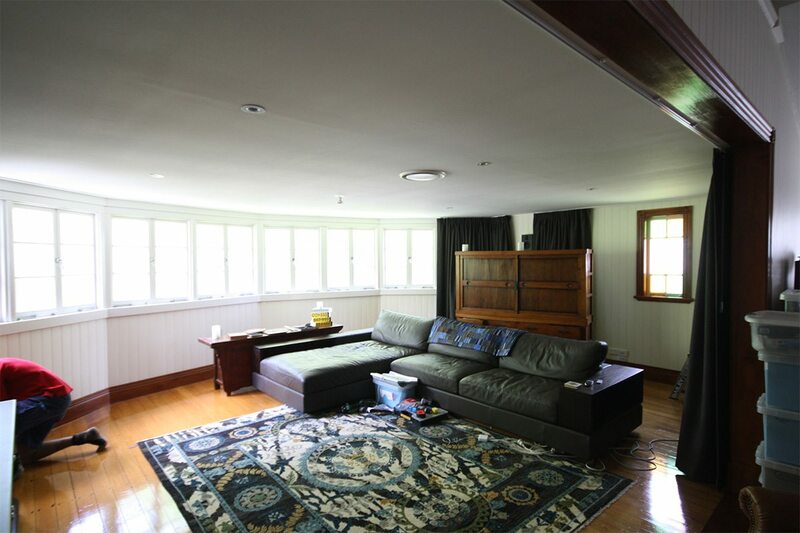 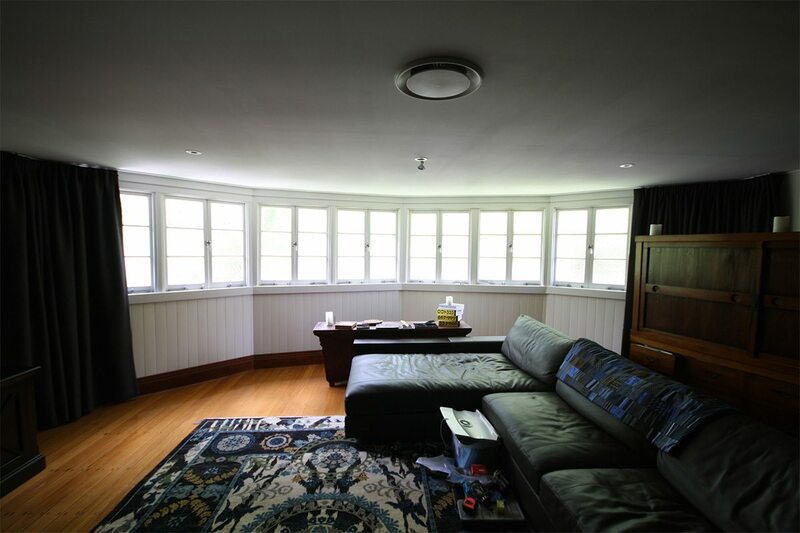 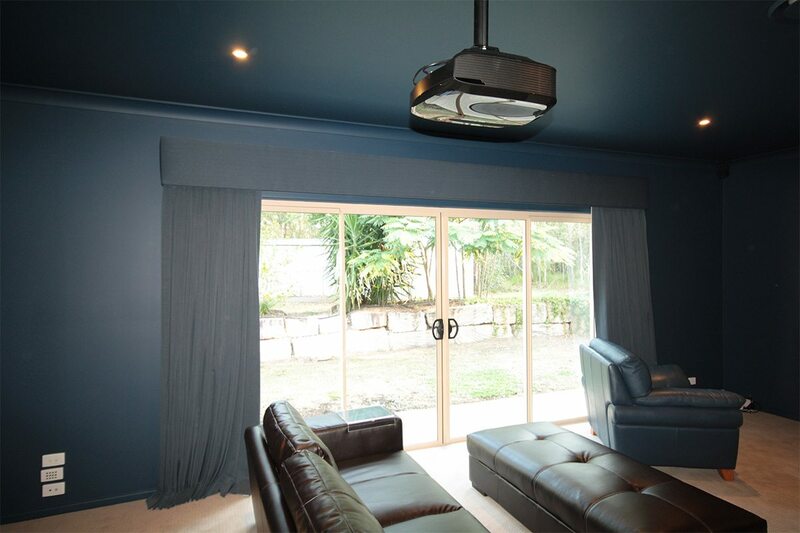 Wide windows with inverted pleat sheer installed under the cornice on a series 79 track. 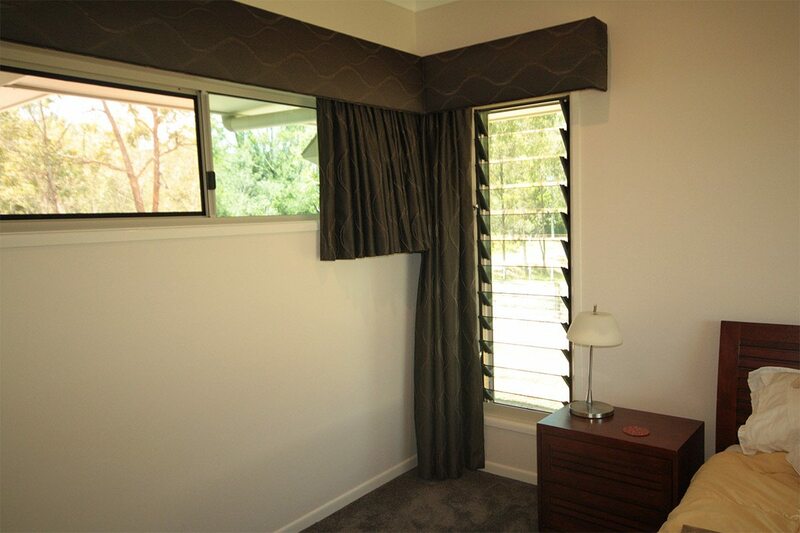 Corner windows with a ceiling installed S fold sheer with a block out lining behind. 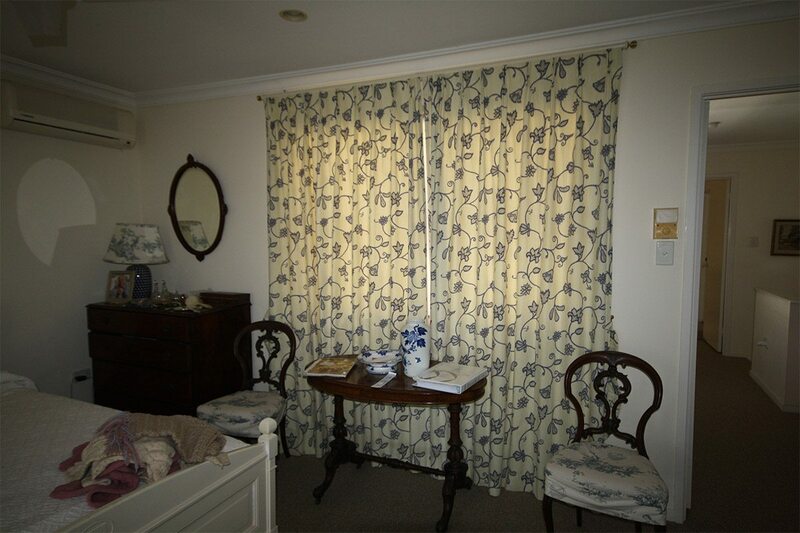 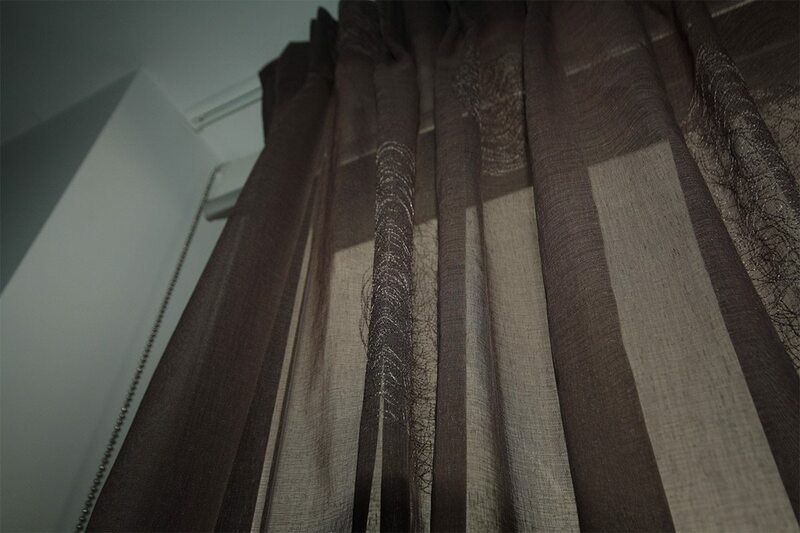 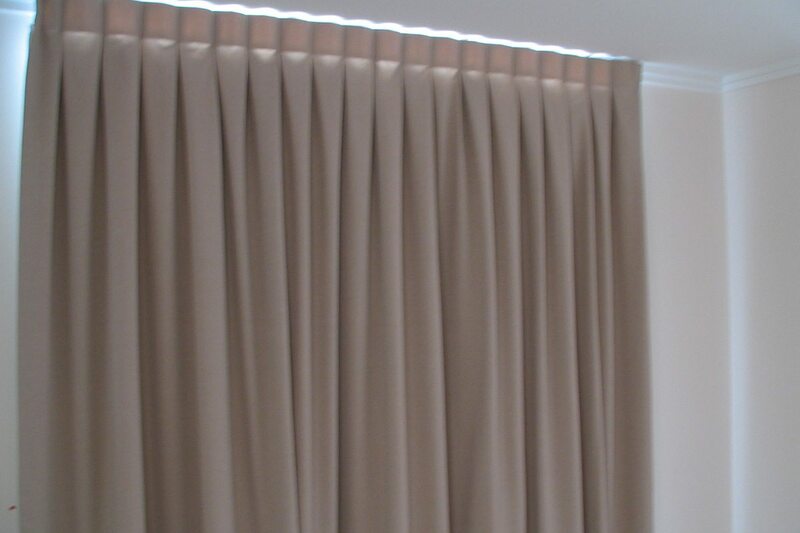 This is a roman blind with curtains in the same space. 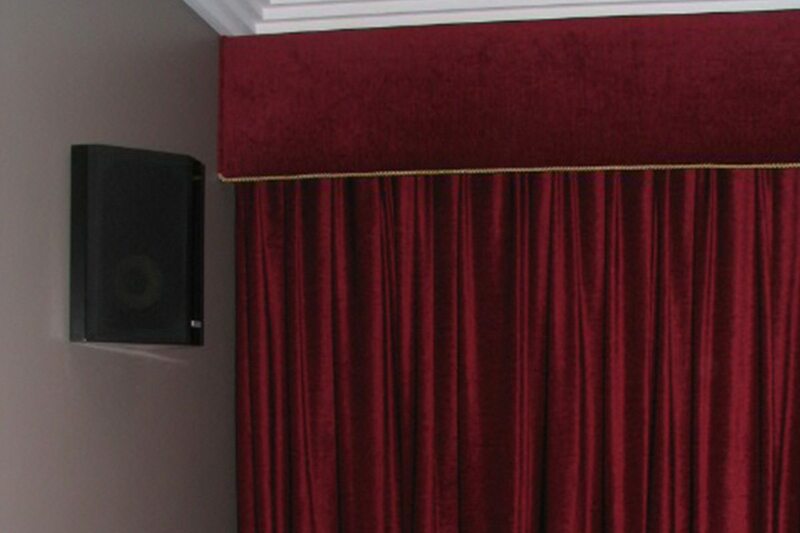 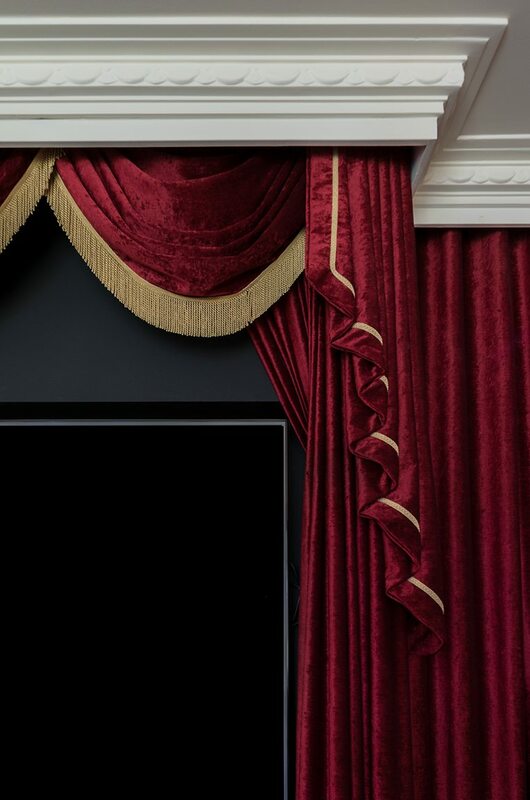 Single pinch pleat block out curtains hung on a series 58 track under cornice. 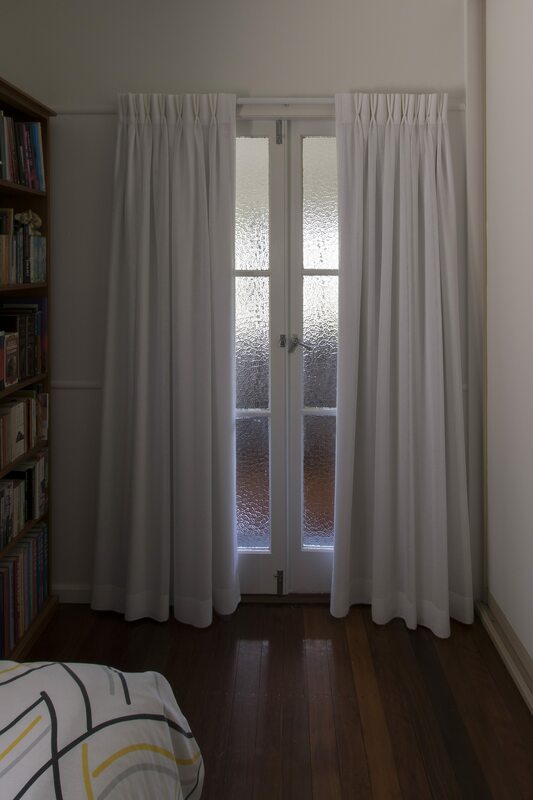 Double pinch pleat block out curtains installed under cornice both pulling one way from corner windows. 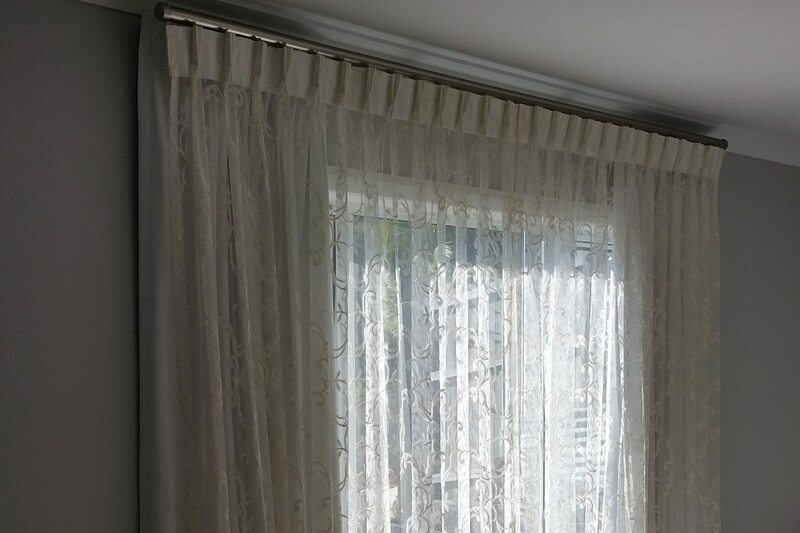 This is a inverted pleat sheer installed under the cornice on a standard track pulling one way from corner windows. 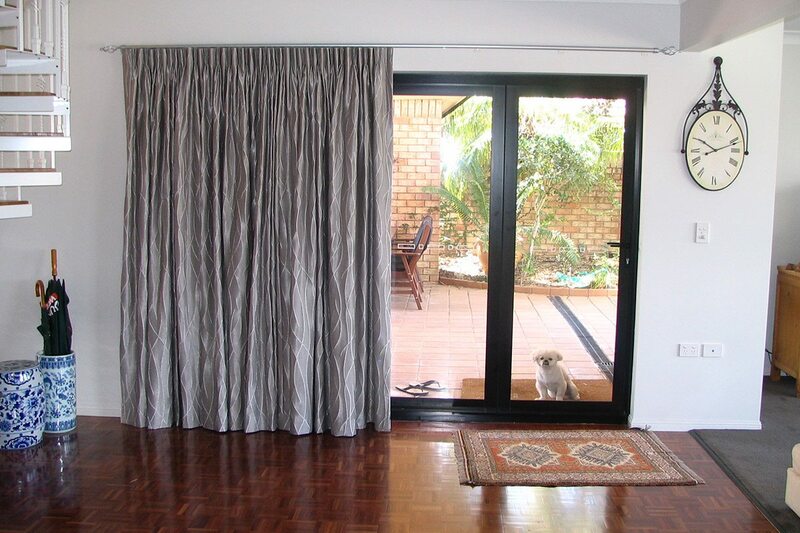 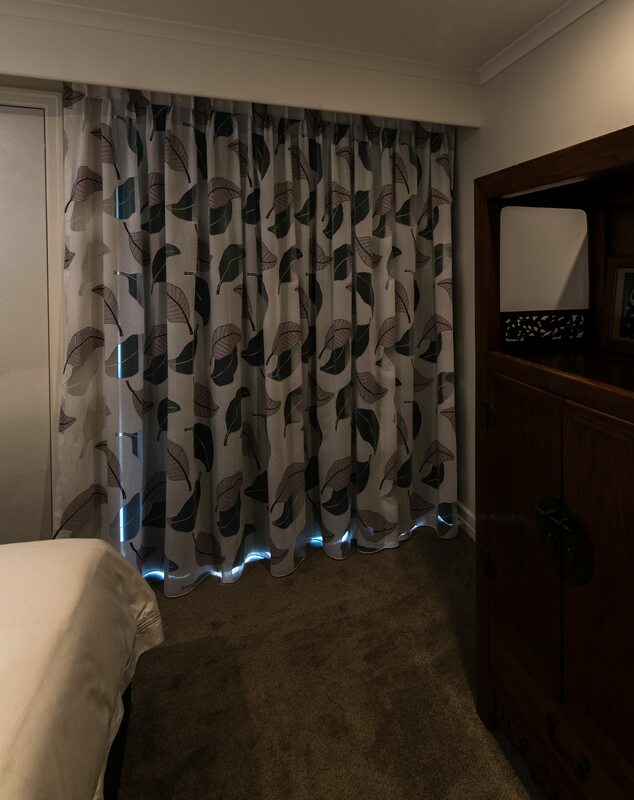 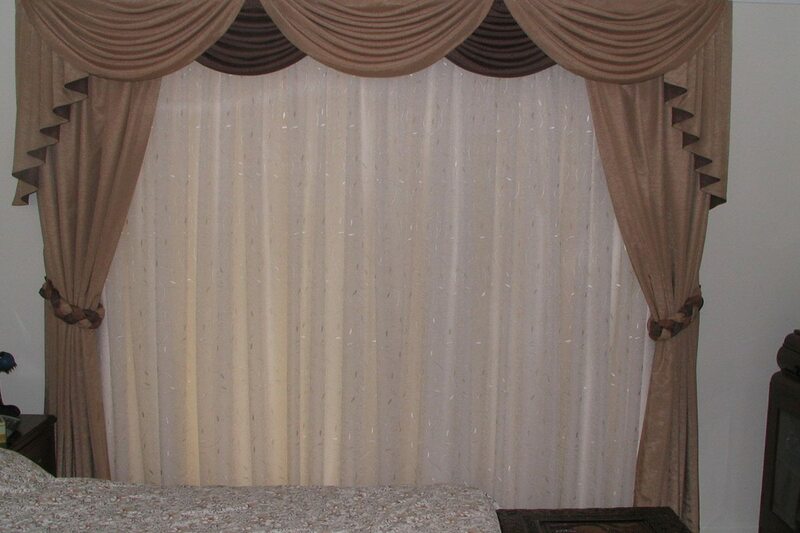 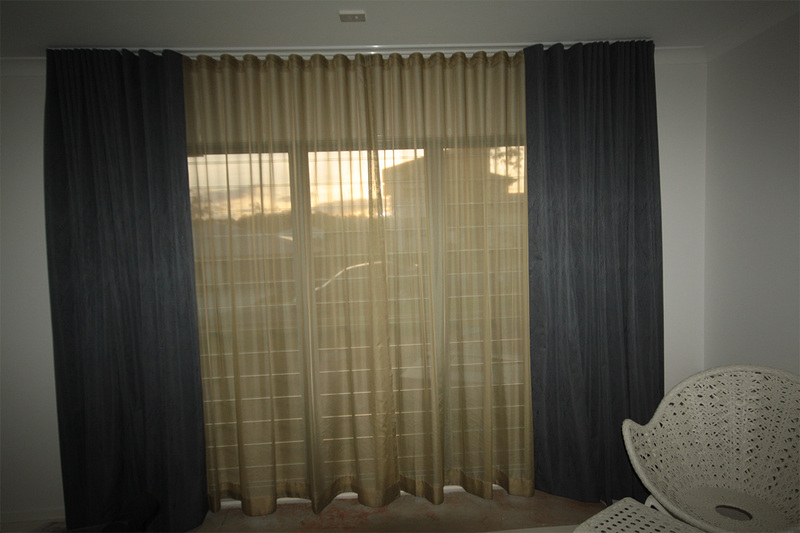 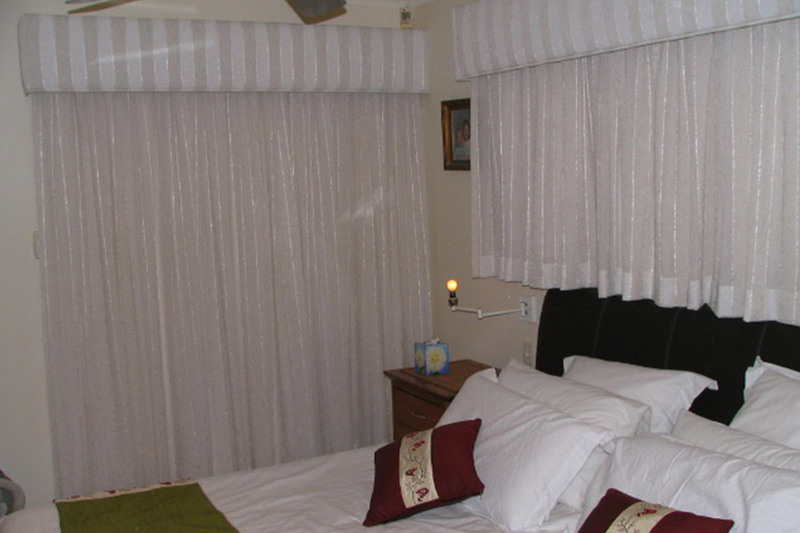 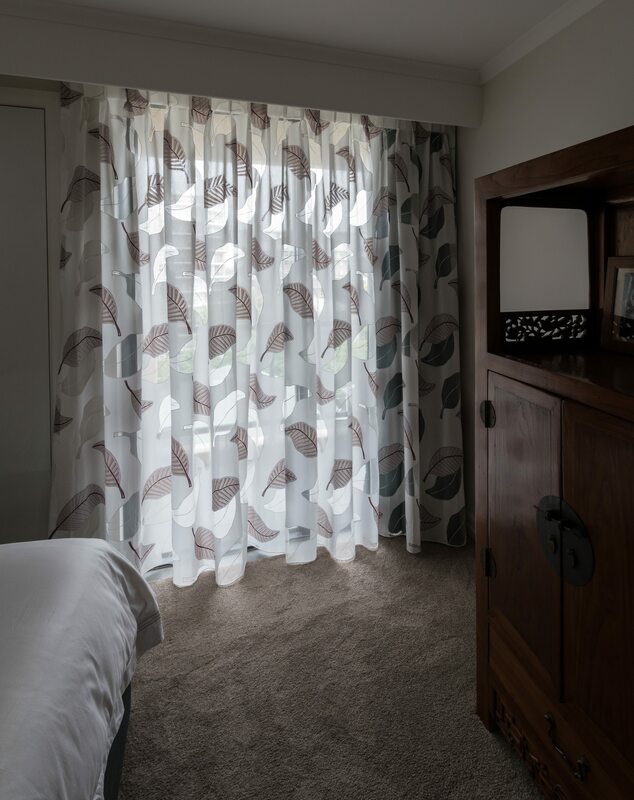 Inverted pleat curtains with a detachable block out lining installed from ceiling. 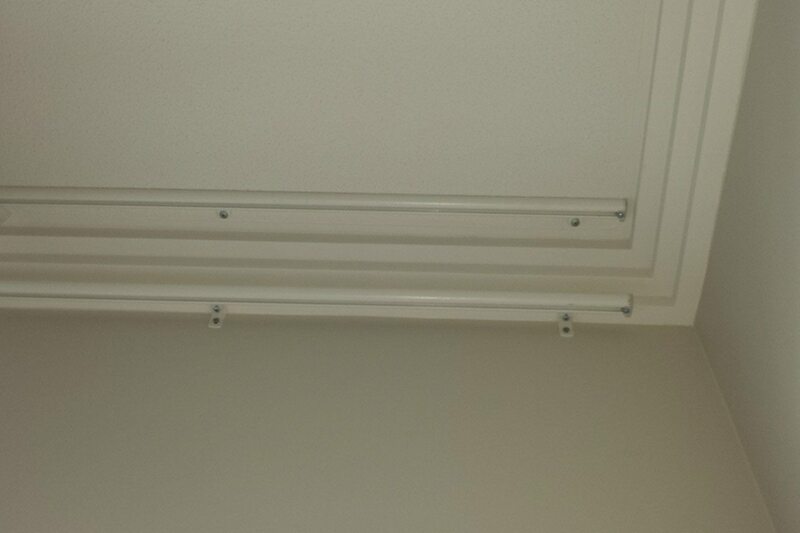 Series 58 track ( small profile) with S fold sheer installed into ceiling. 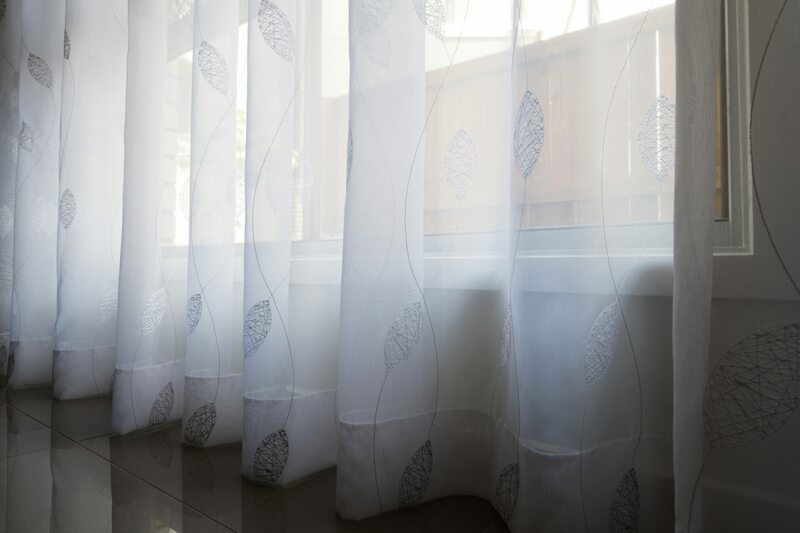 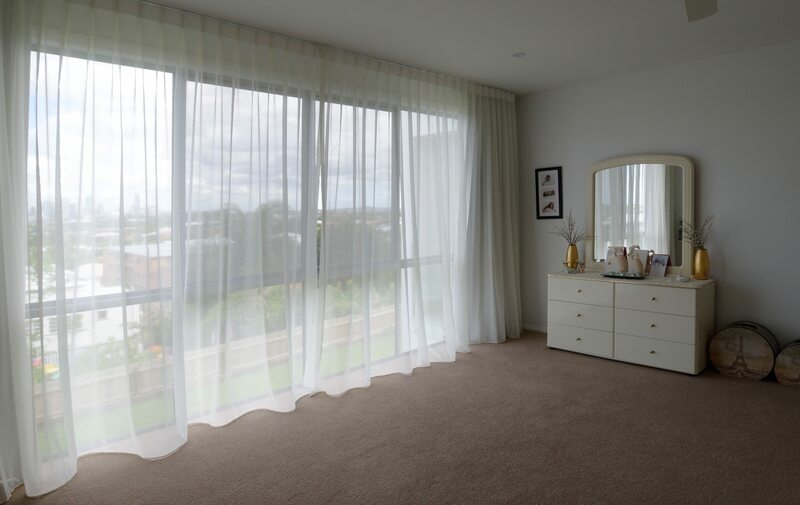 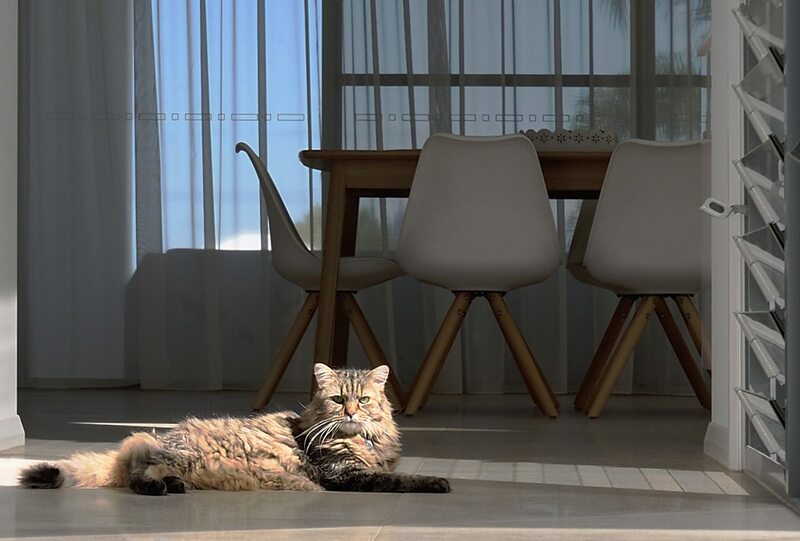 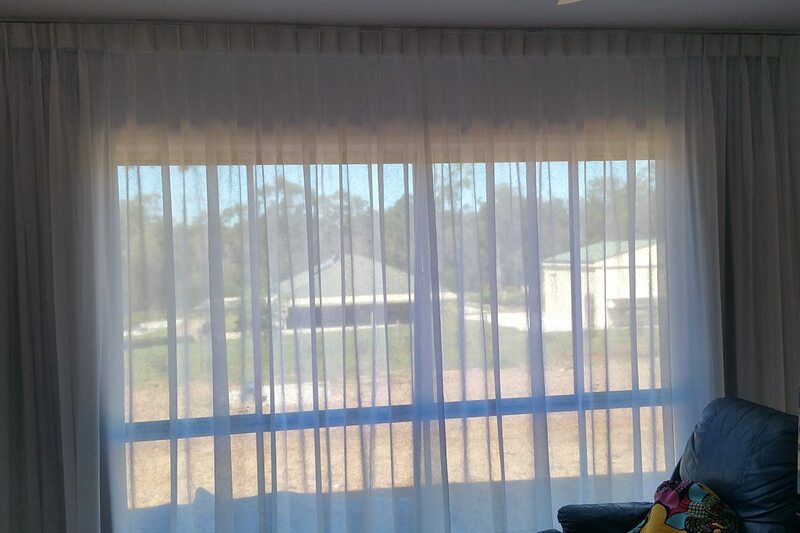 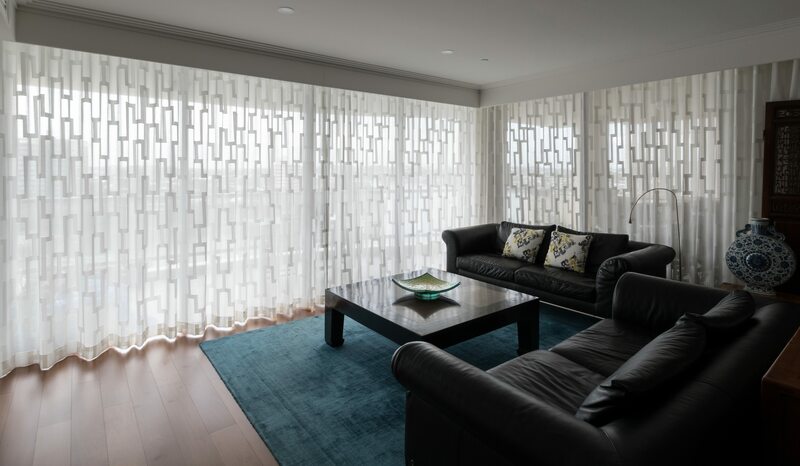 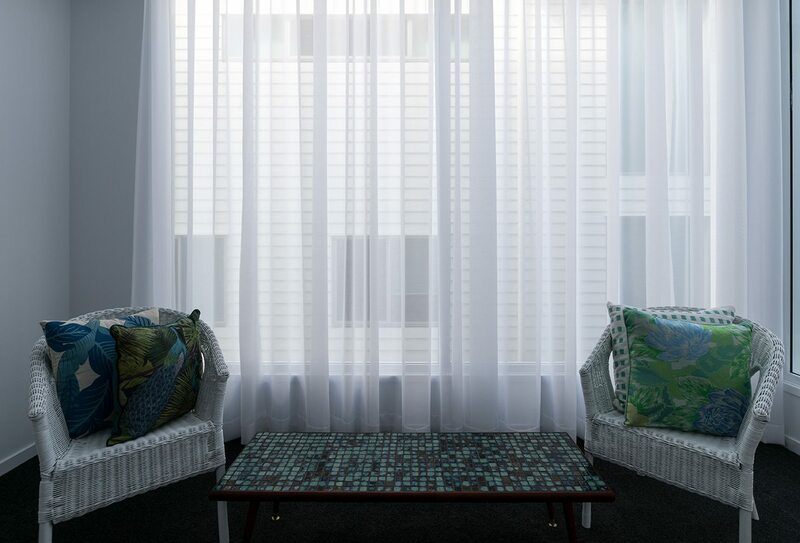 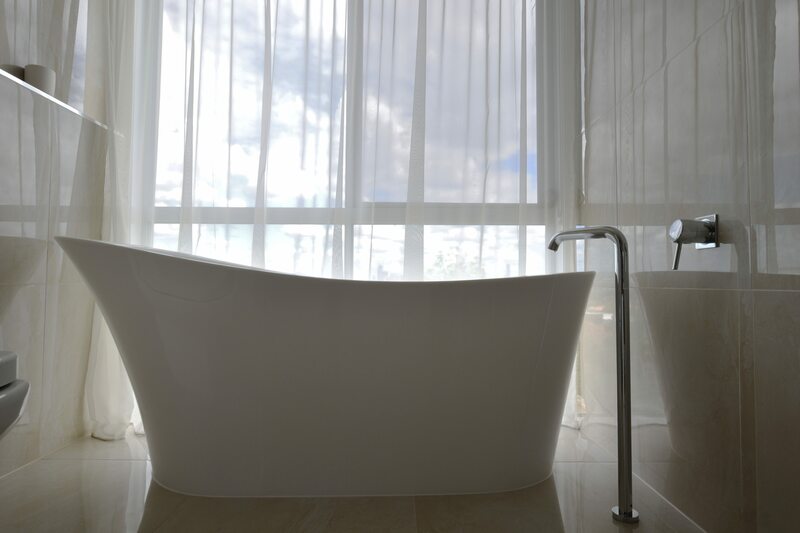 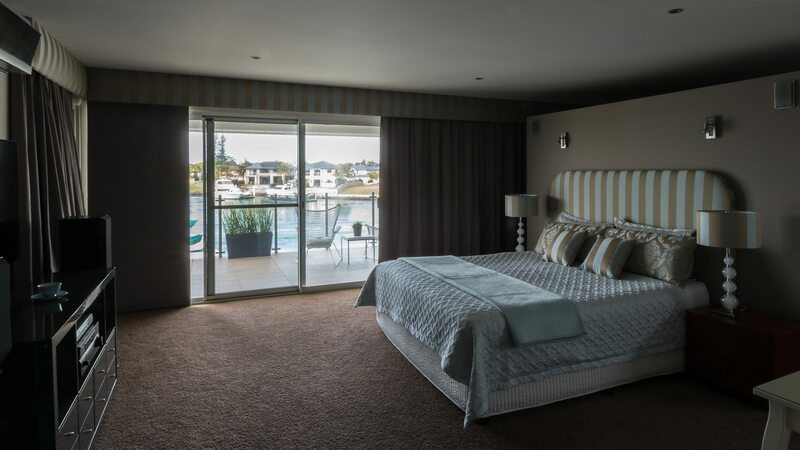 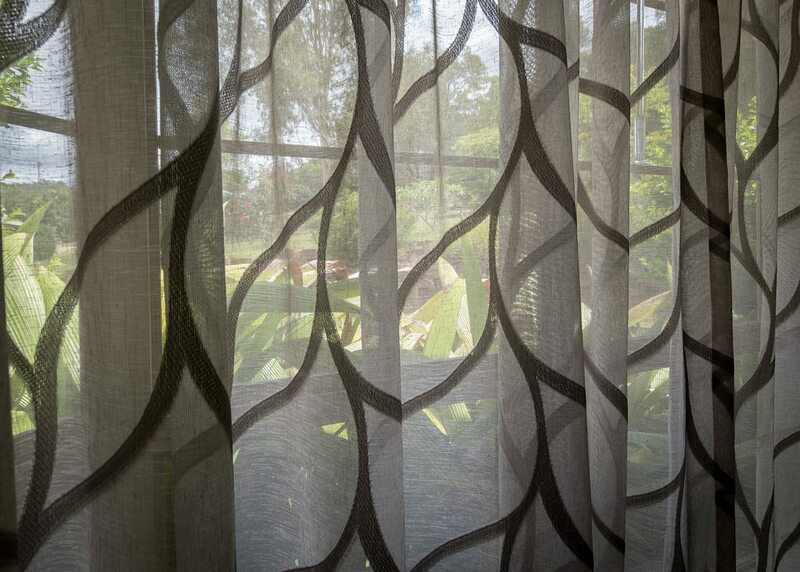 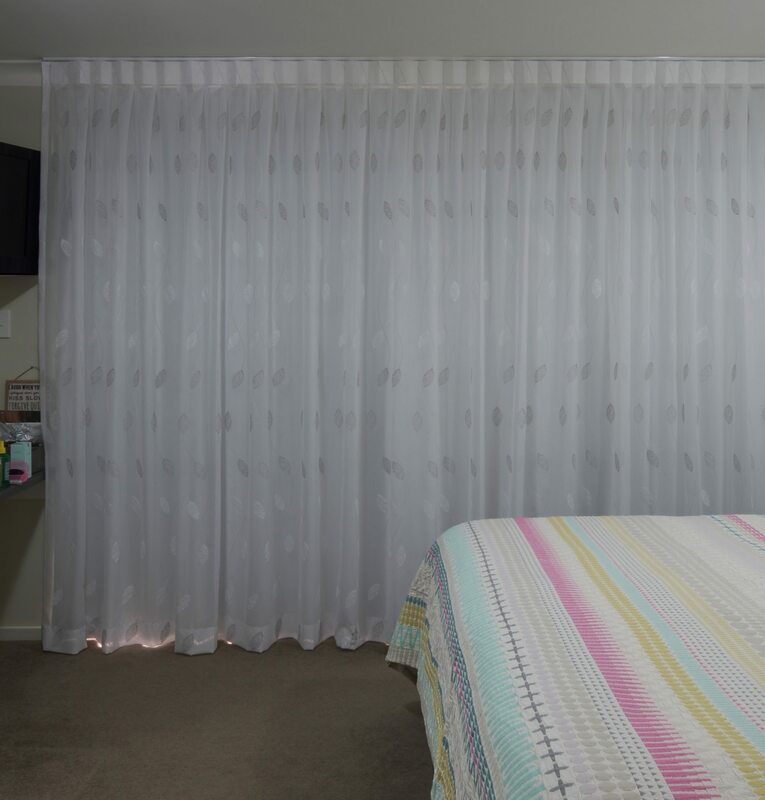 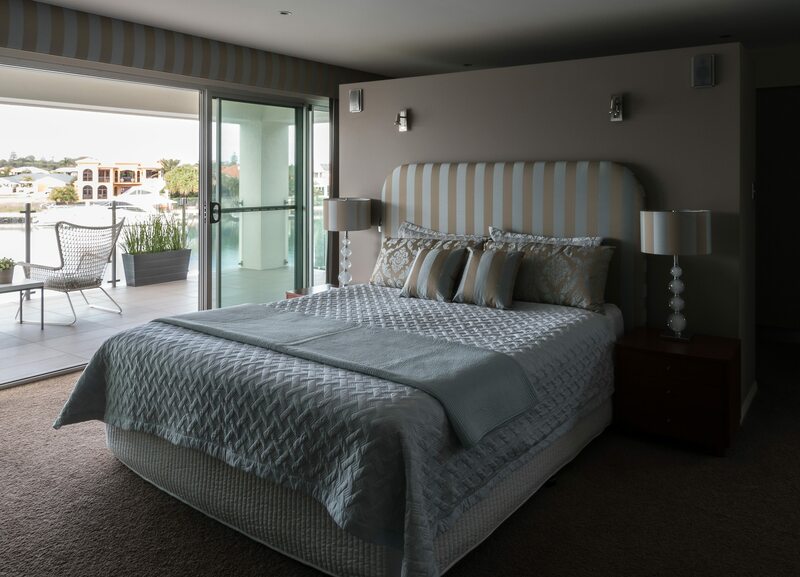 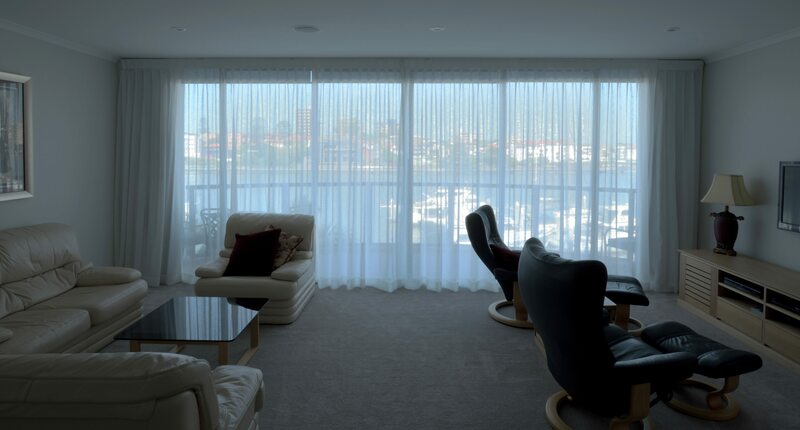 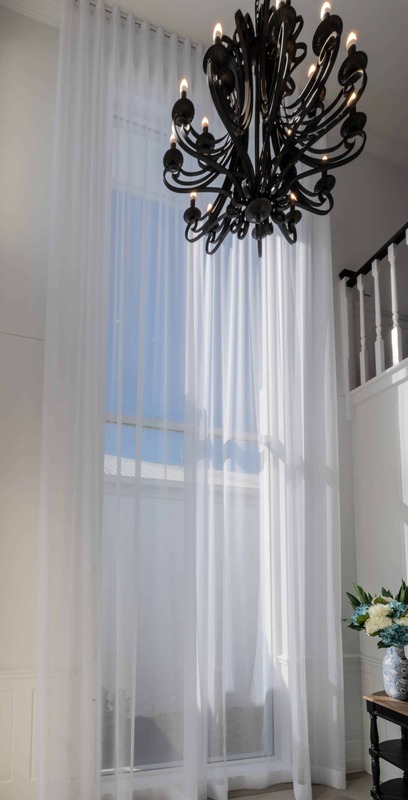 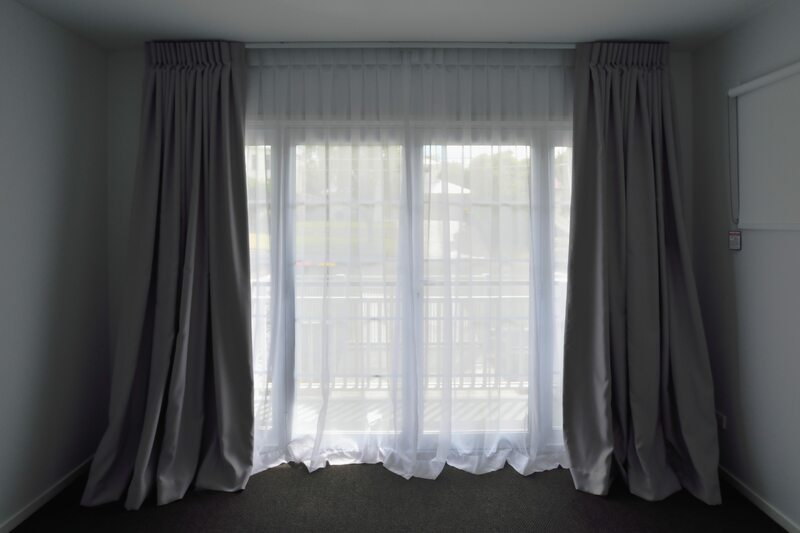 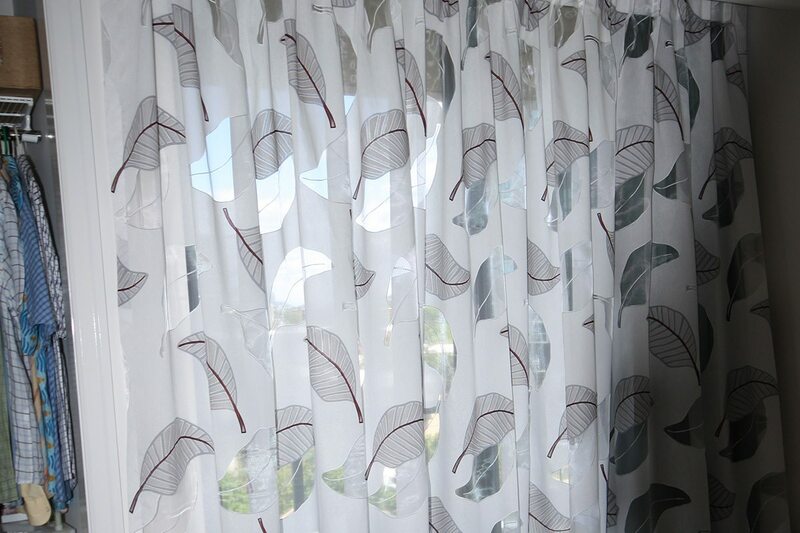 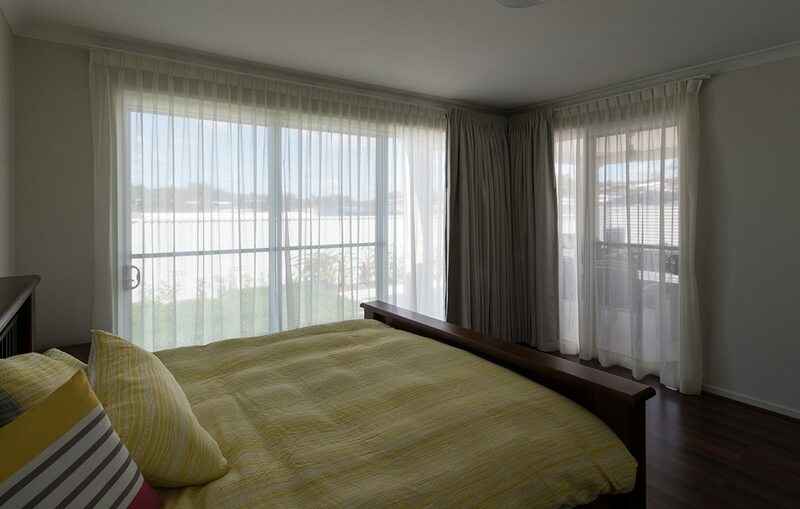 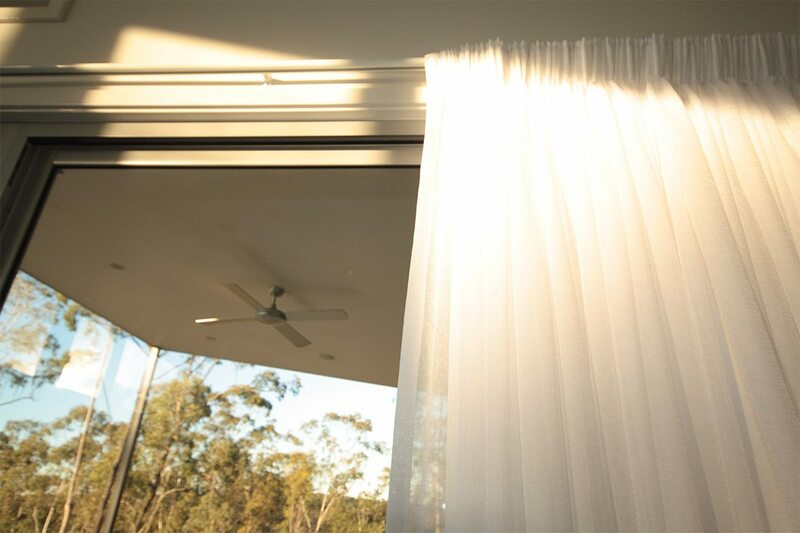 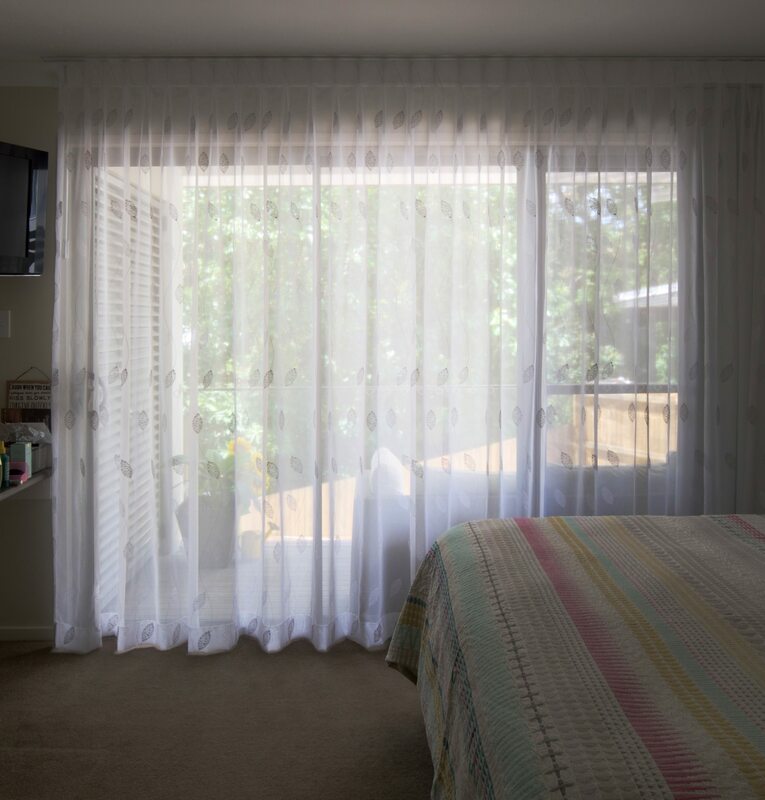 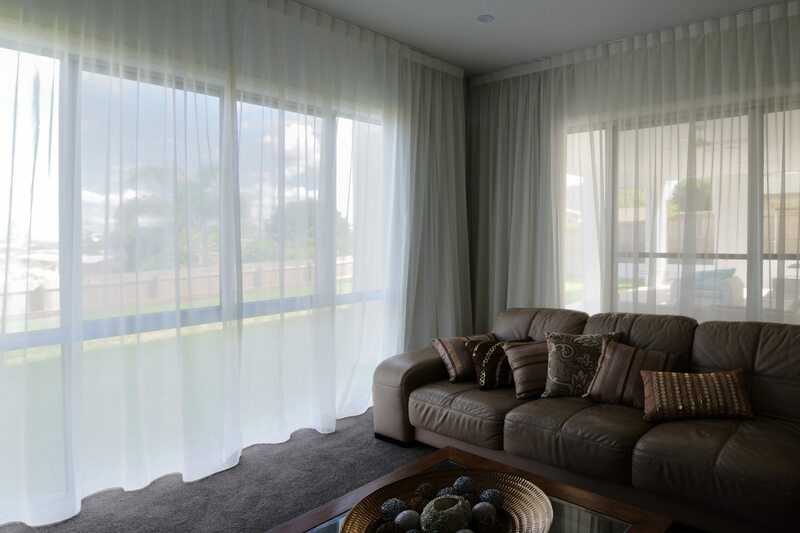 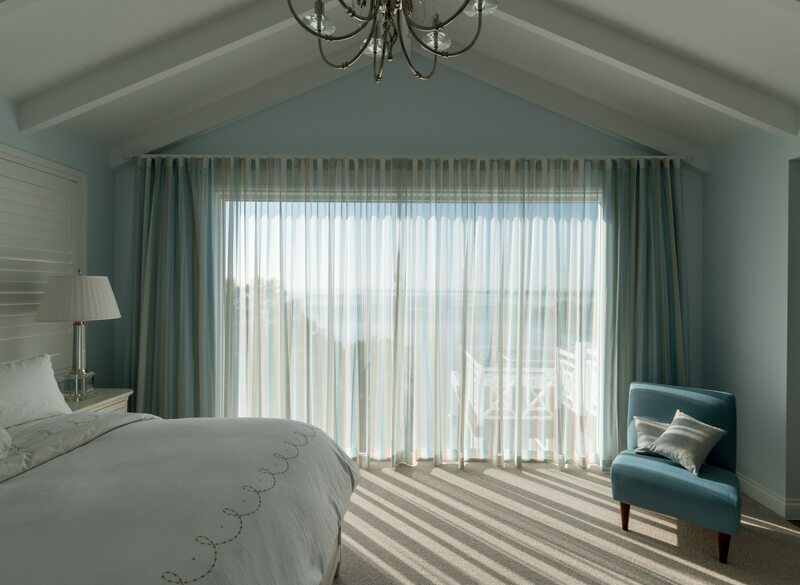 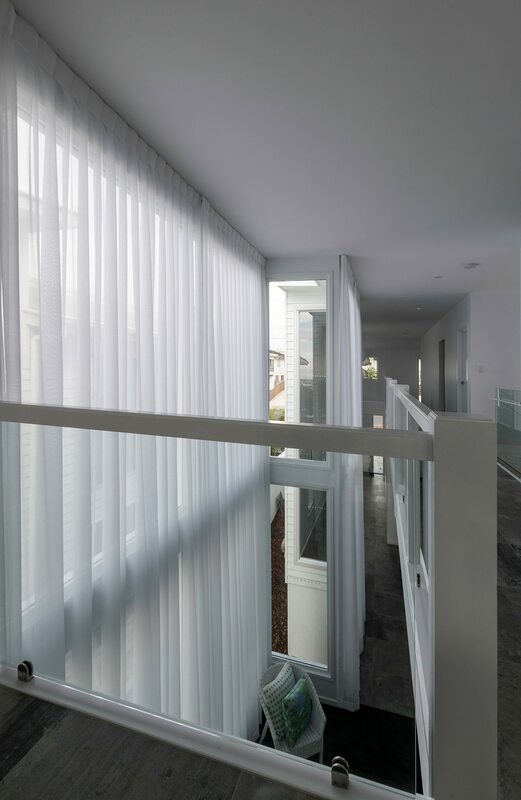 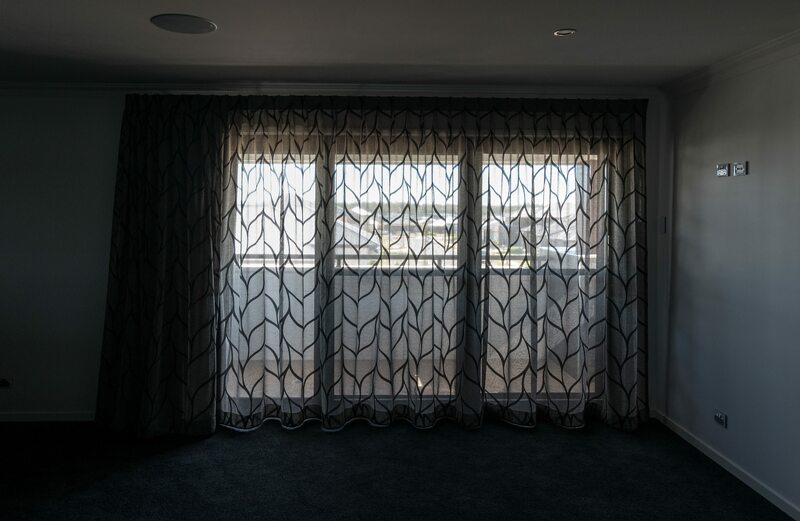 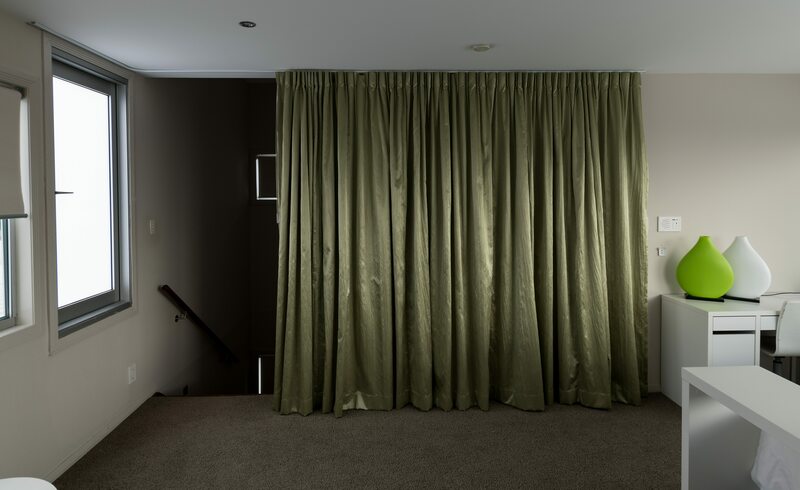 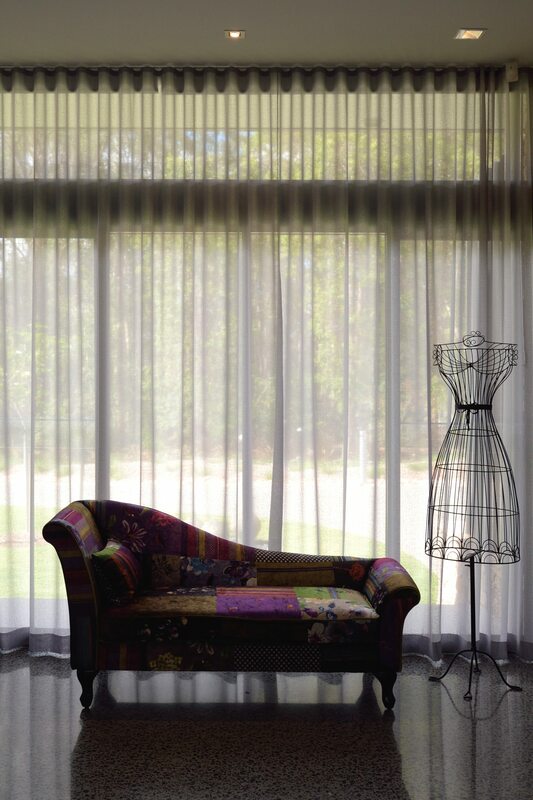 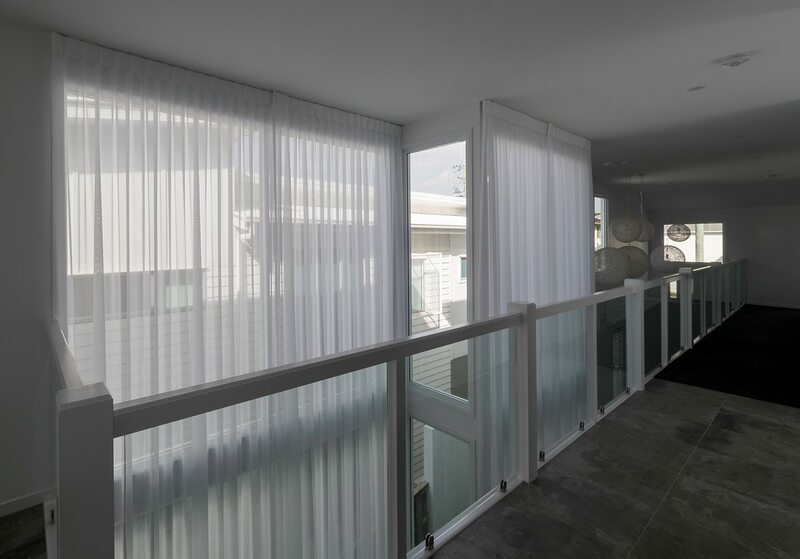 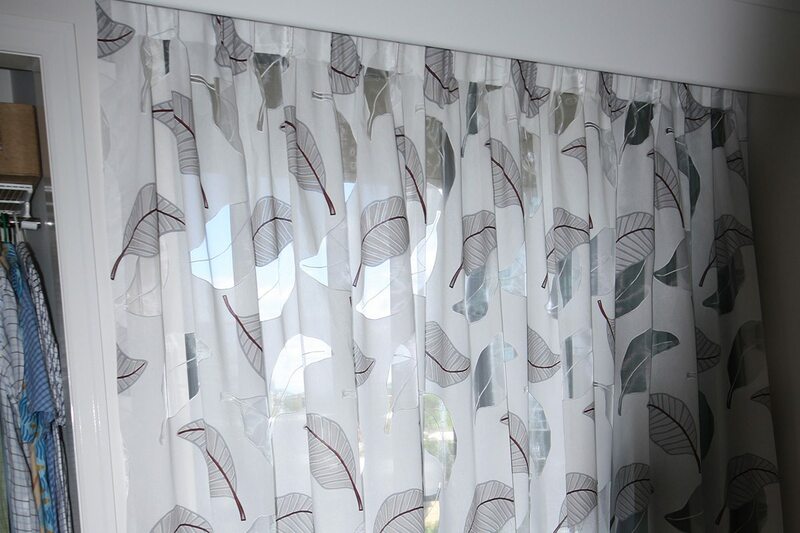 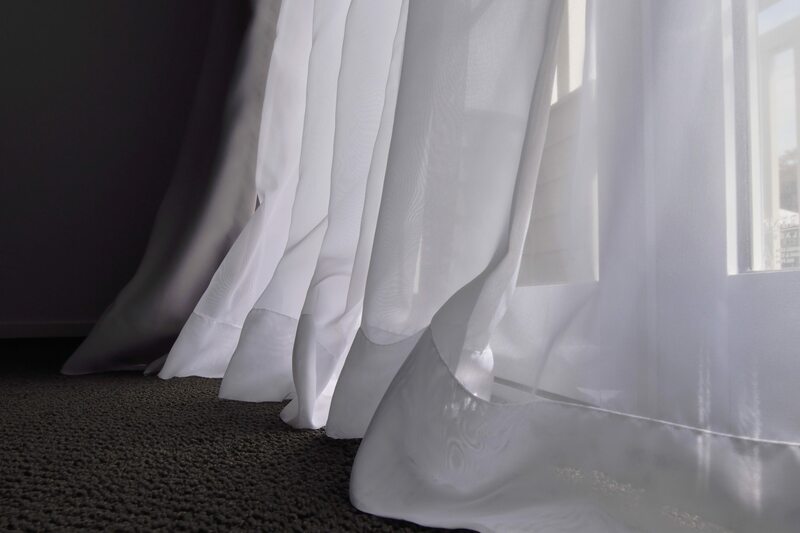 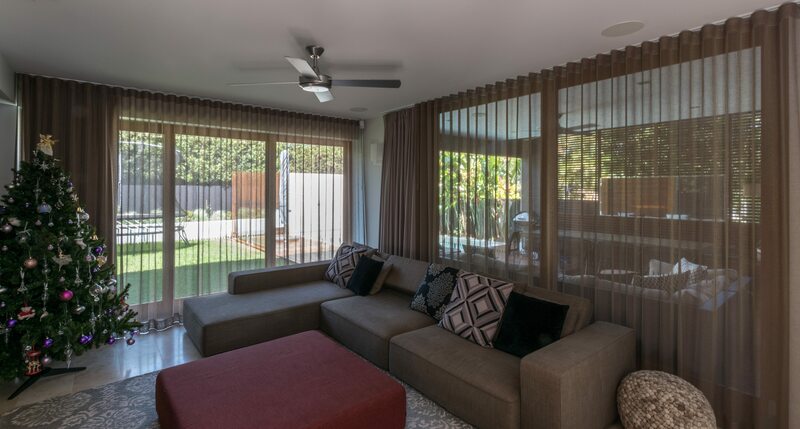 Double standard series 79 tracks with inverted pleat sheer at the back and inverted pleat block out curtains at the front. 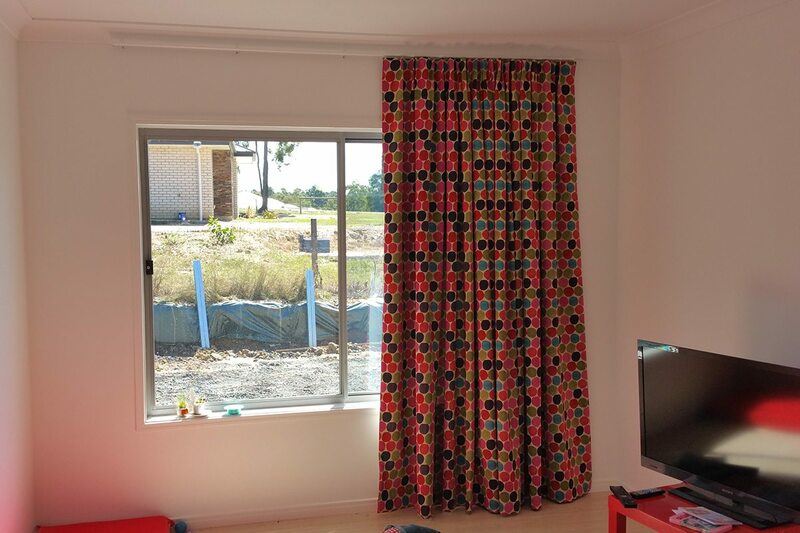 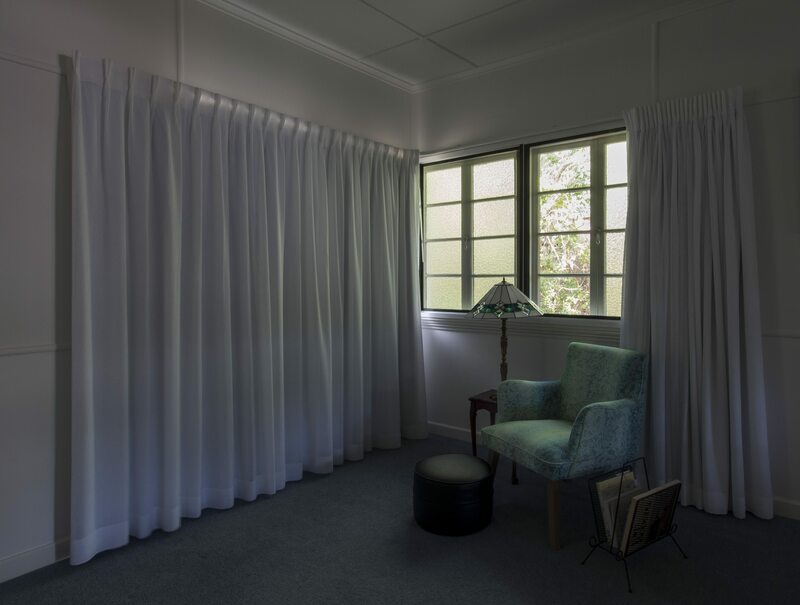 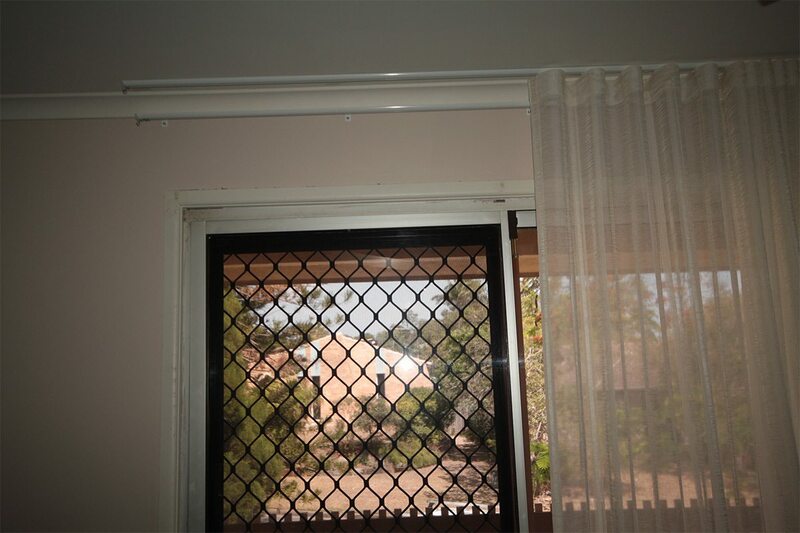 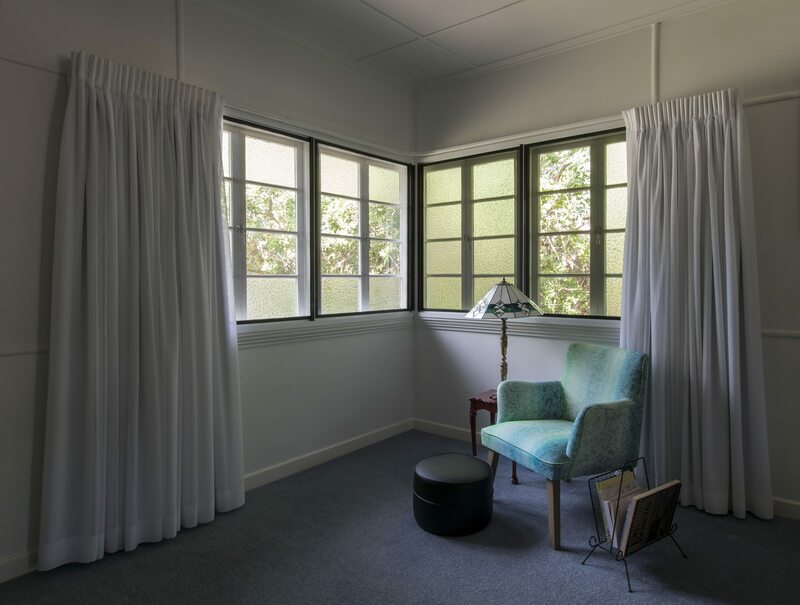 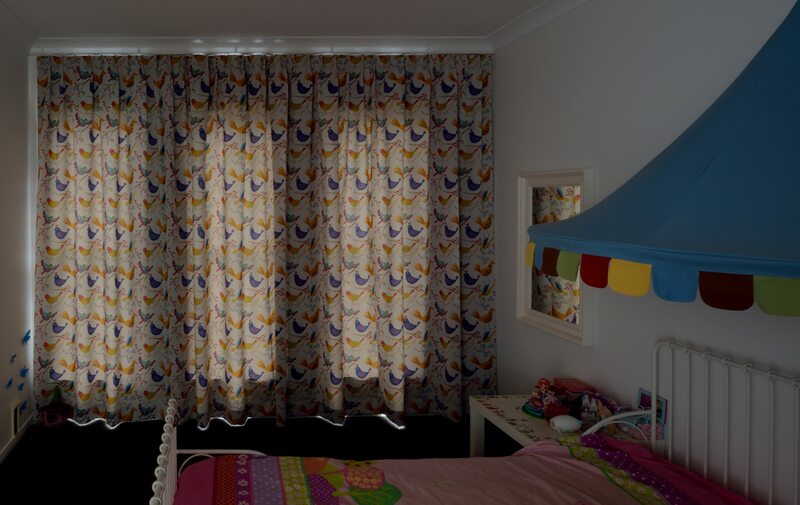 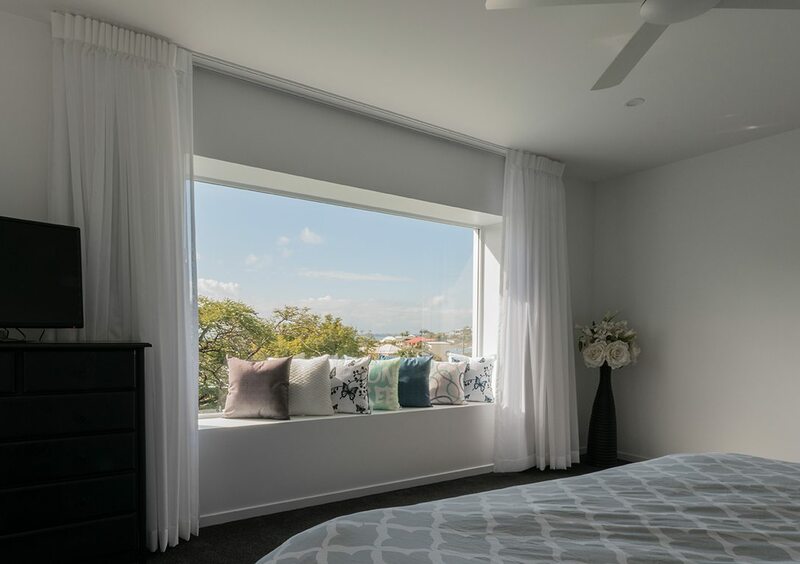 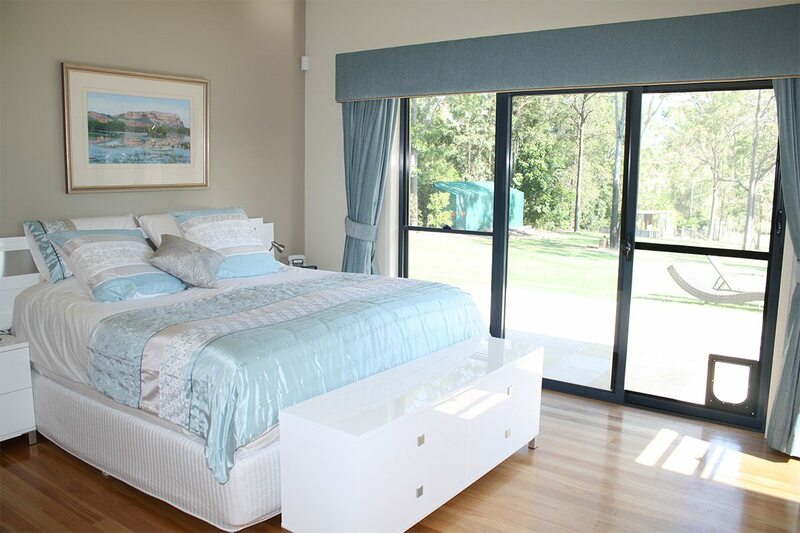 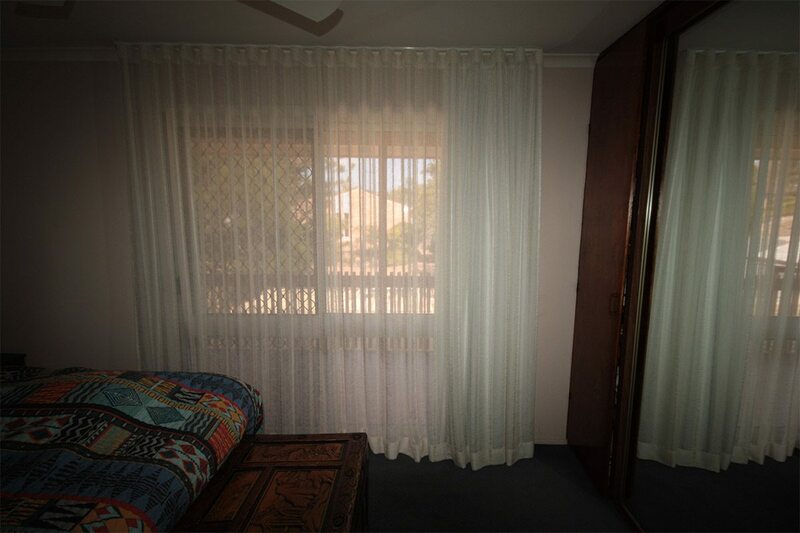 Wide window with double standard series 79 tracks with sheer at the back and double pinch pleat curtains at the front with a detachable block out lining. 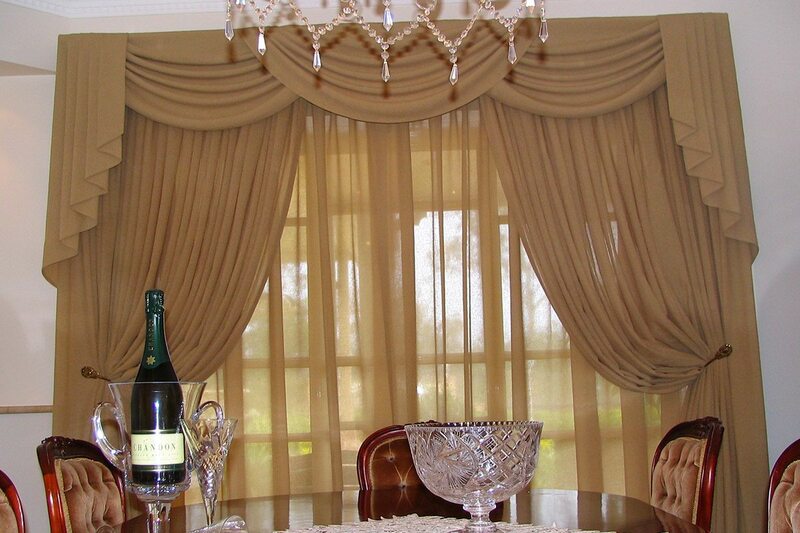 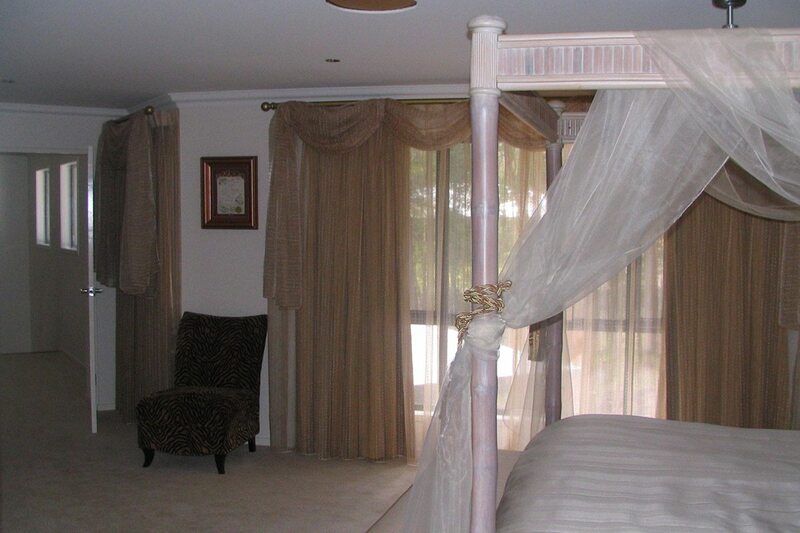 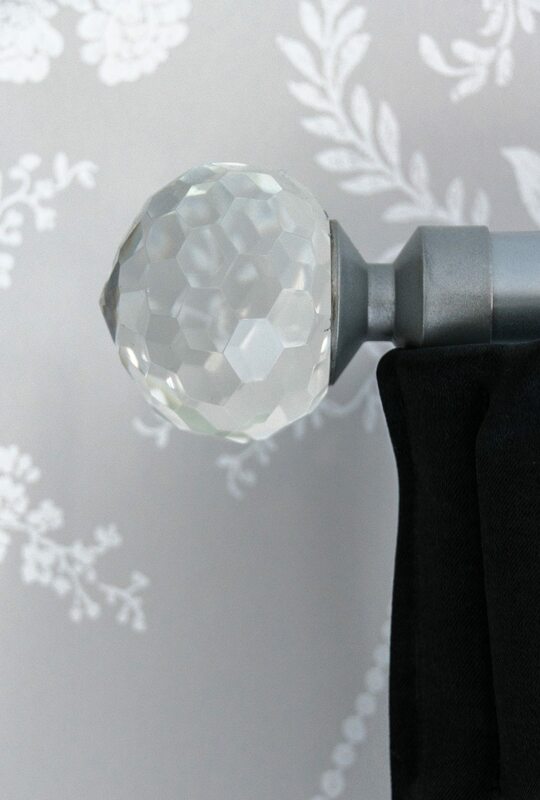 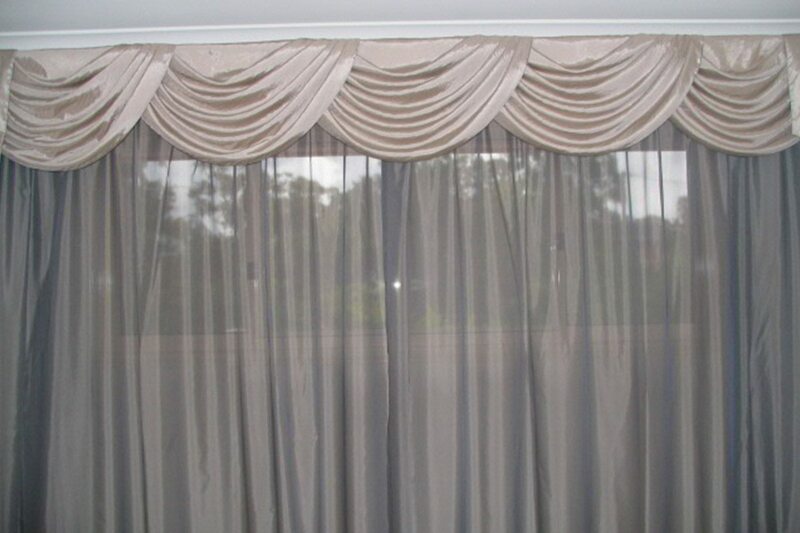 Double pinch pleat sheer on a designer timber pole with finials. 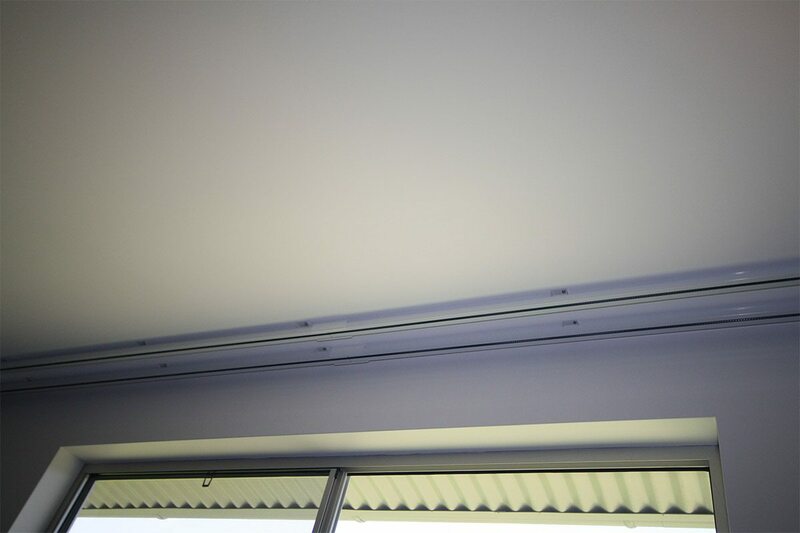 Series 58 track (small profile) installed into the ceiling with a double pinch pleat sheer and a single pinch pleat lining behind. 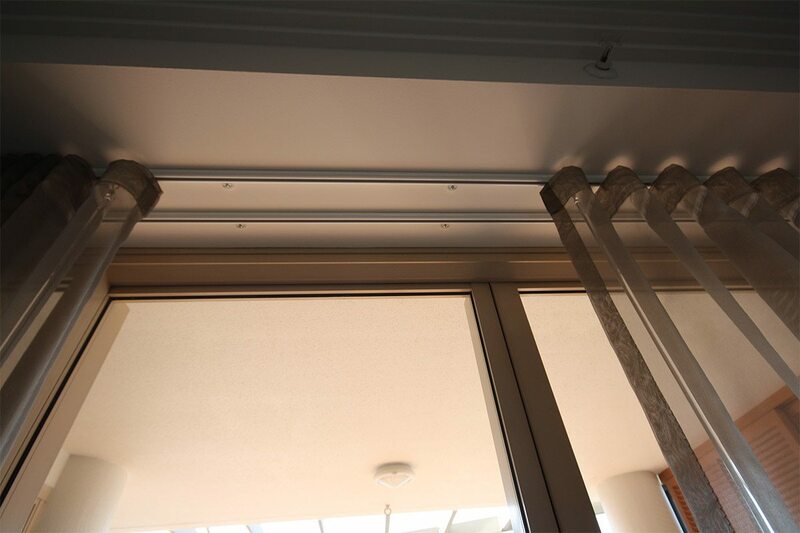 Both are center opening. 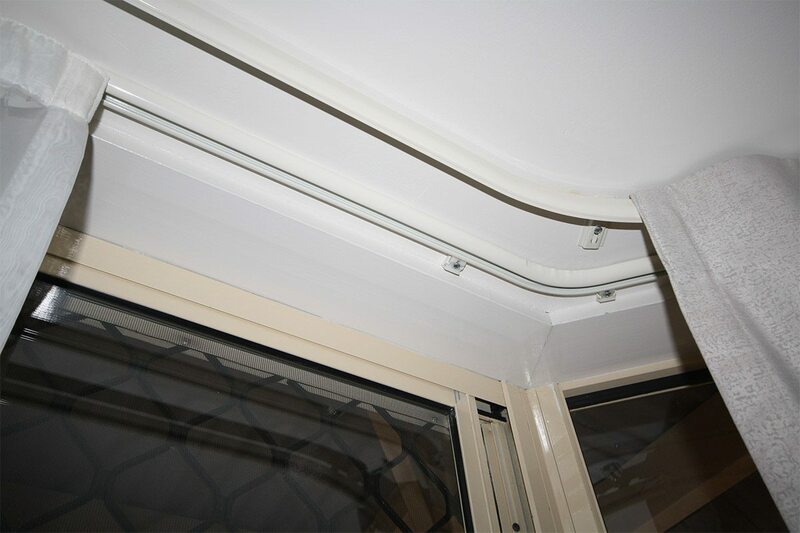 Low profile S Fold track installed into the ceiling with one track installed under the cornice. 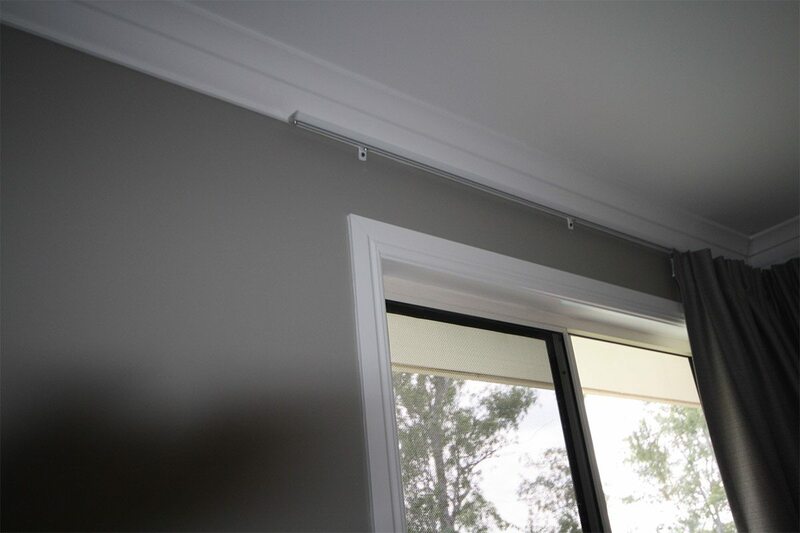 There is a S Fold sheer on the ceiling and a block out lining installed under the cornice. 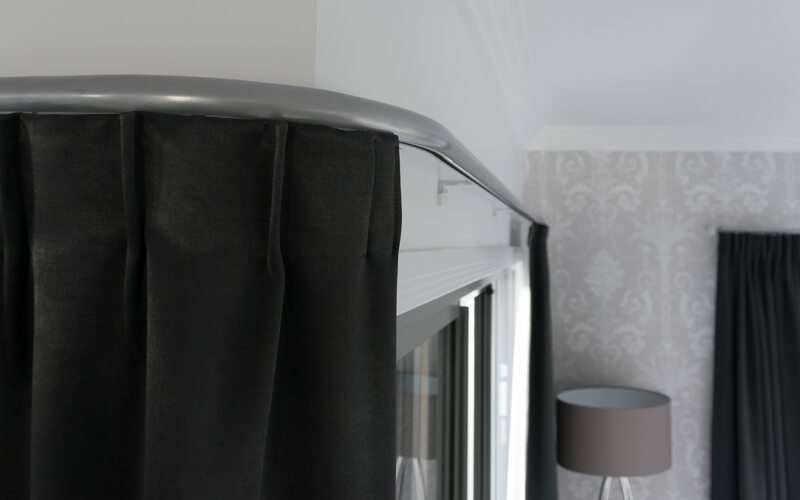 Single pinch pleat block out lining on a series 58 track (small profile) installed under the cornice. 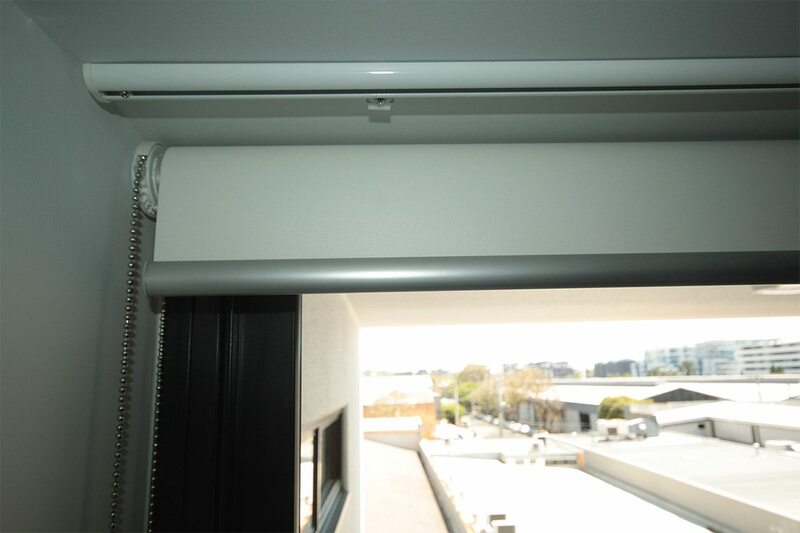 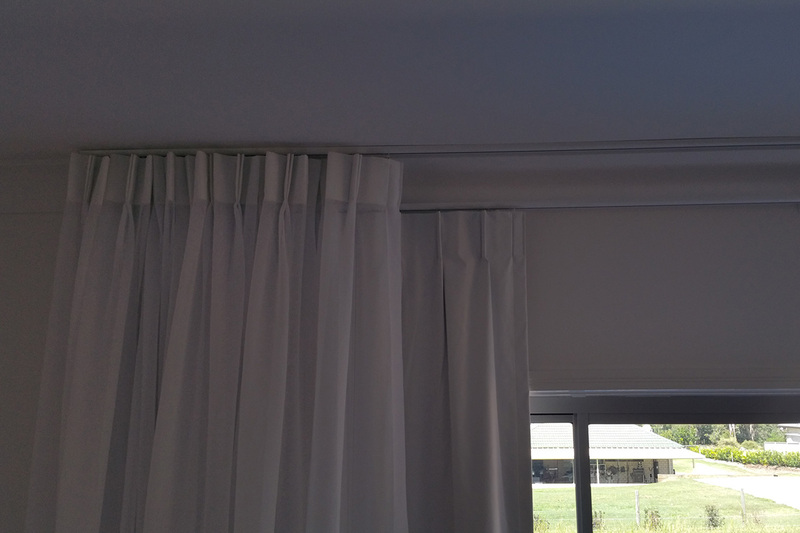 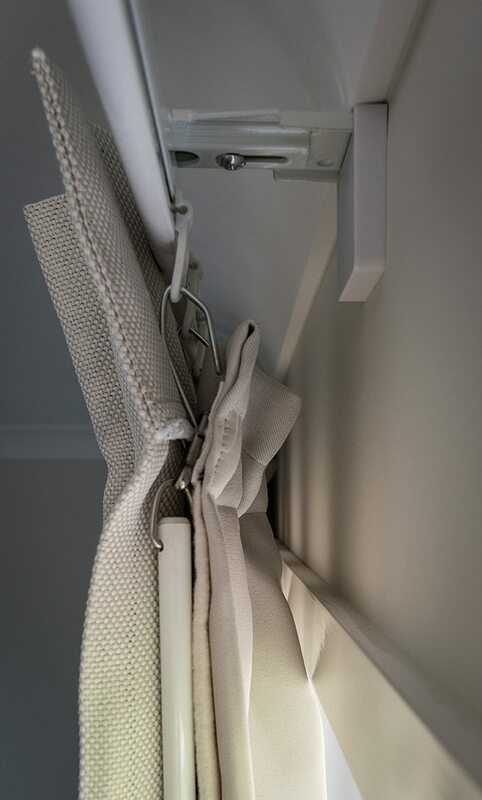 Single pinch pleat block out curtains installed under the cornice on a bent low profile track pulling one way. 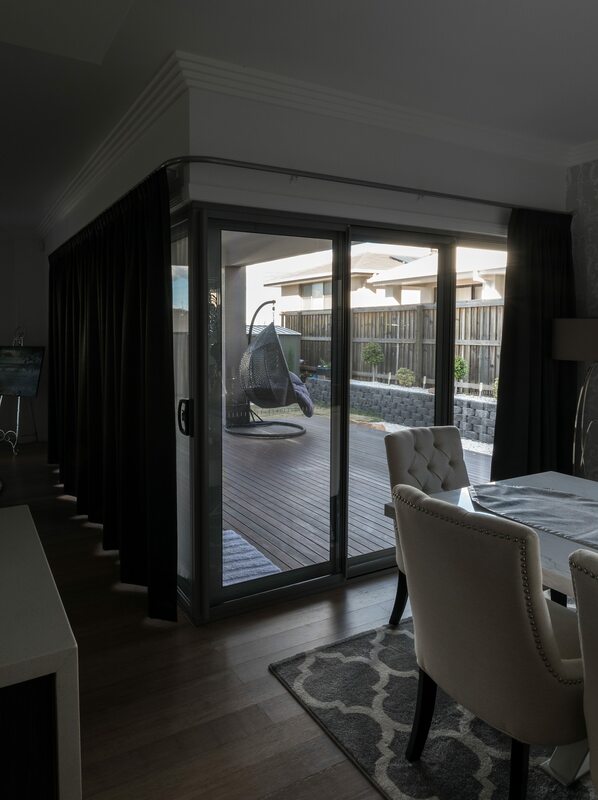 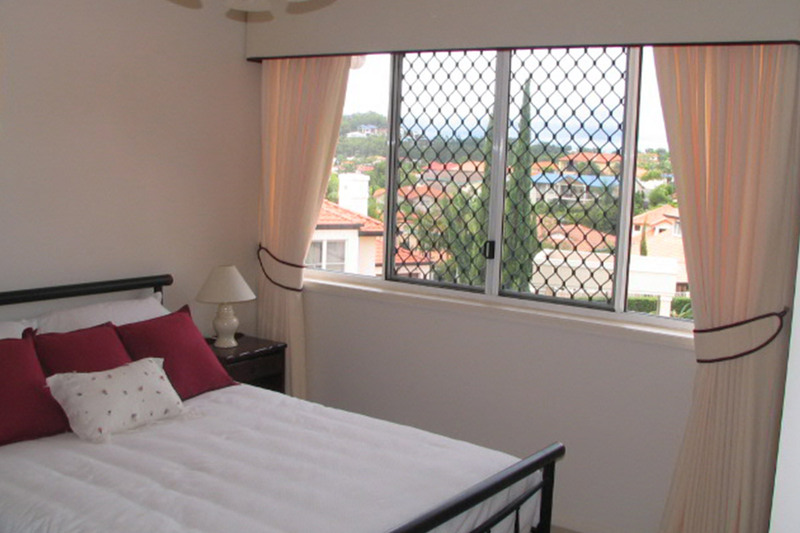 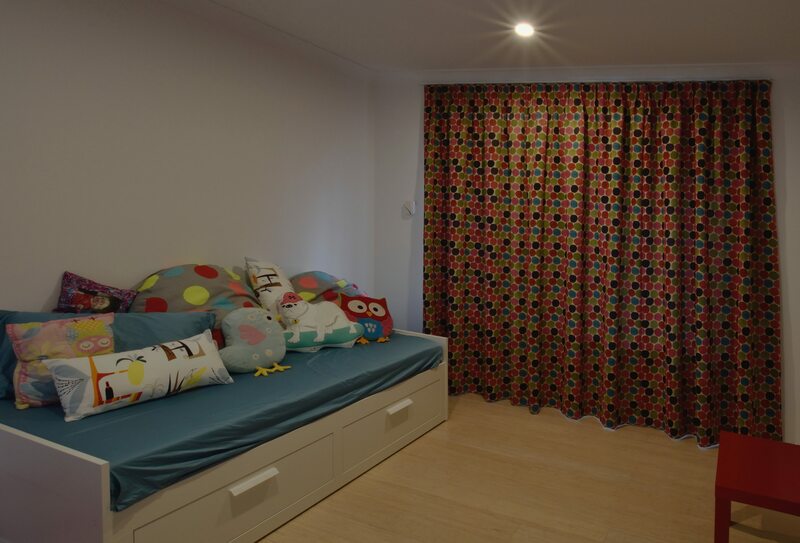 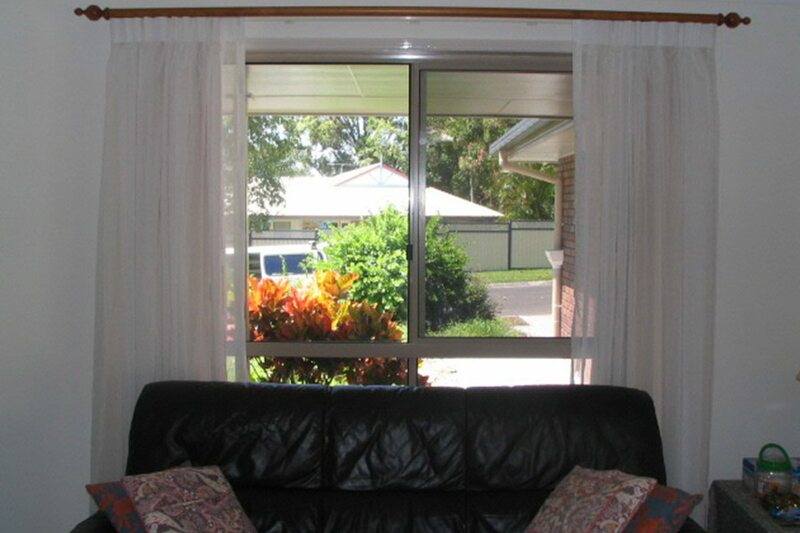 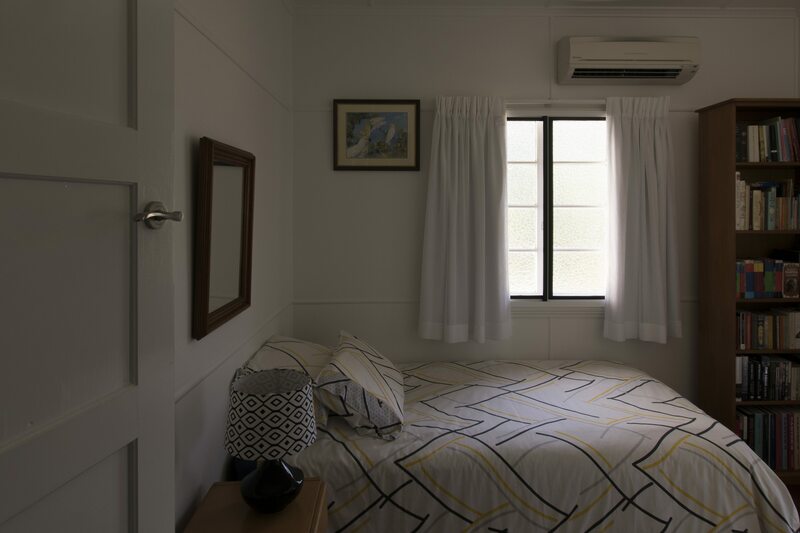 Large opening with one way curtain. 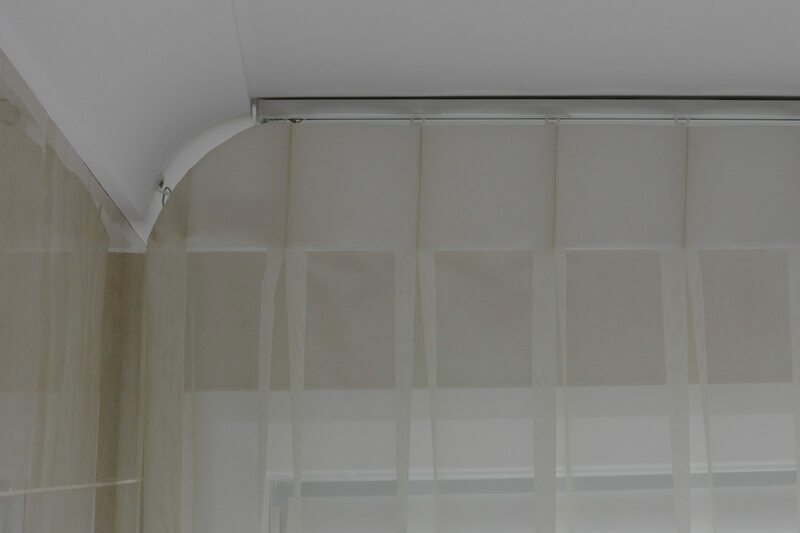 This is a S Fold sheer that has been installed from ceiling. 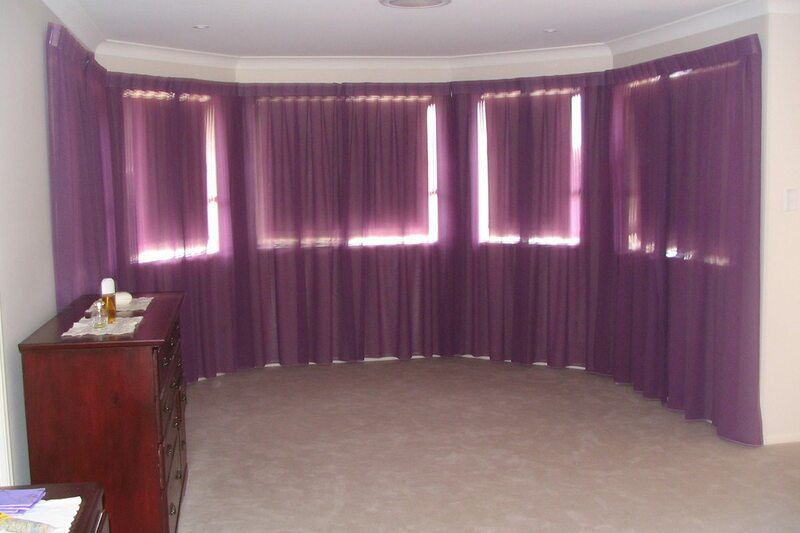 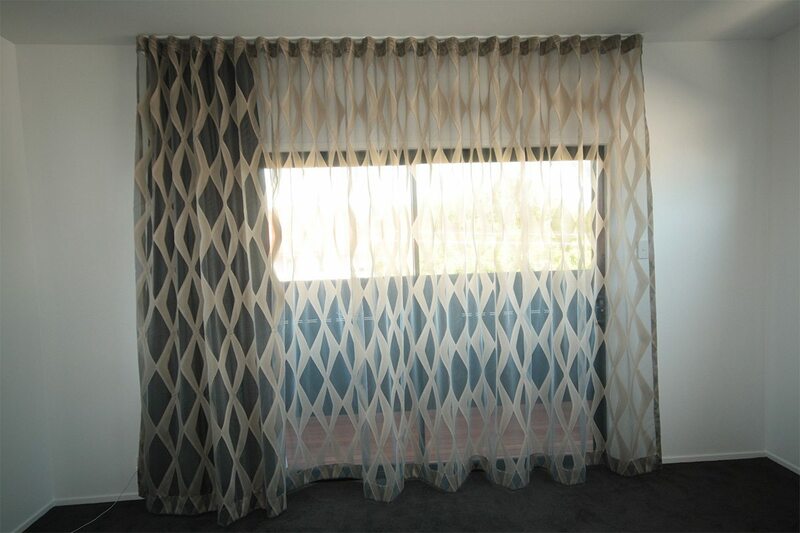 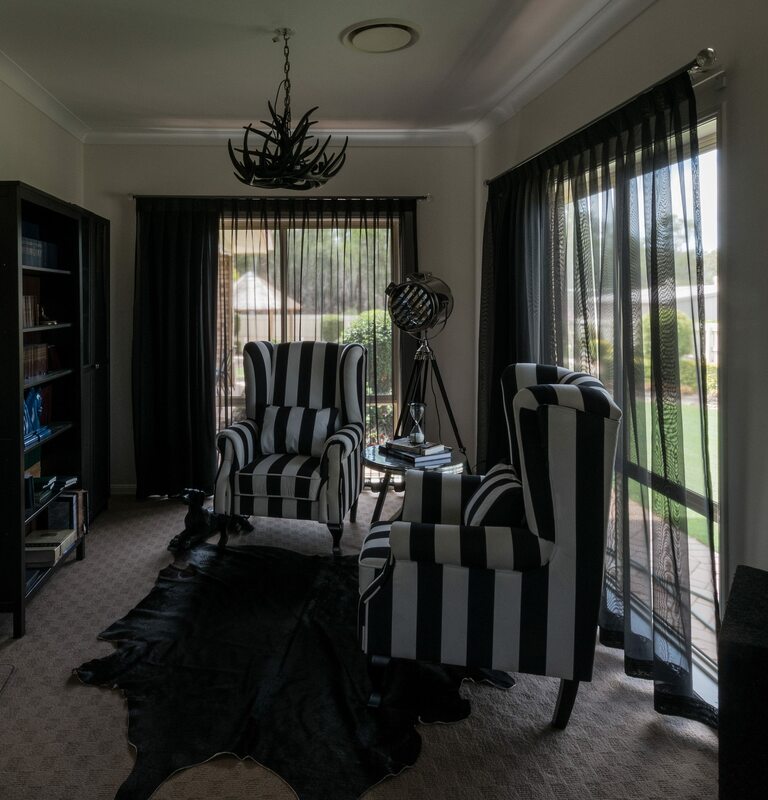 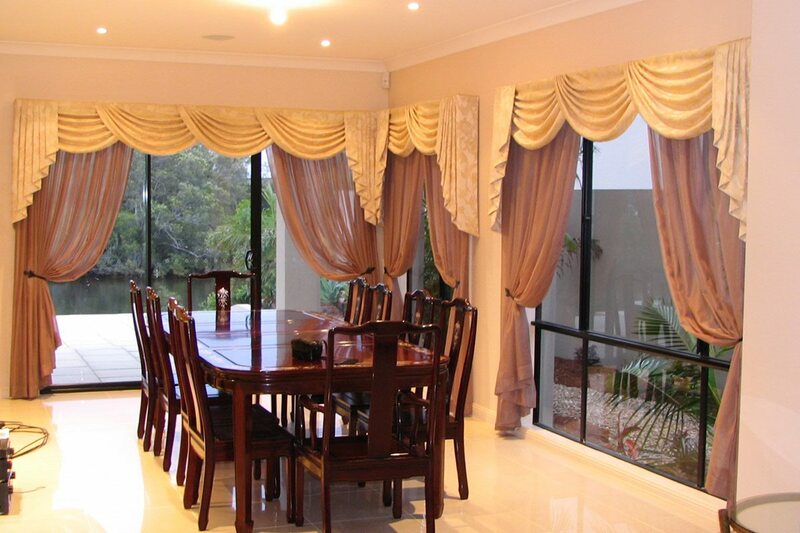 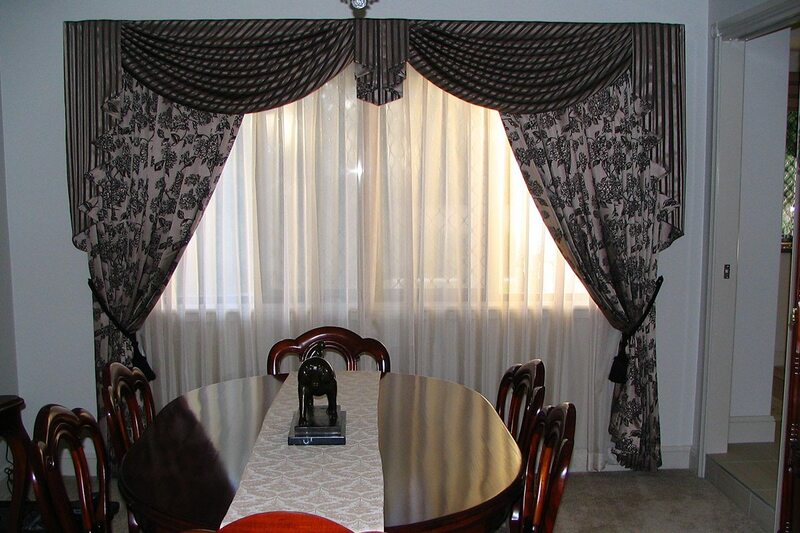 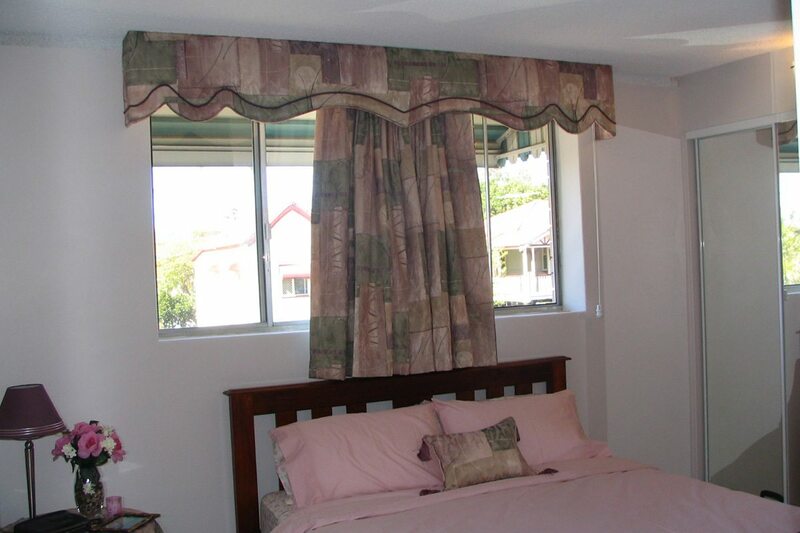 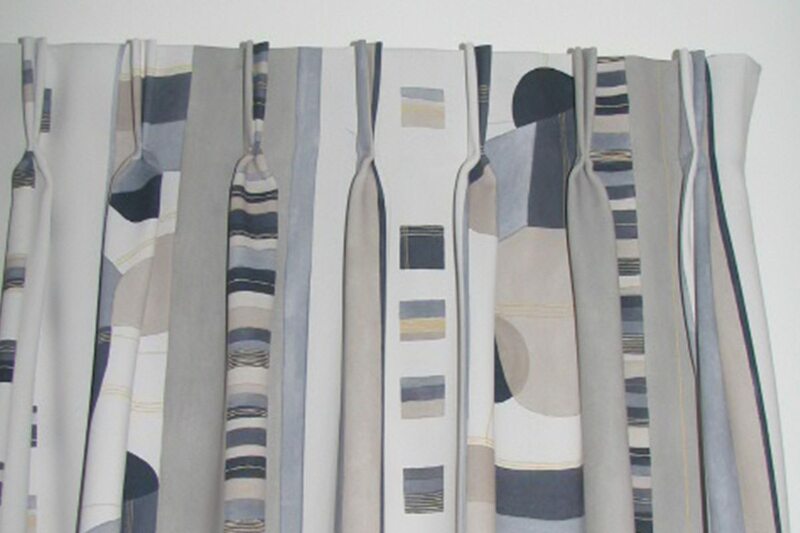 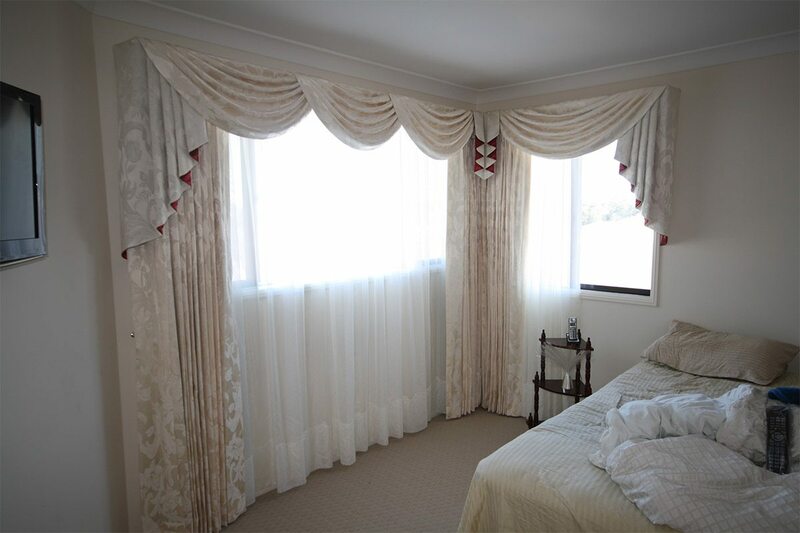 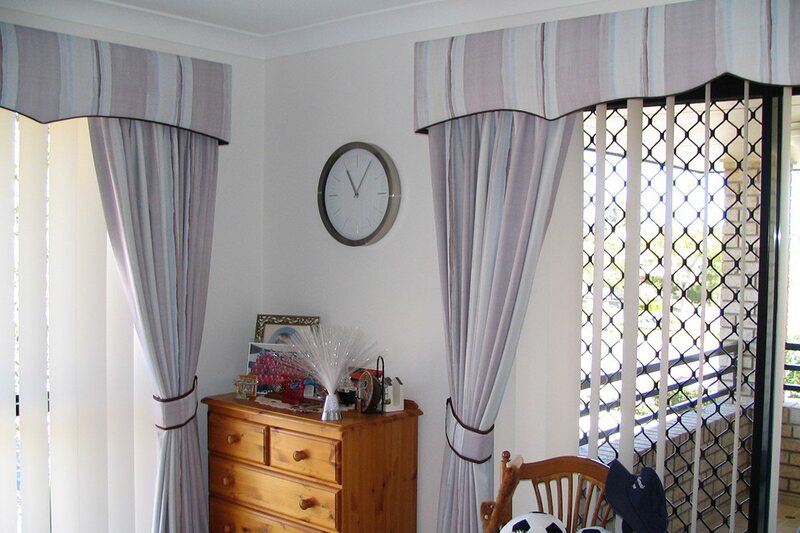 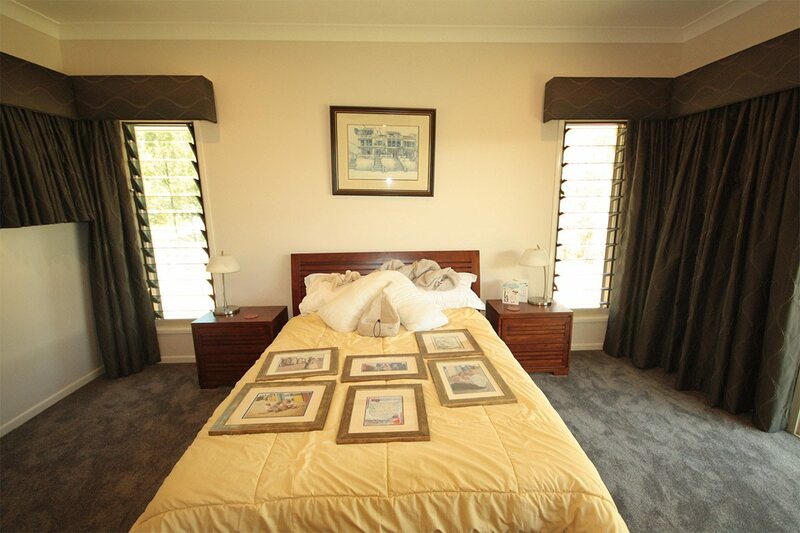 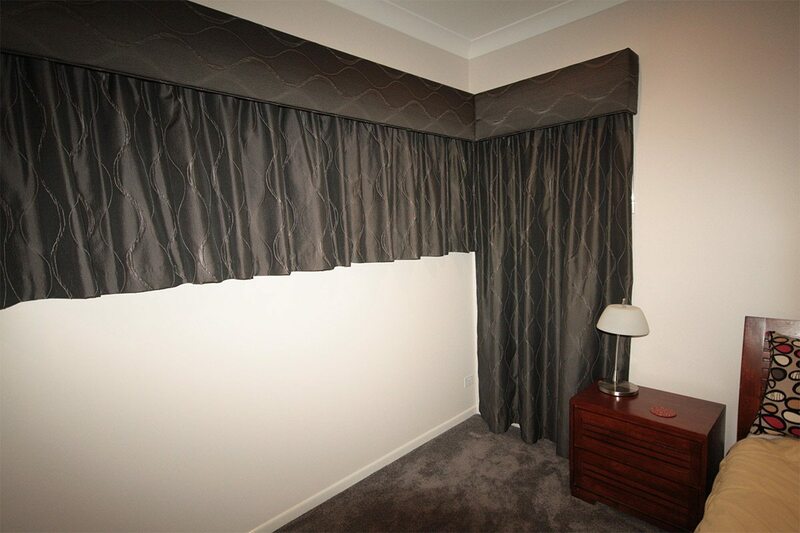 Contrast swags and tails layered with matching curtains and plaited tie backs. 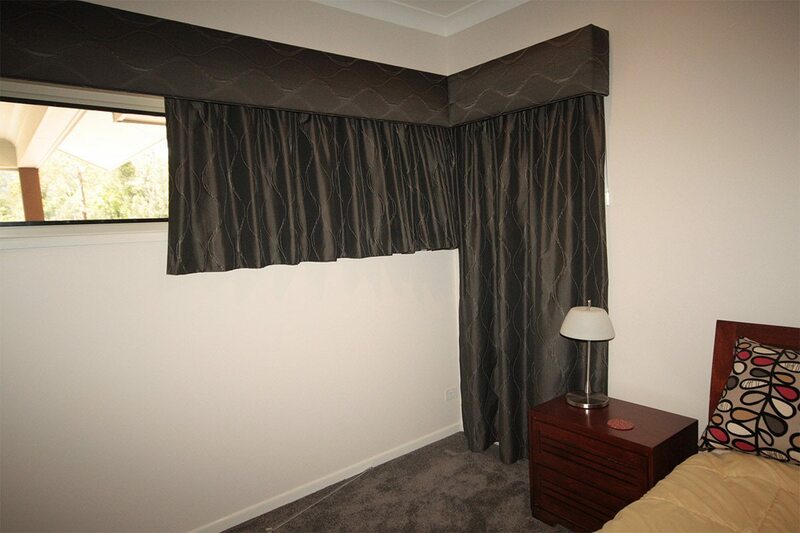 S Fold block out curtain pulling one way installed into the ceiling. 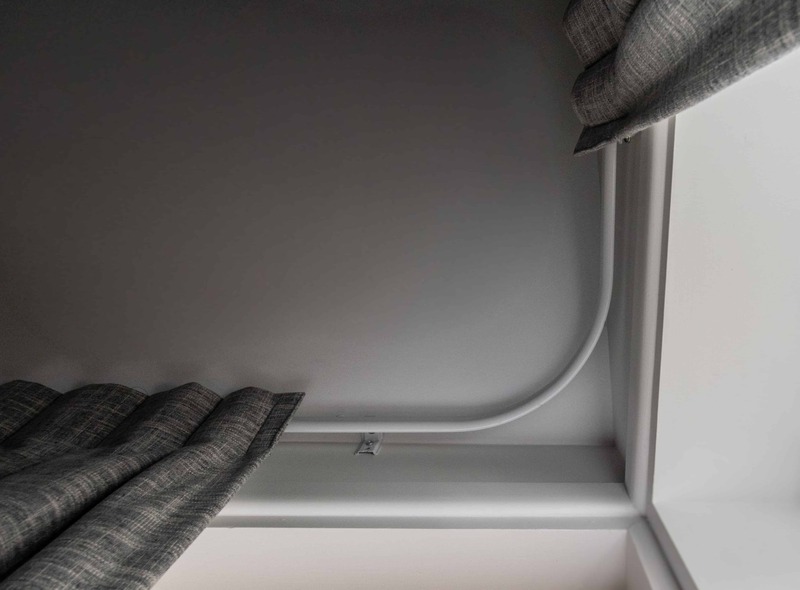 Double pinch pleat sheer installed into the ceiling on a bent series 58 track (small profile) with block out lining behind. 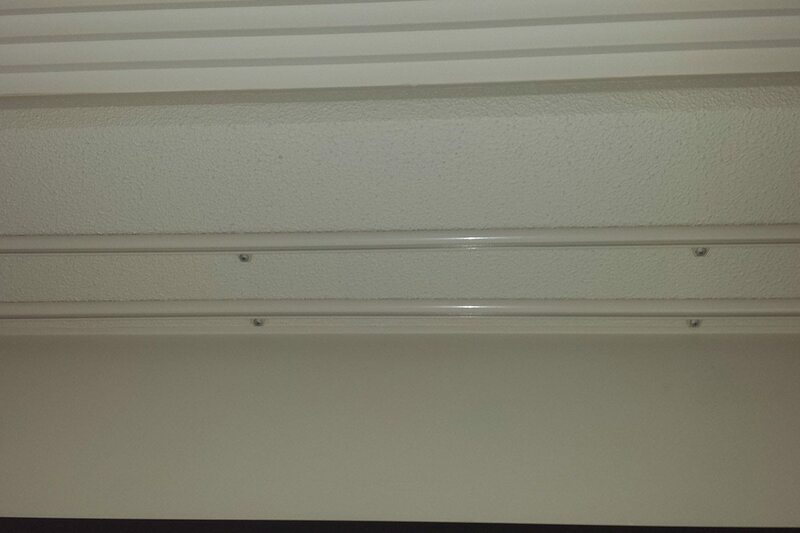 All pulling one way. 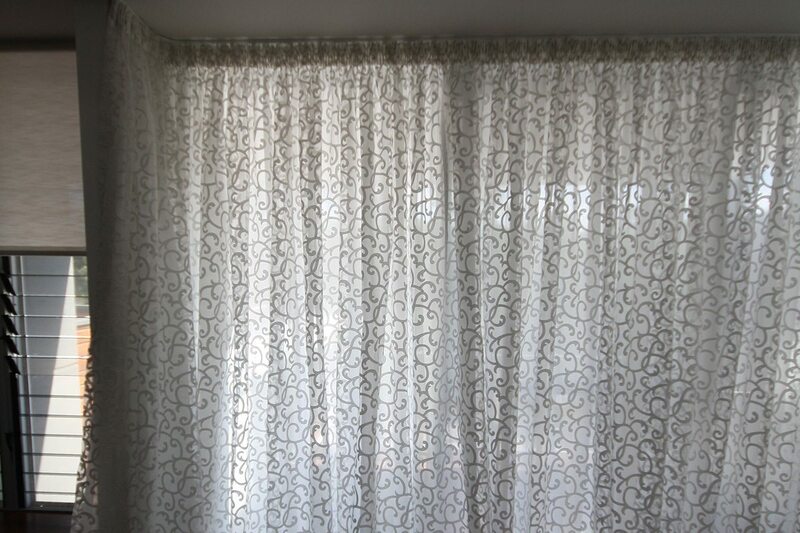 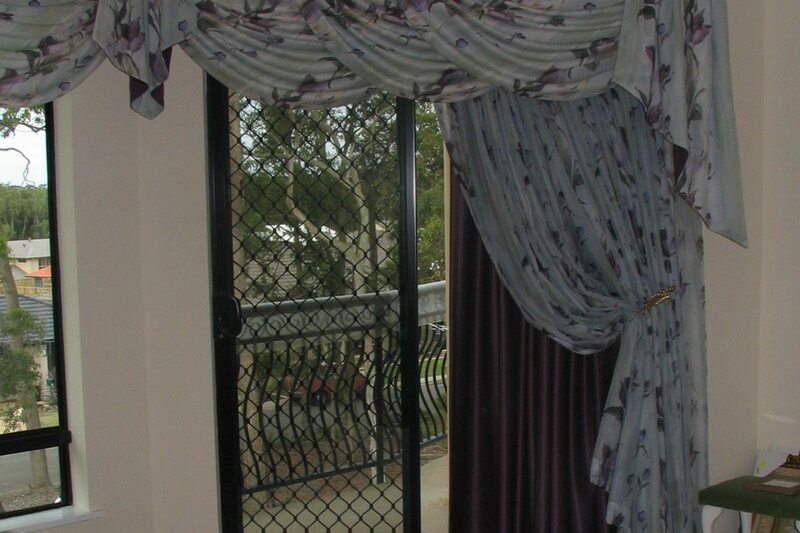 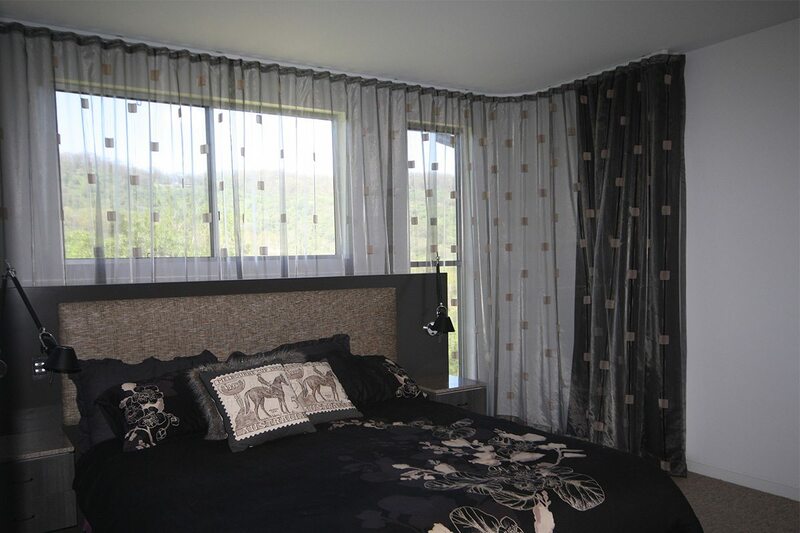 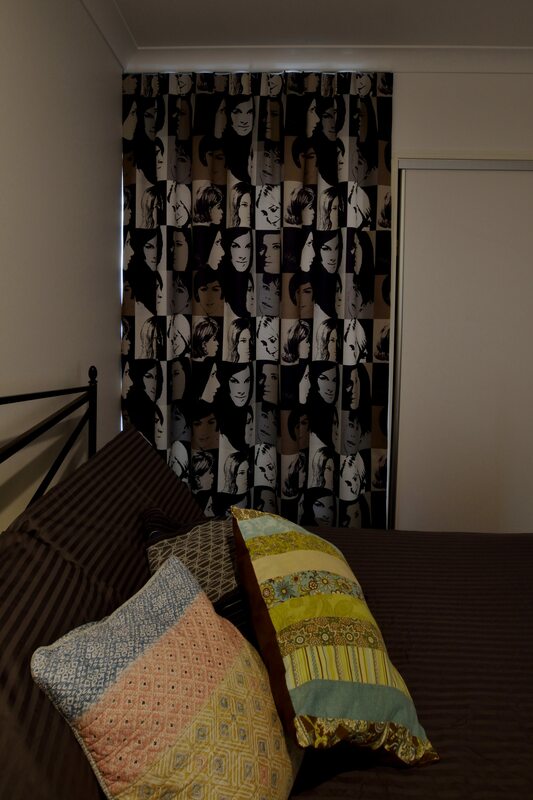 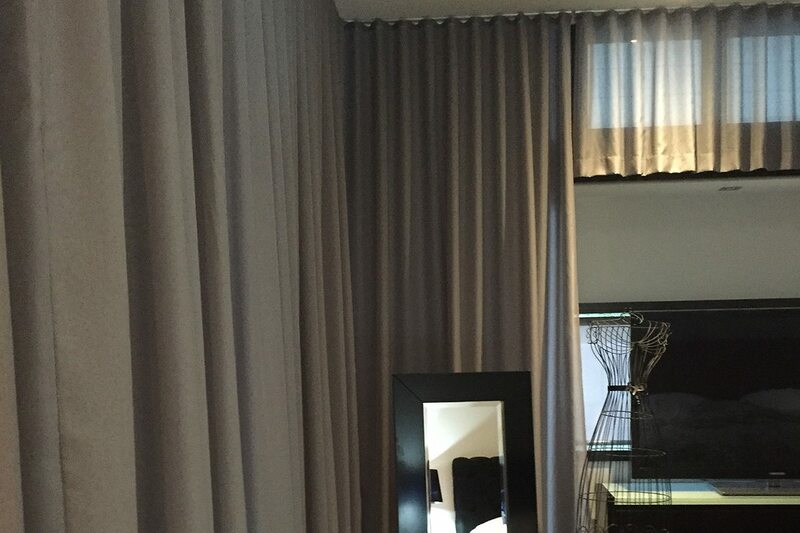 Printed sheer curtain from the ceiling installed S Fold track with block out lining behind. 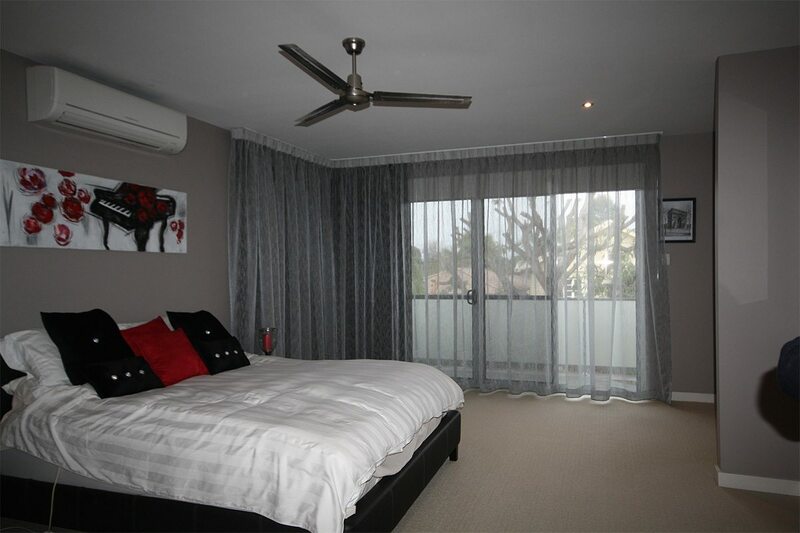 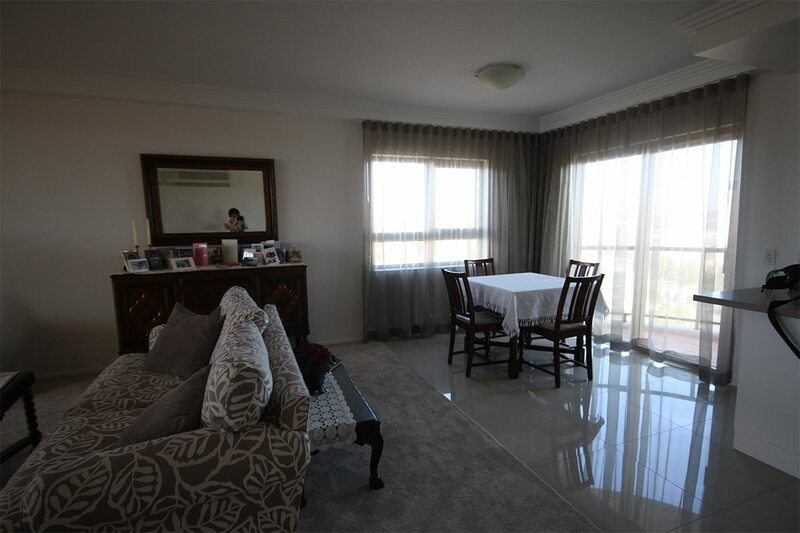 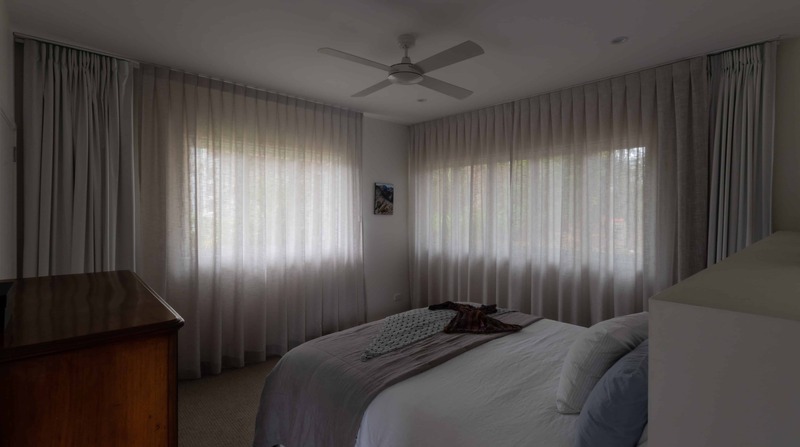 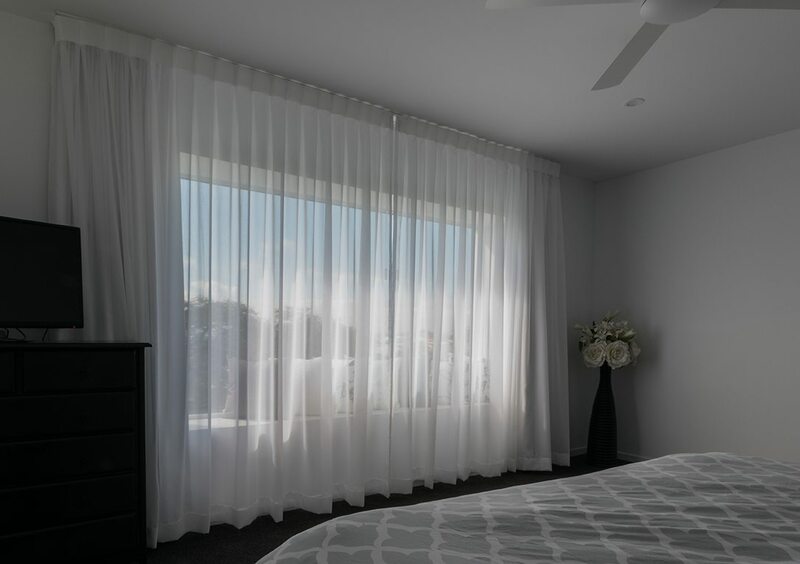 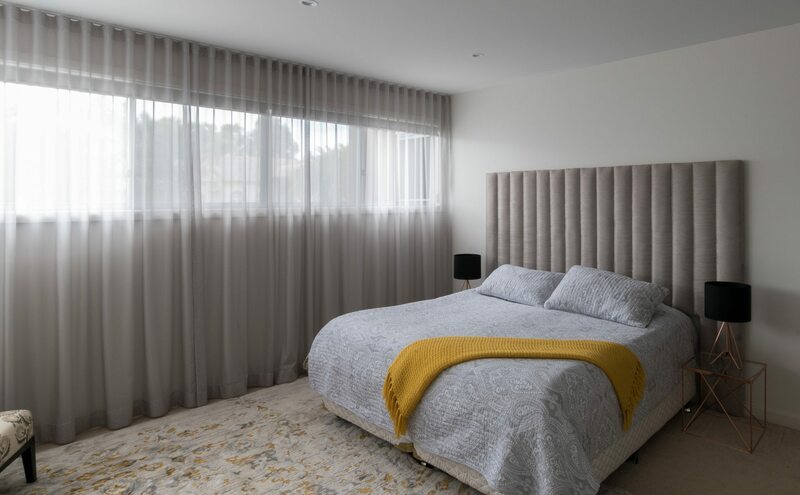 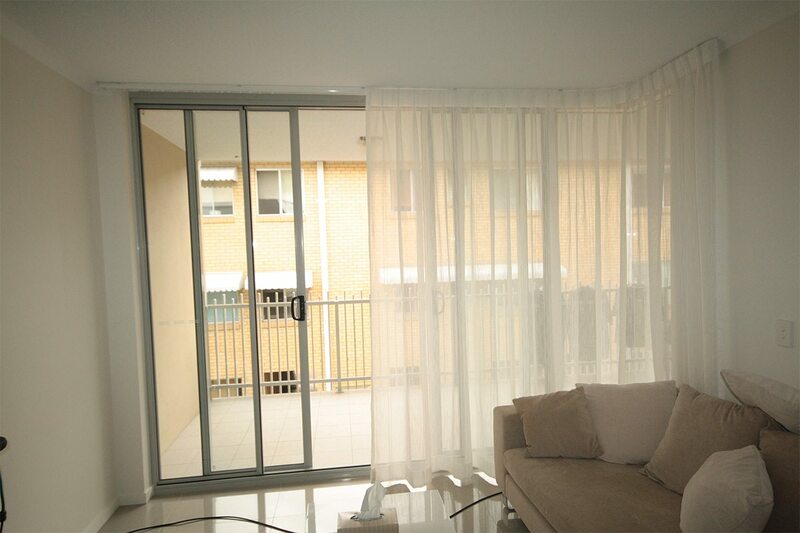 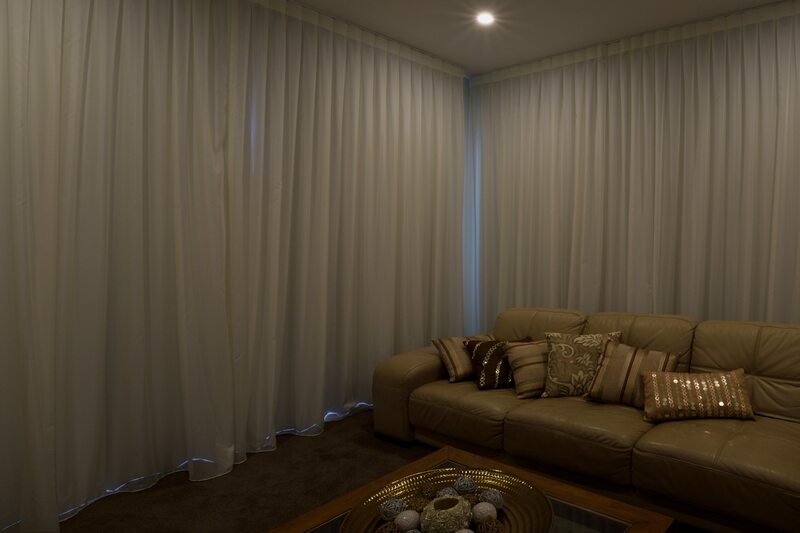 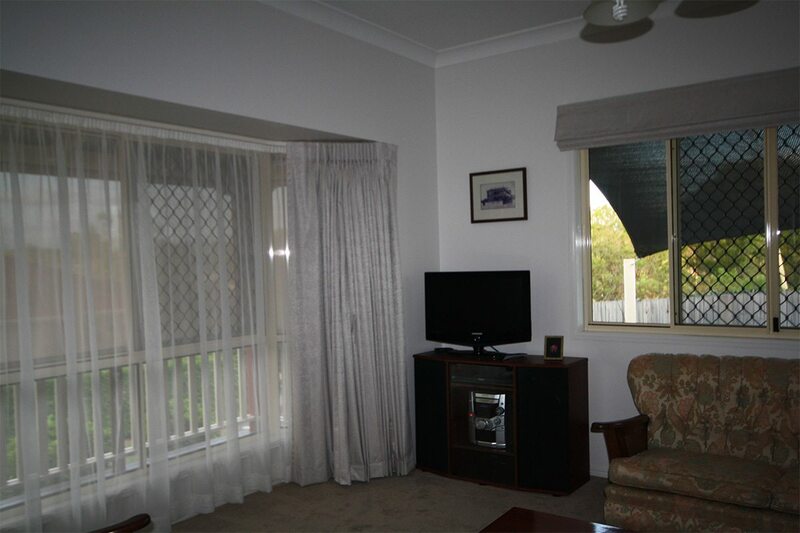 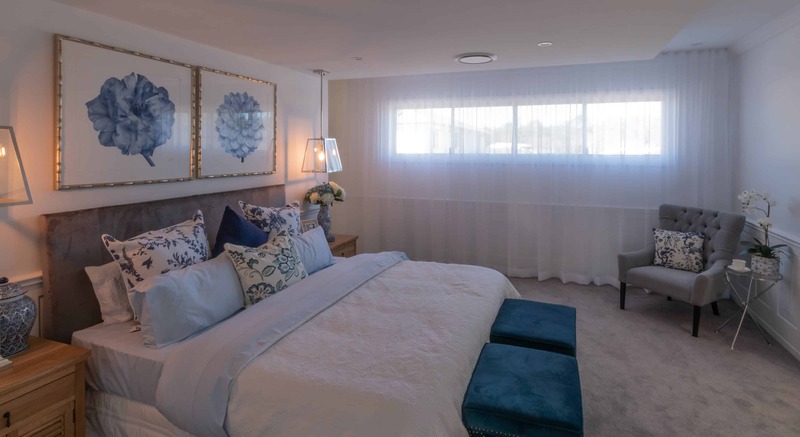 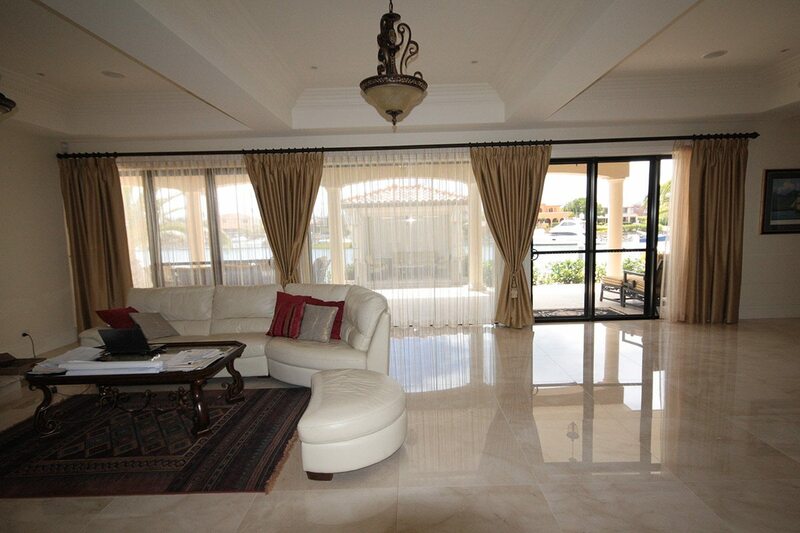 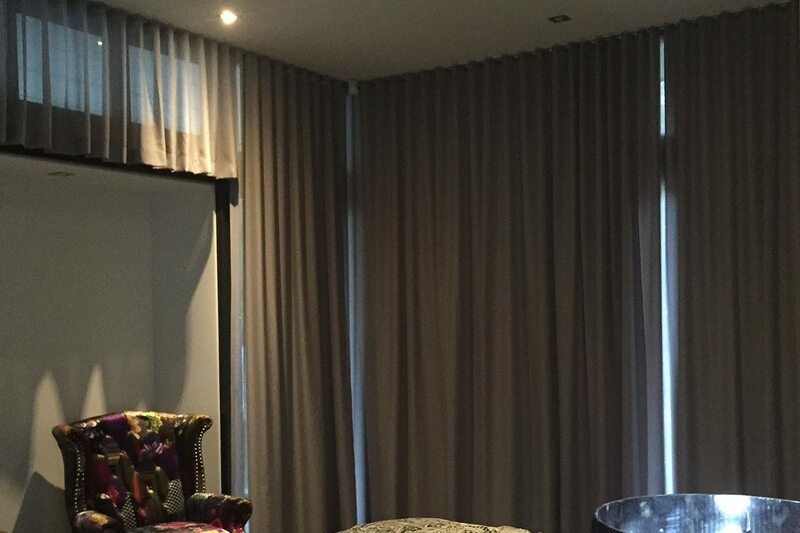 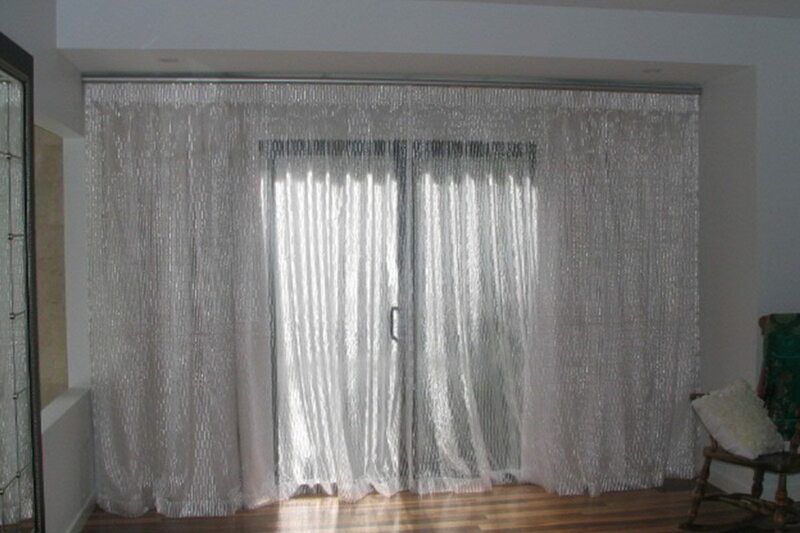 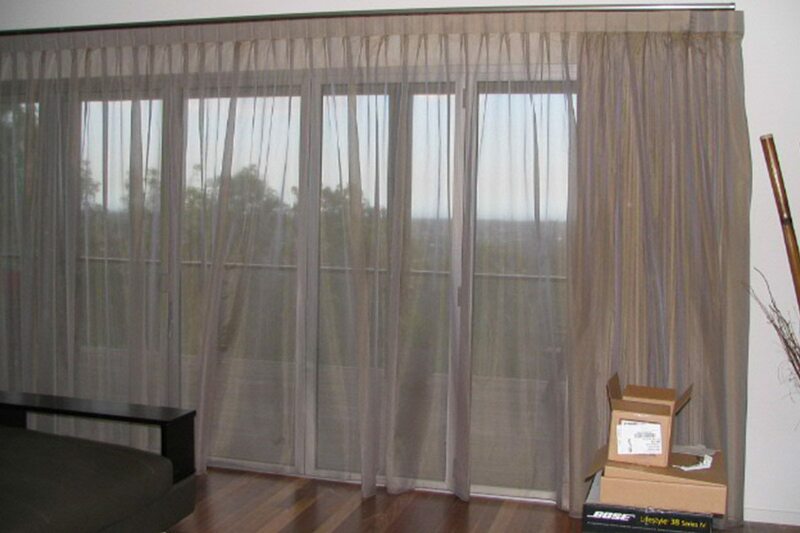 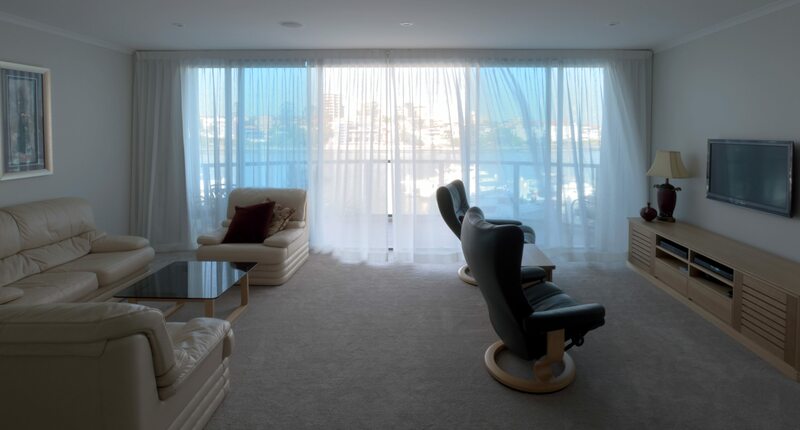 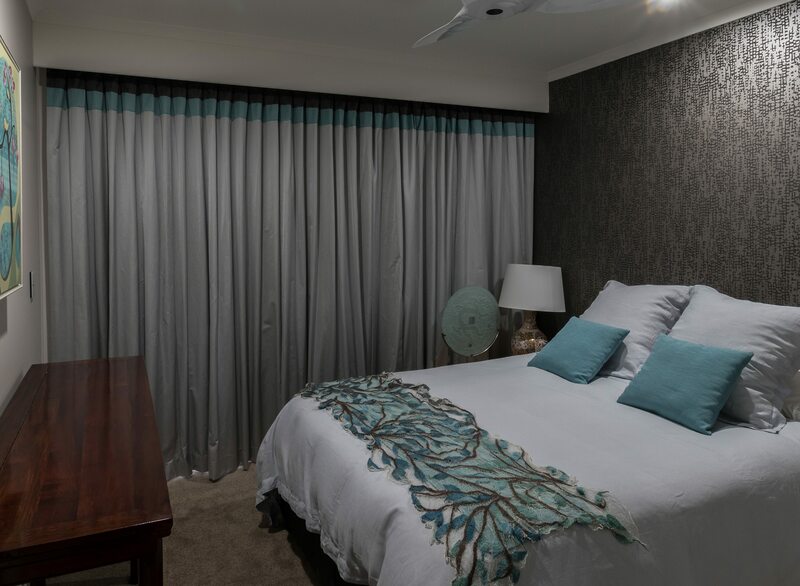 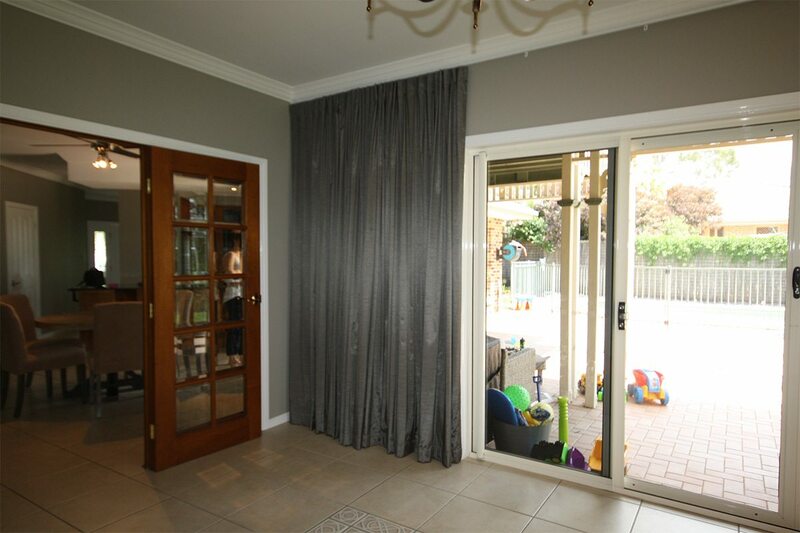 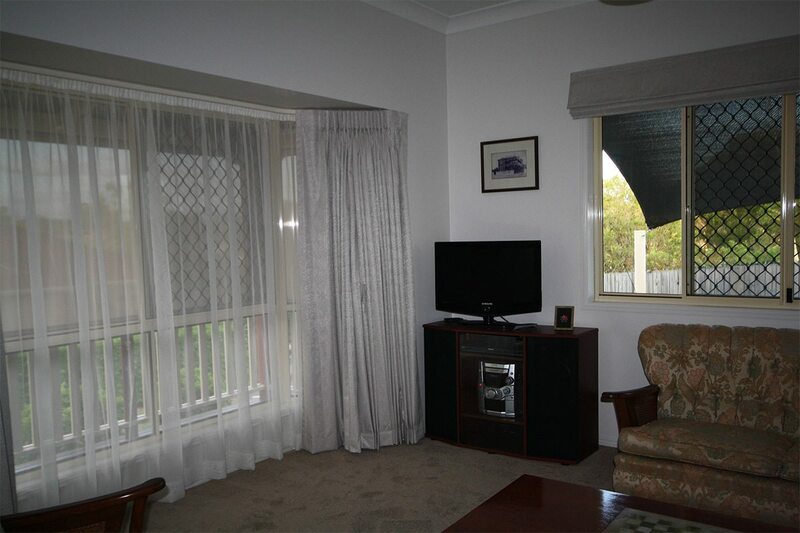 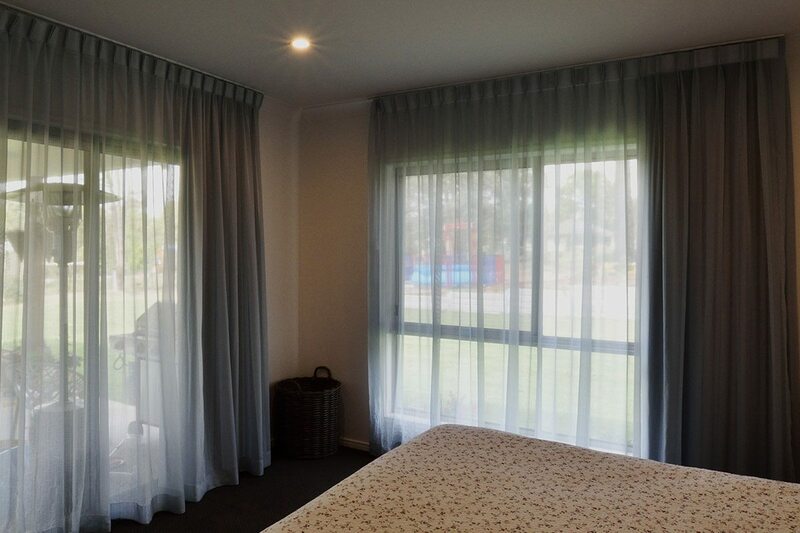 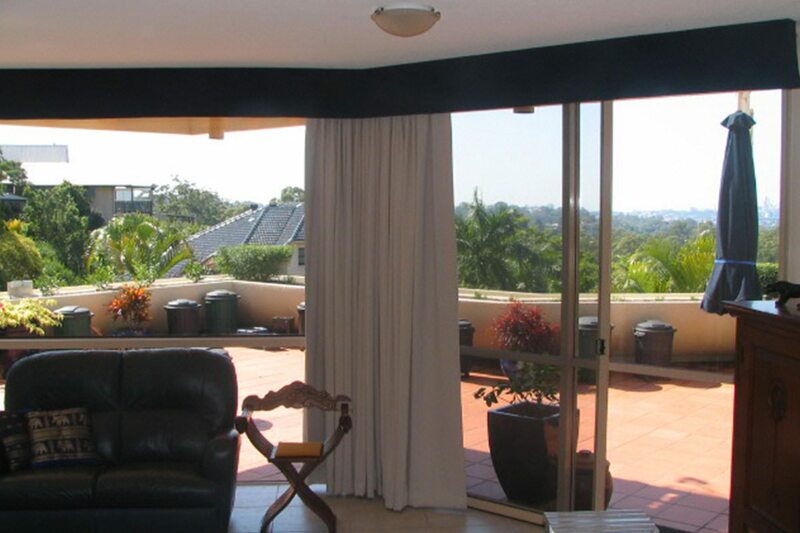 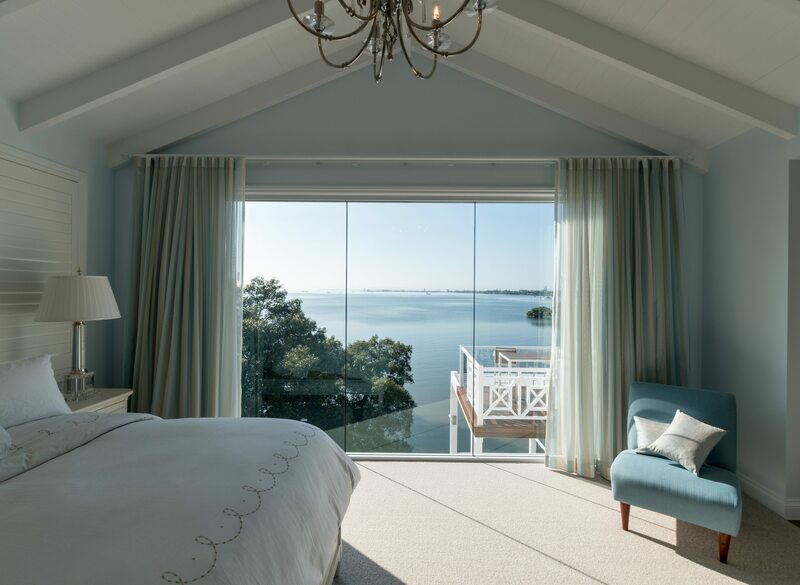 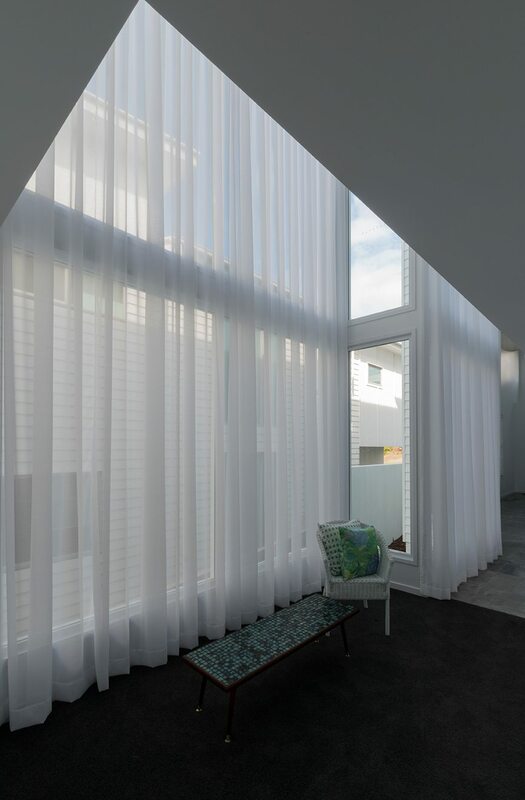 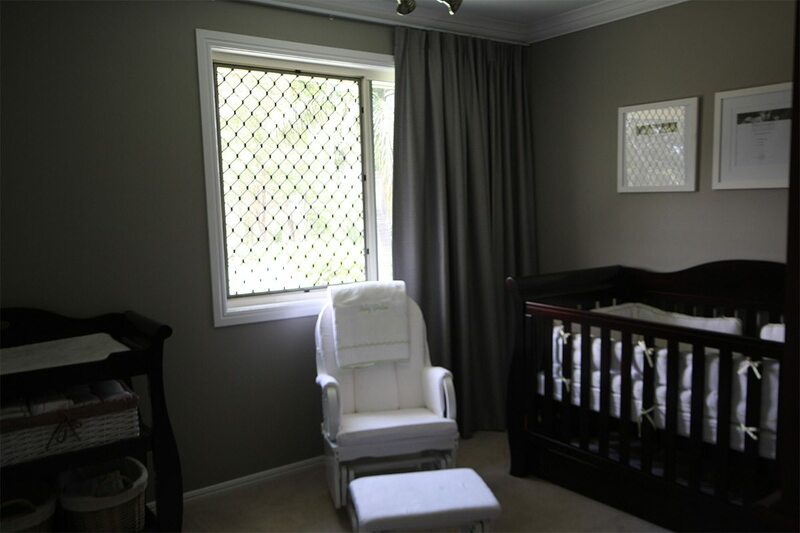 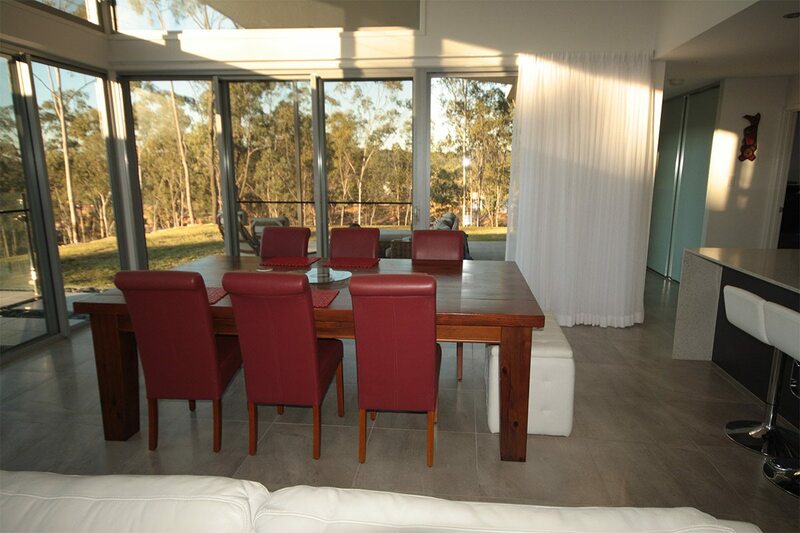 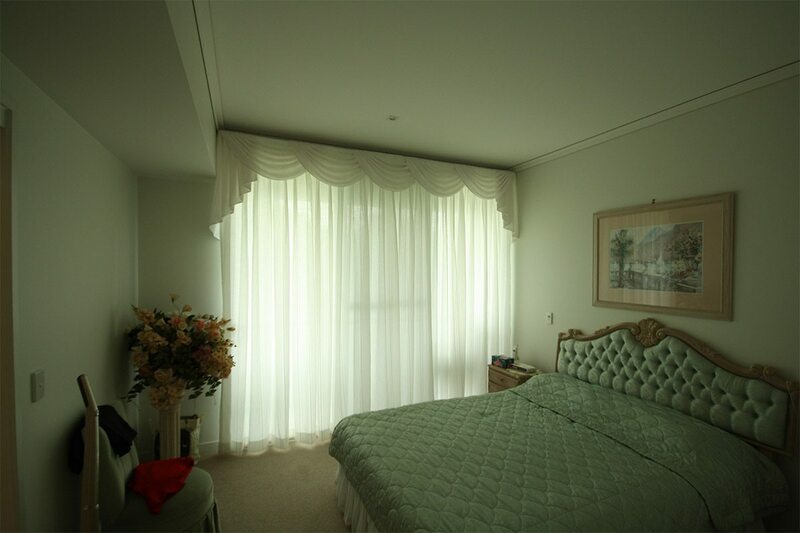 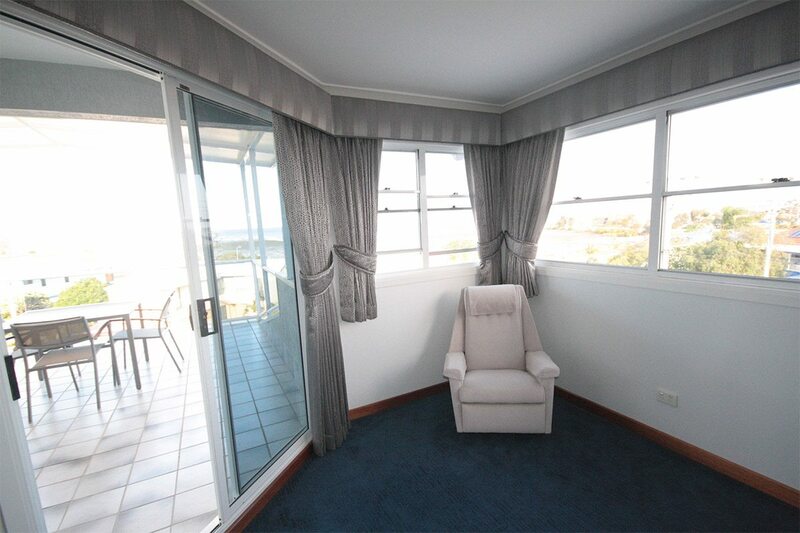 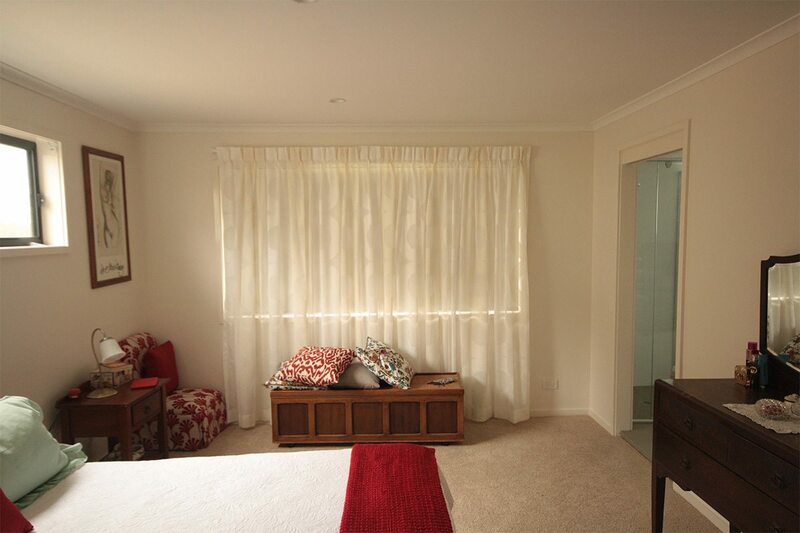 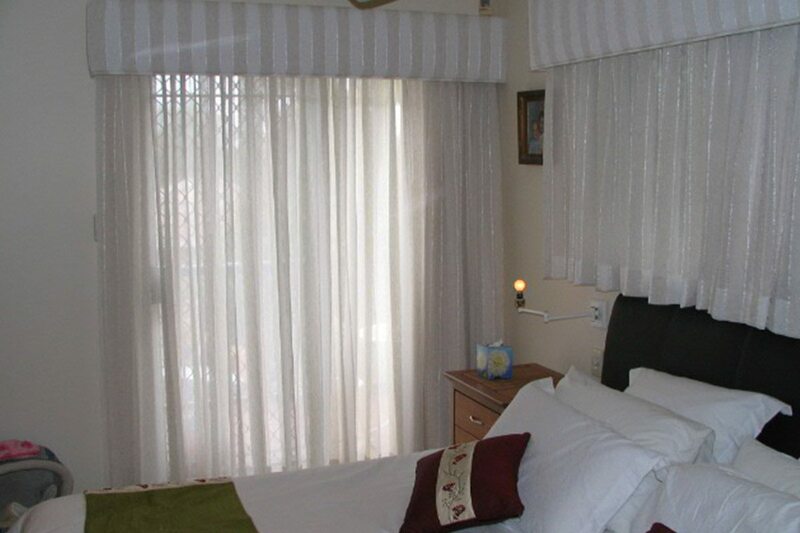 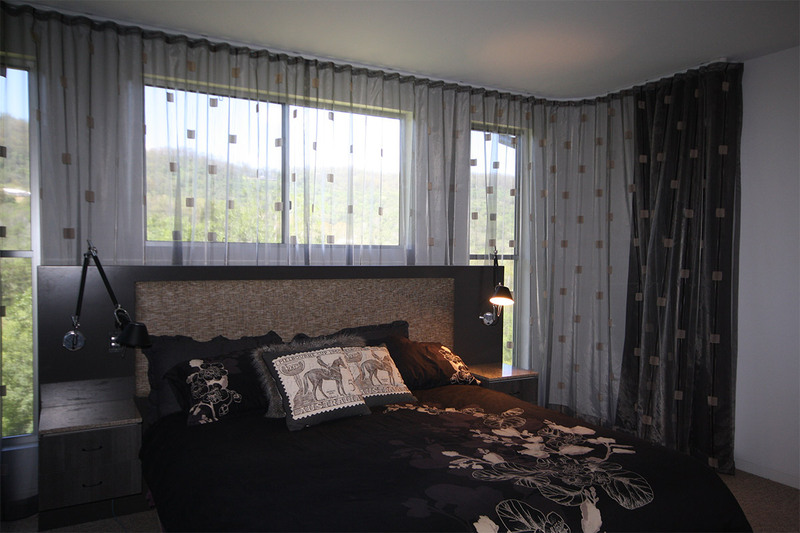 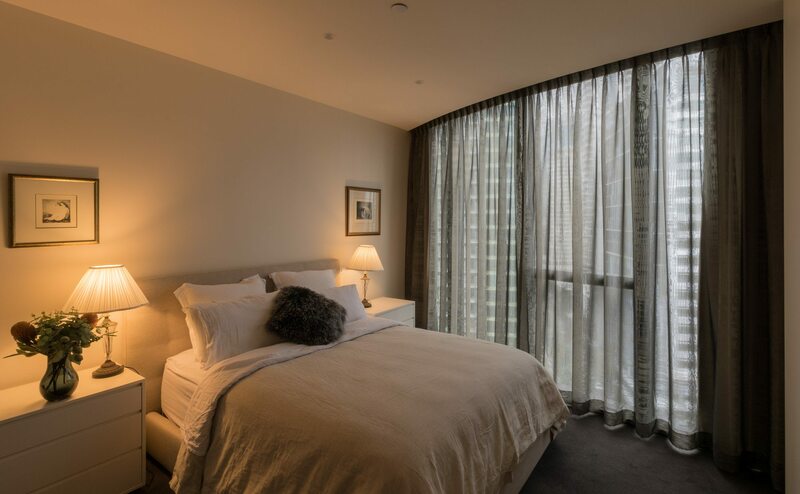 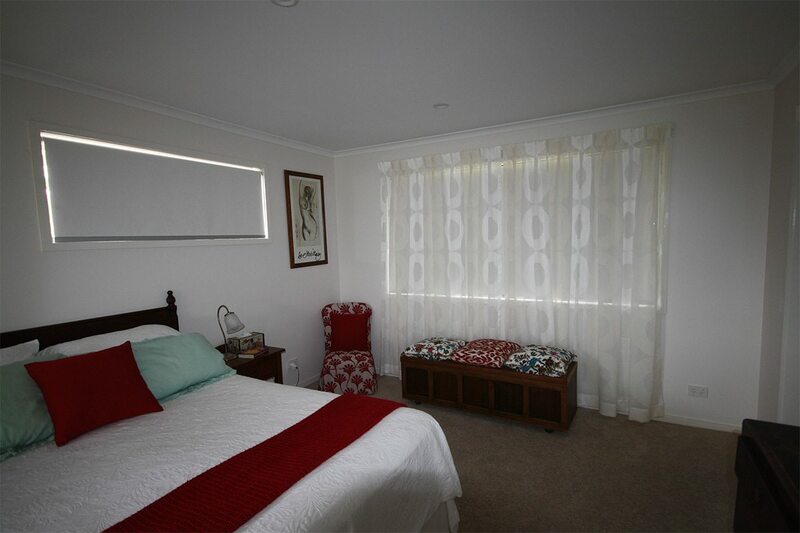 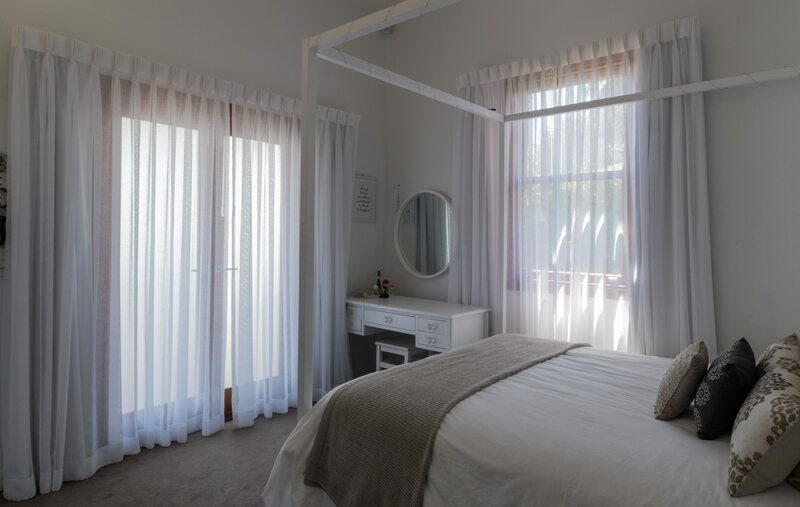 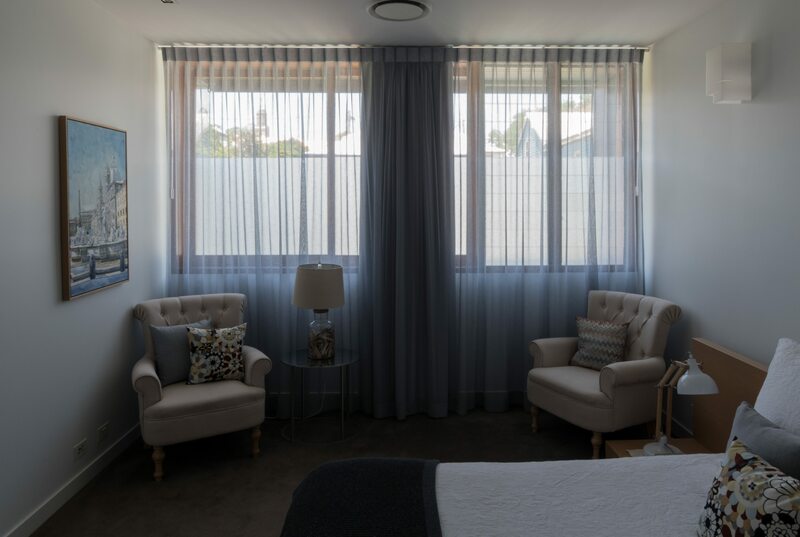 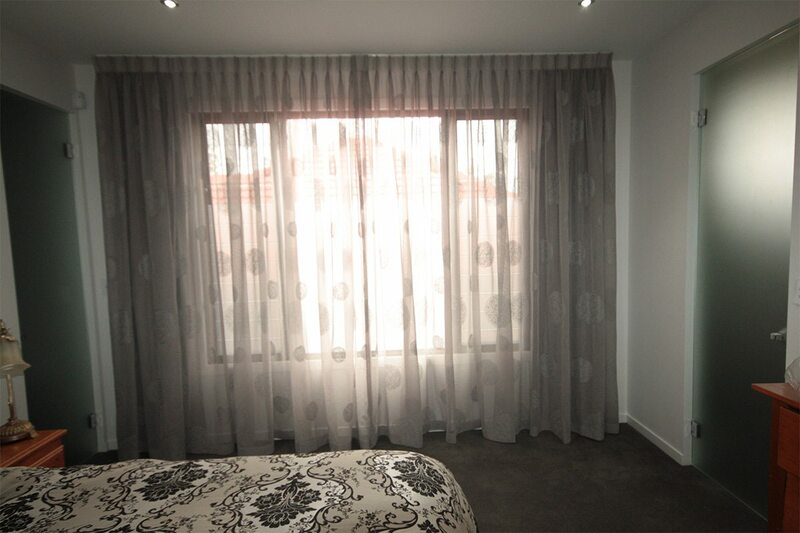 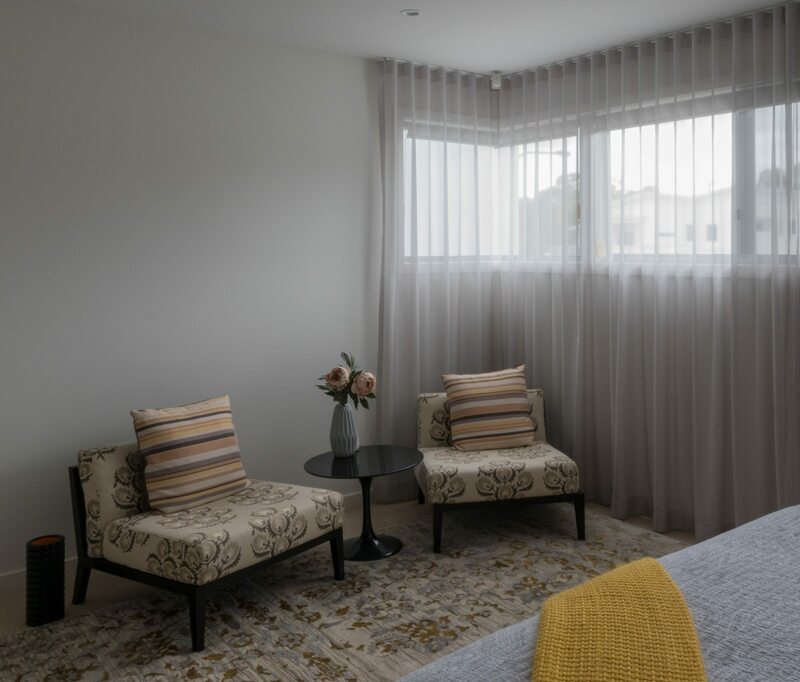 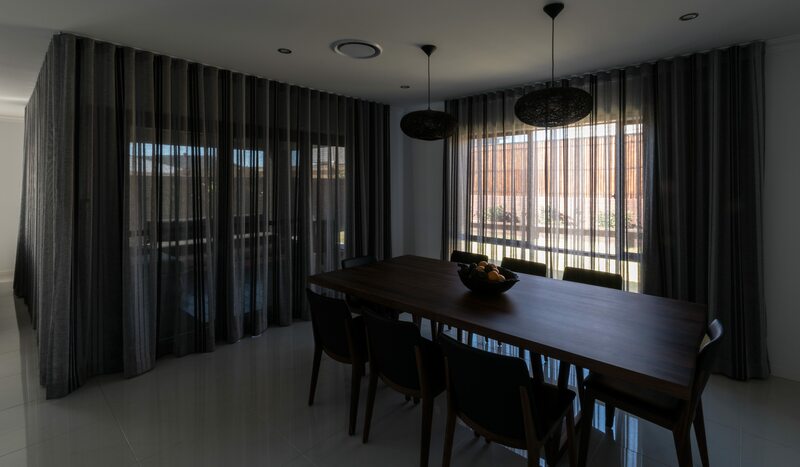 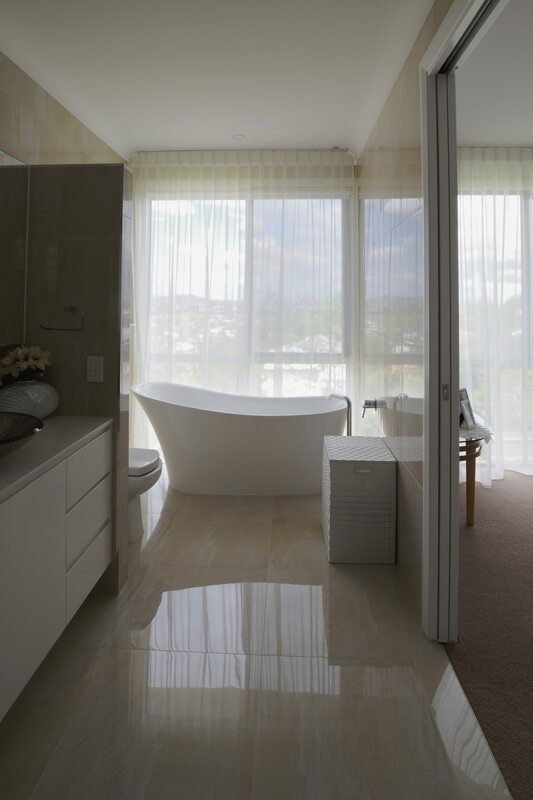 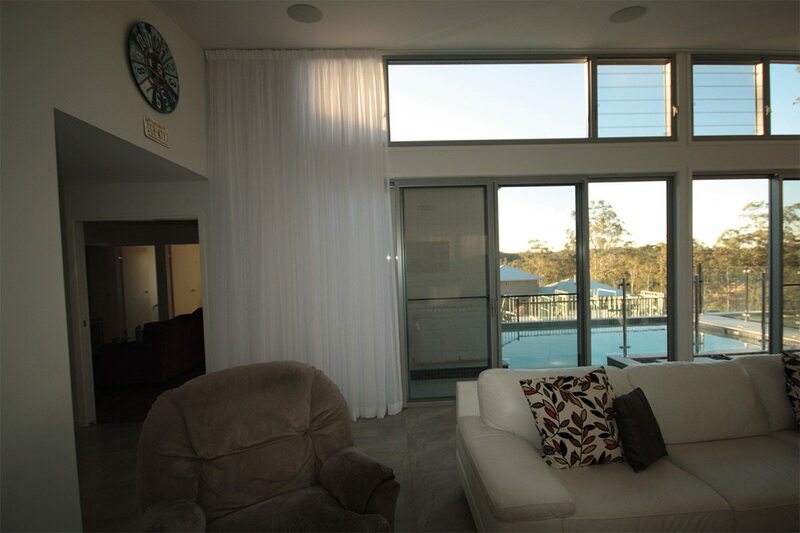 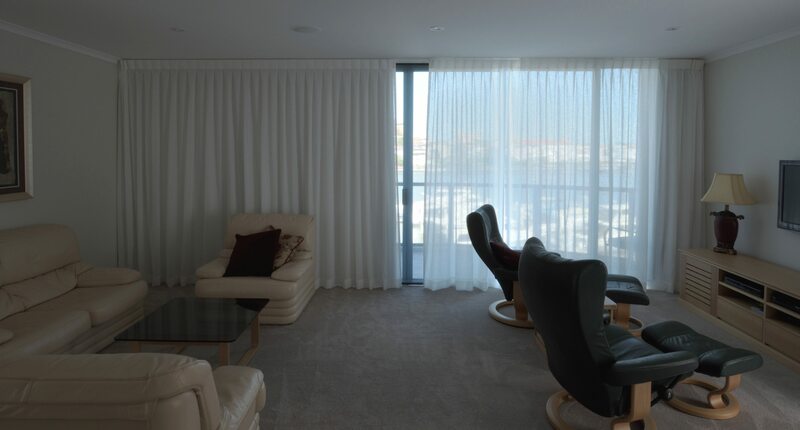 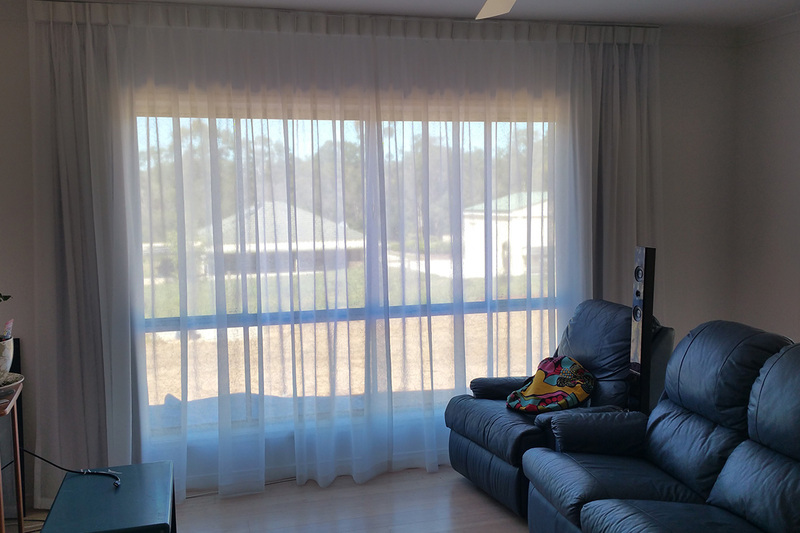 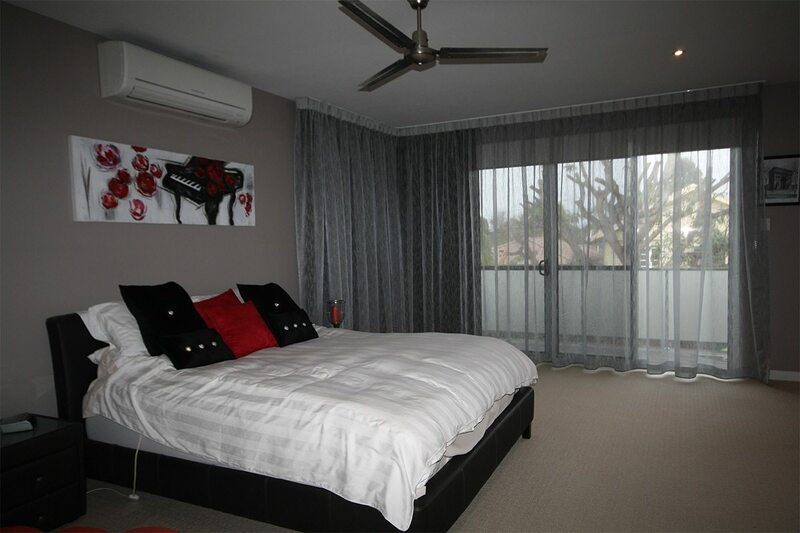 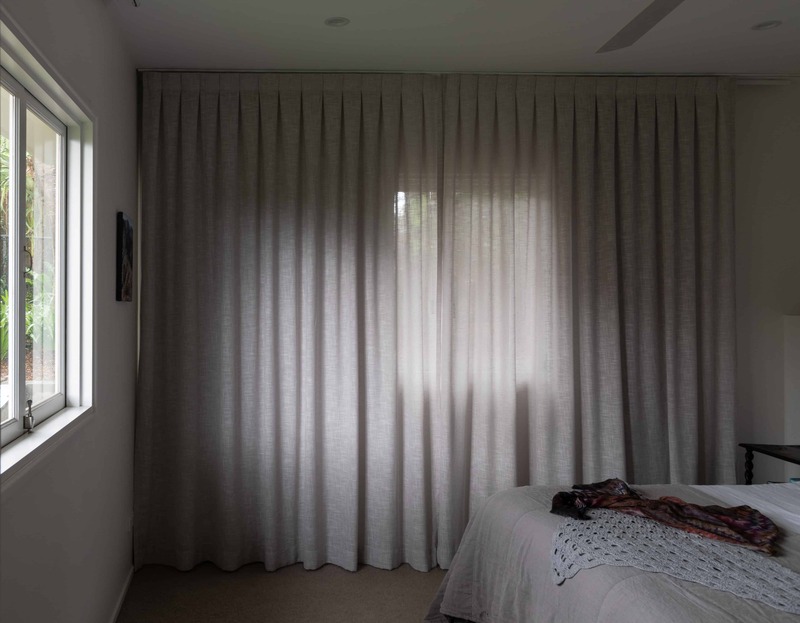 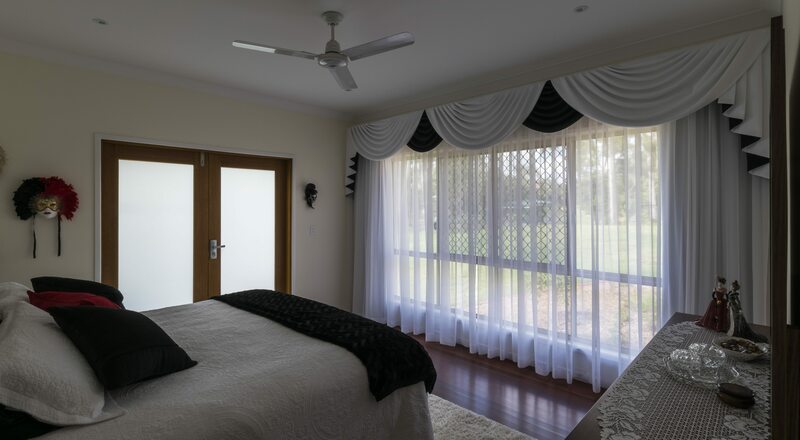 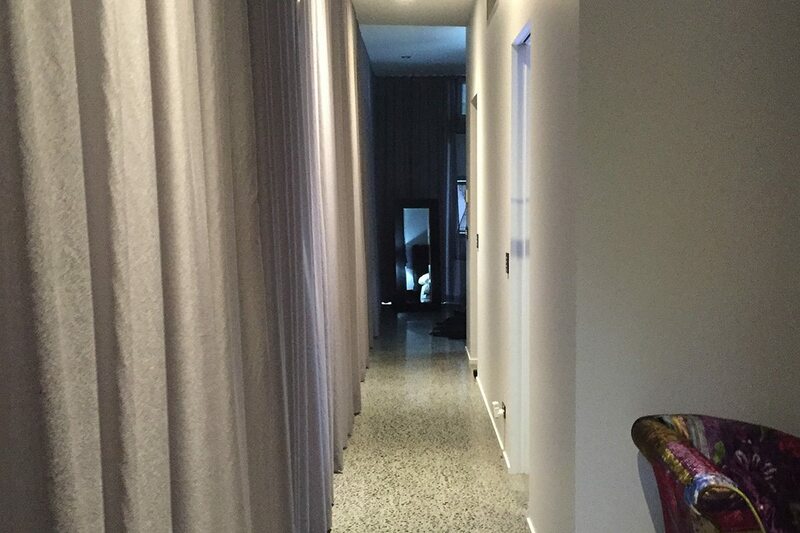 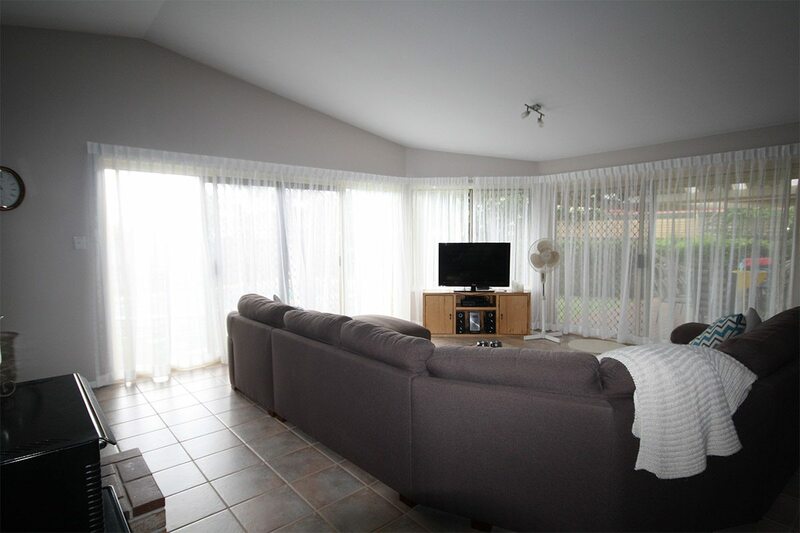 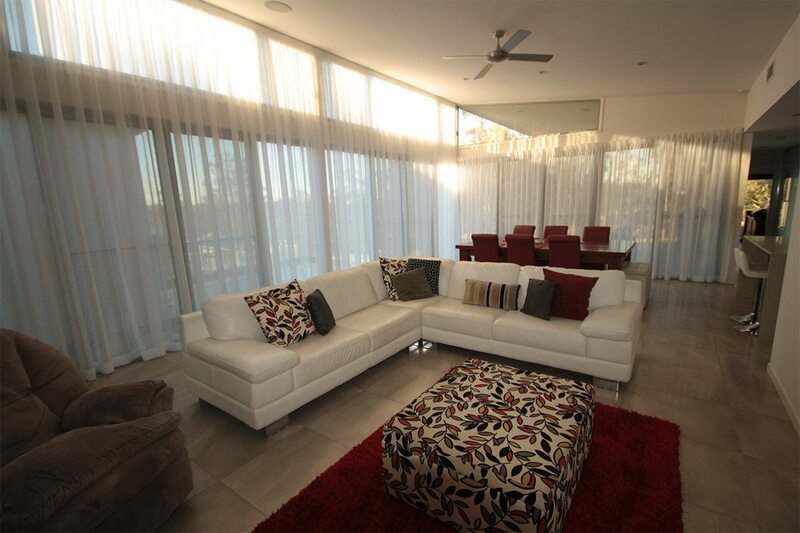 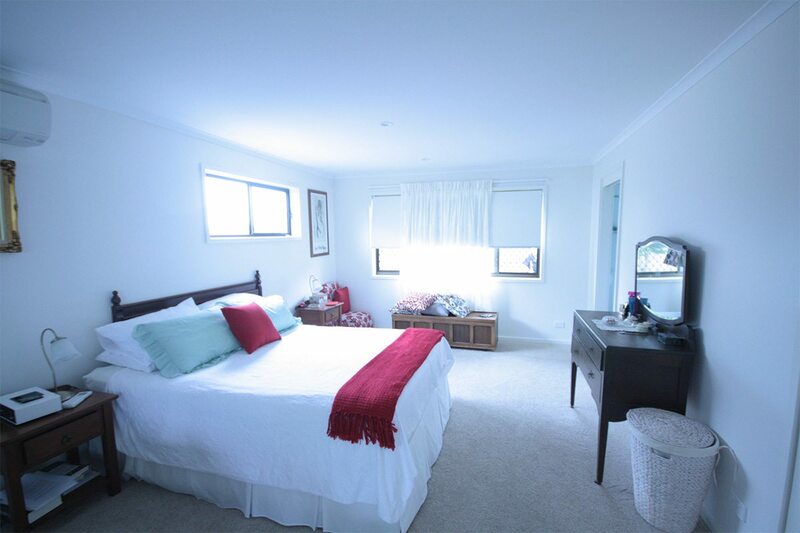 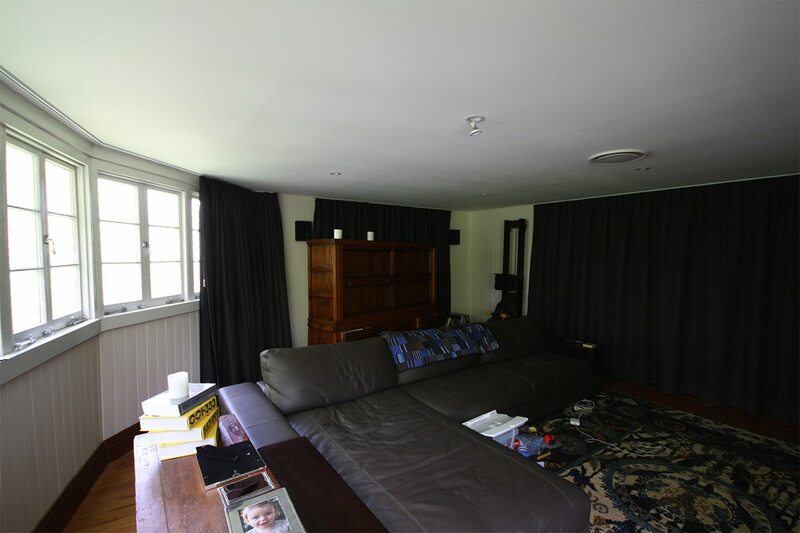 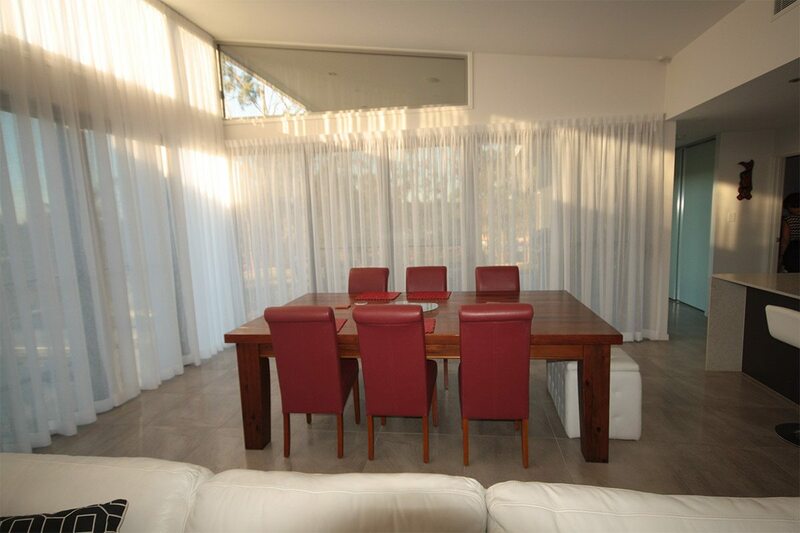 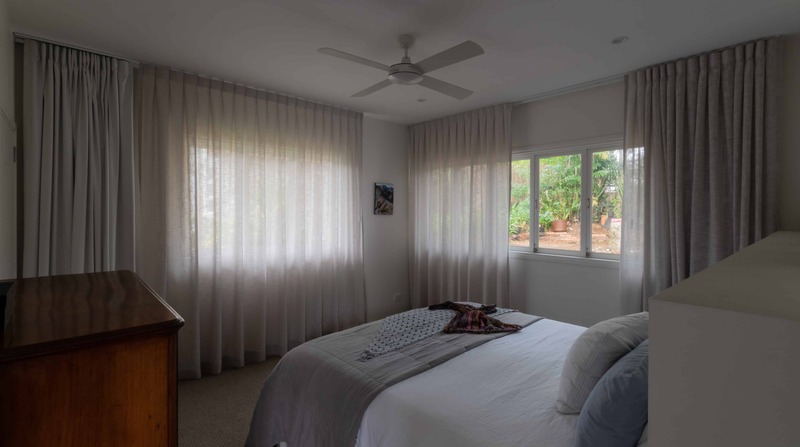 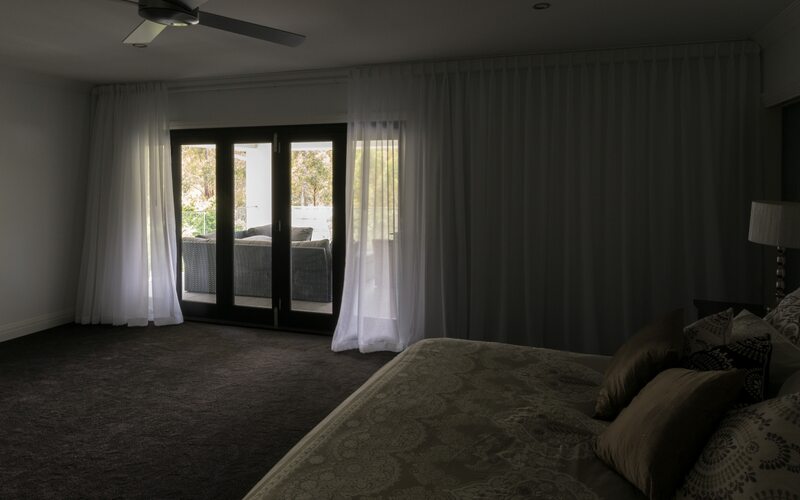 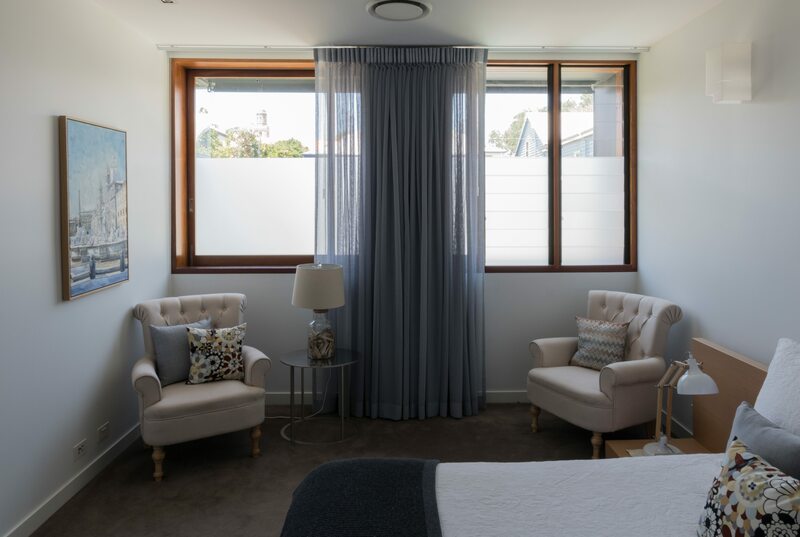 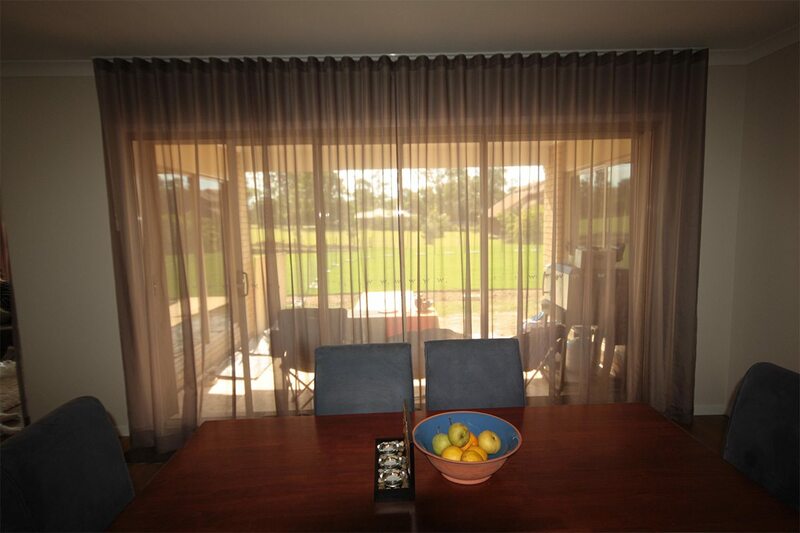 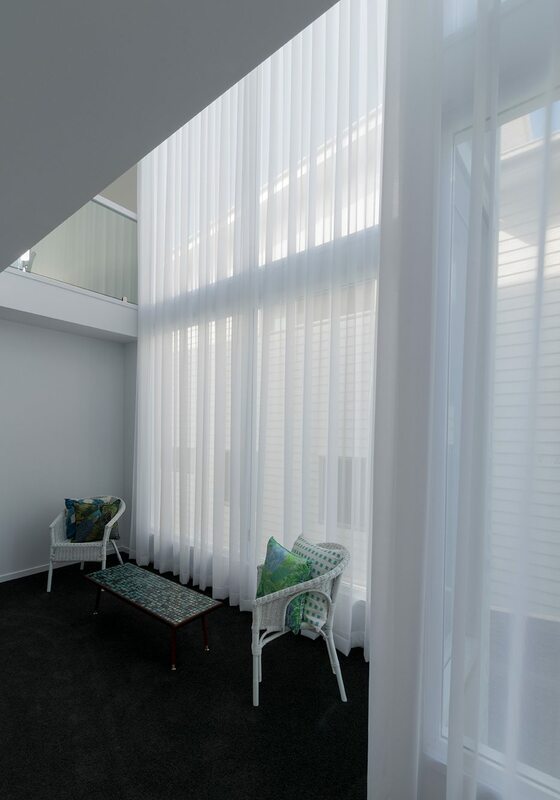 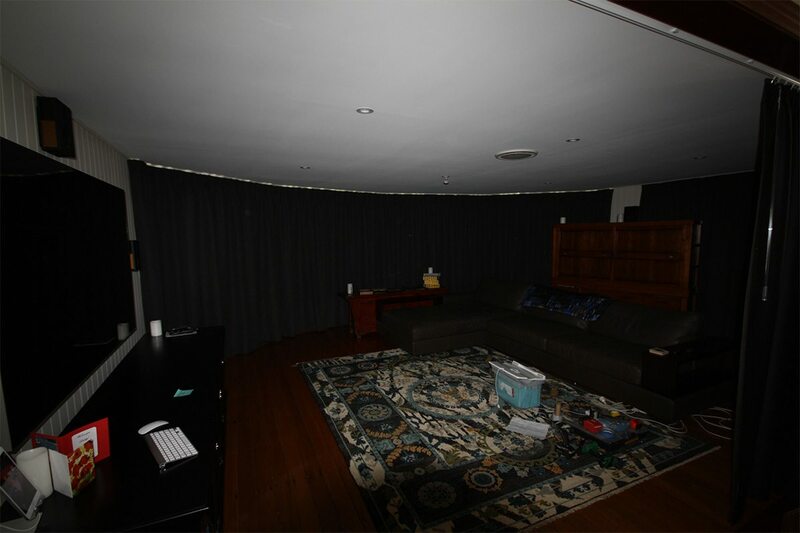 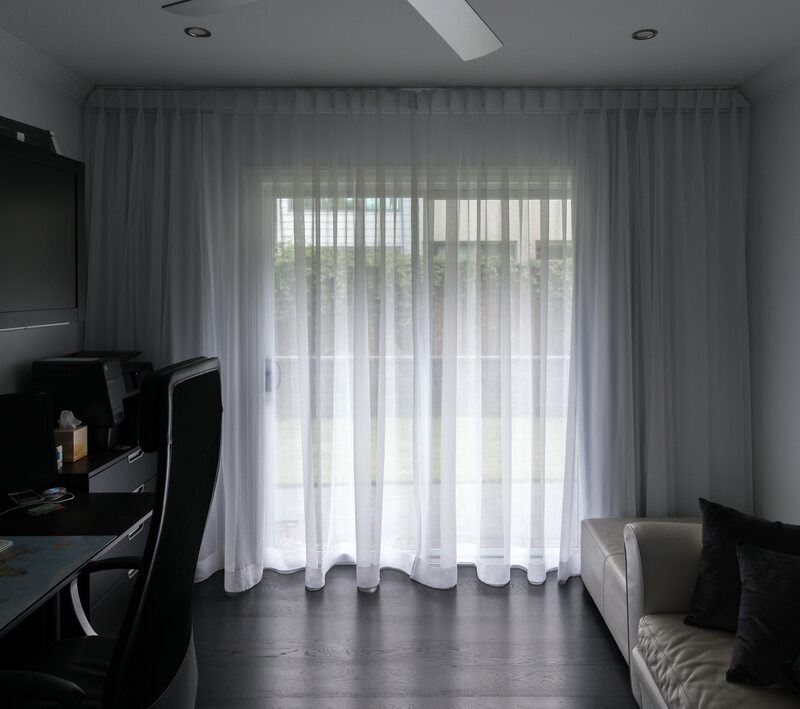 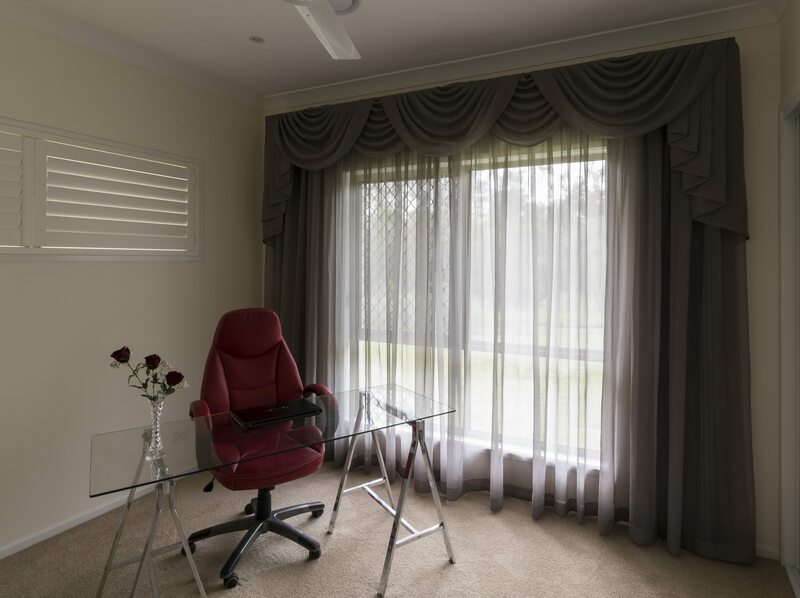 S Fold sheer curtain from the ceiling with block out roller blinds behind. 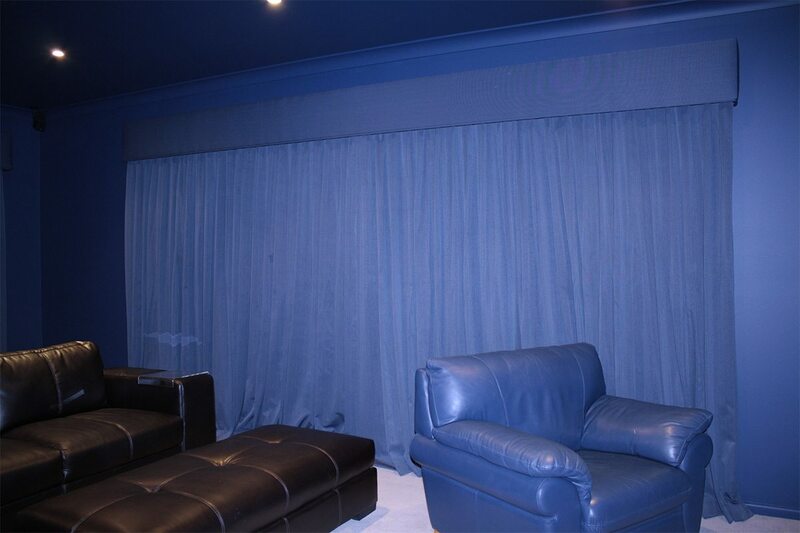 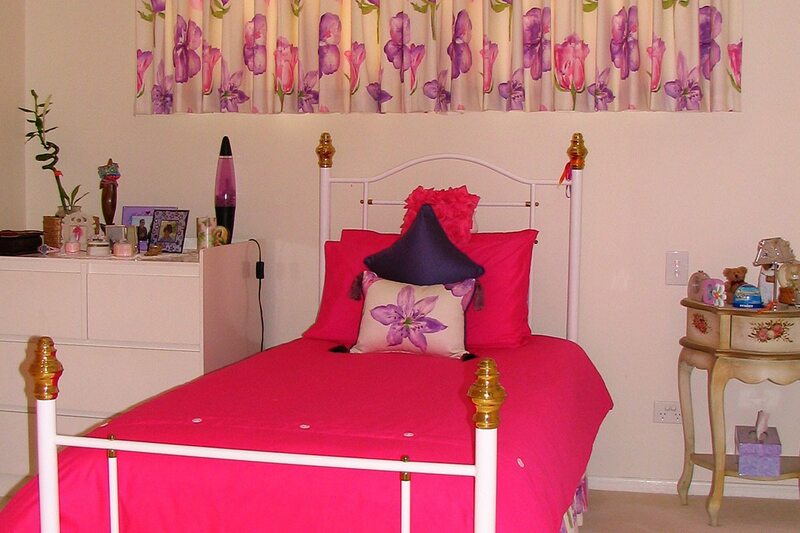 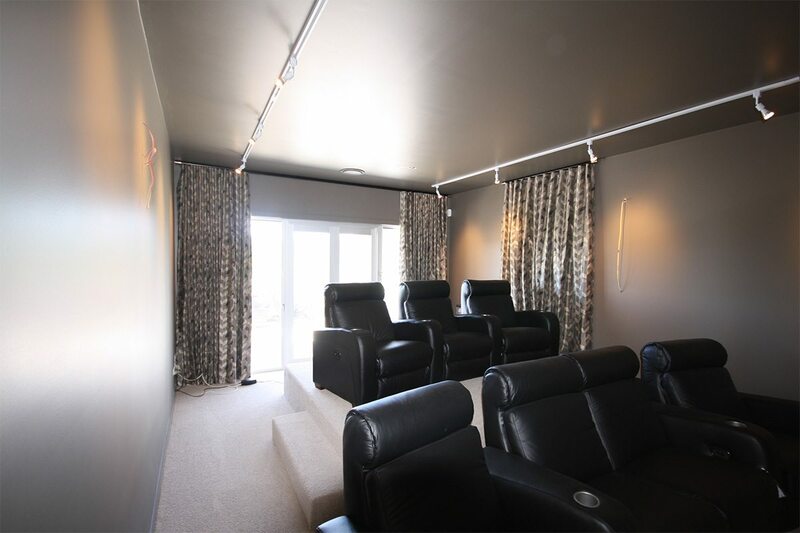 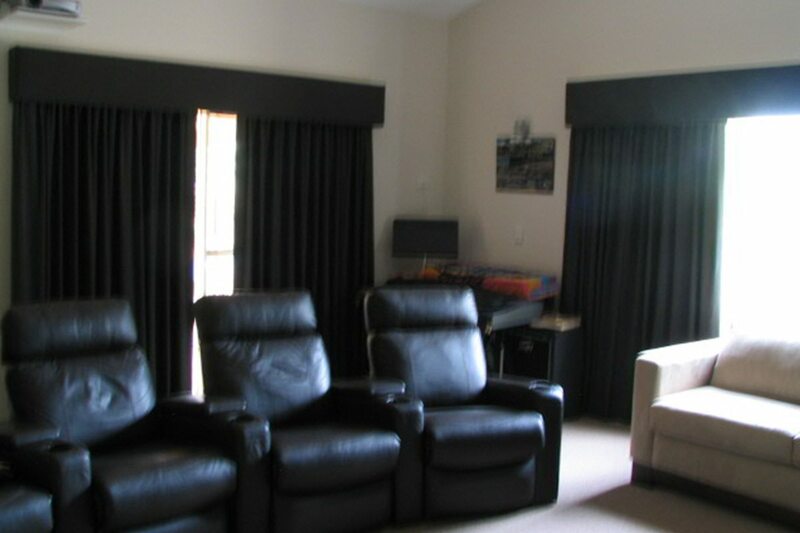 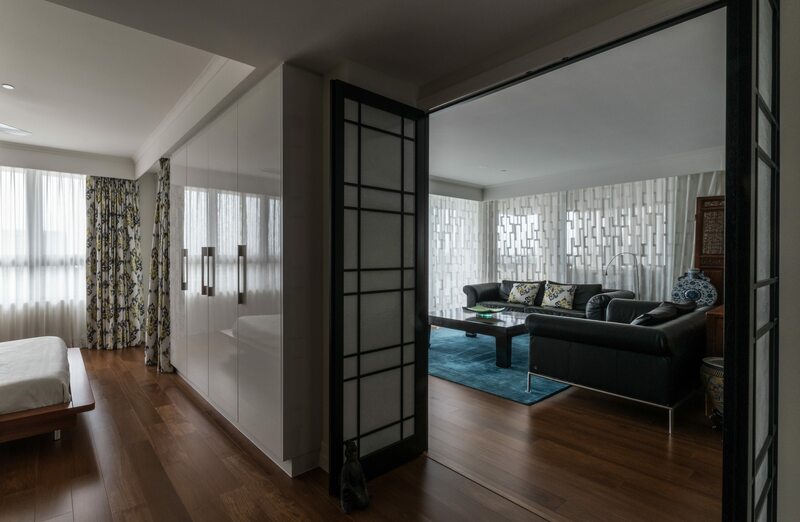 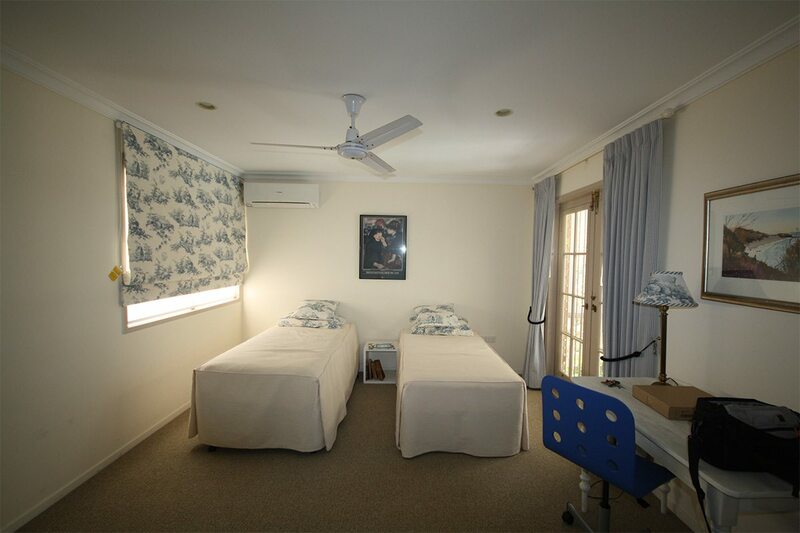 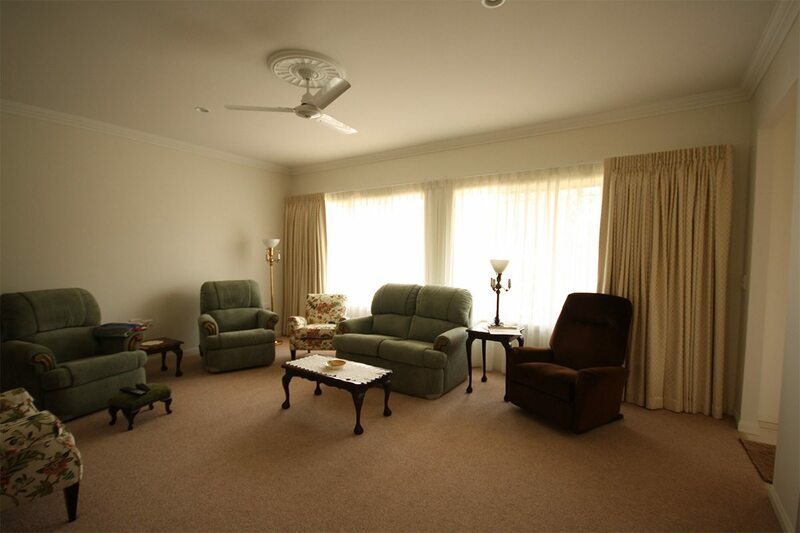 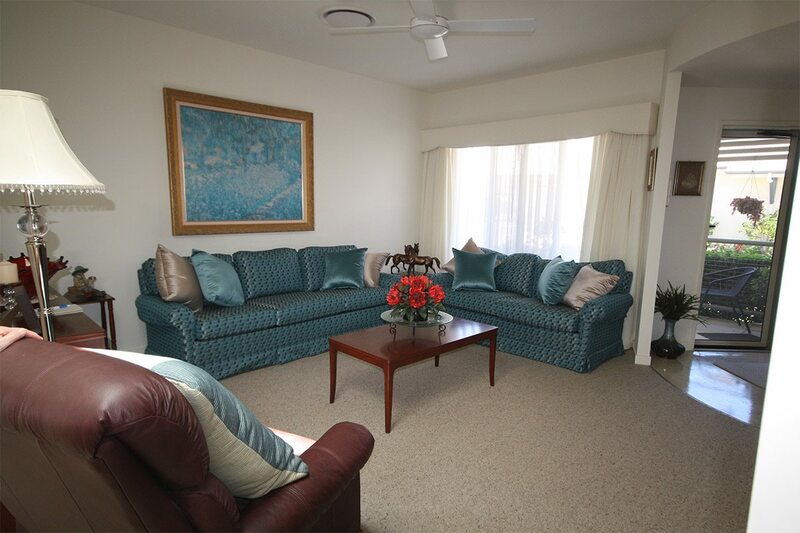 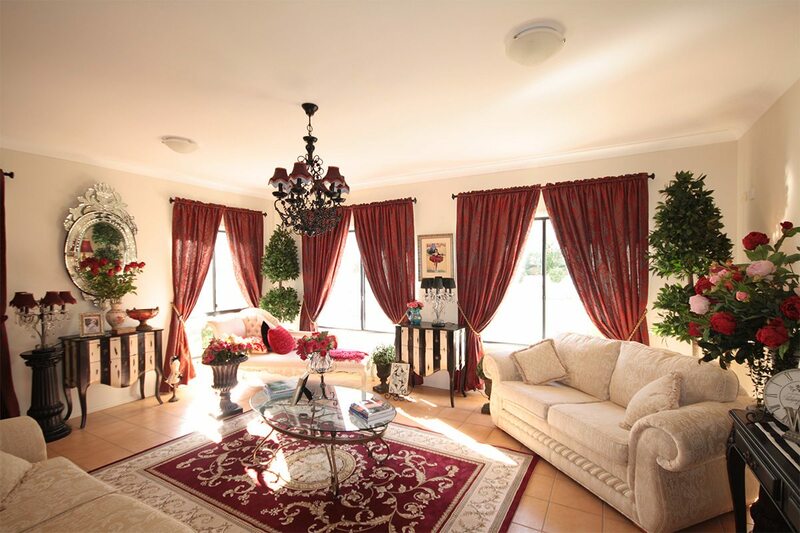 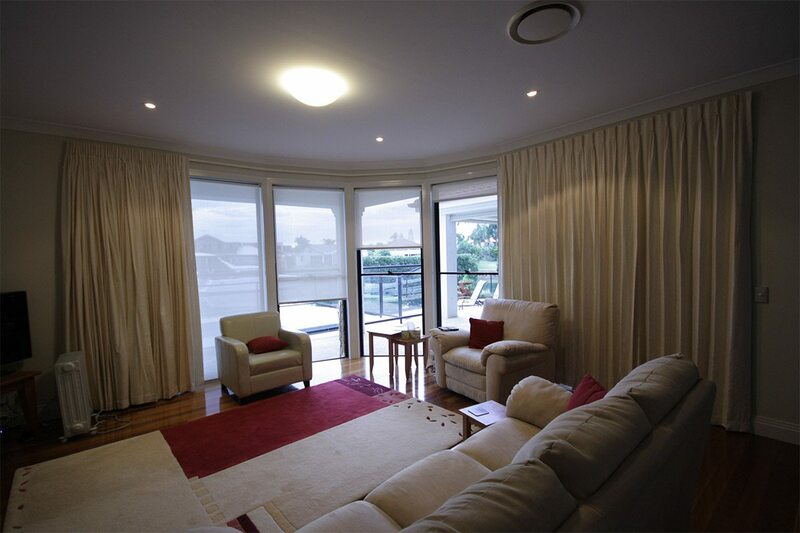 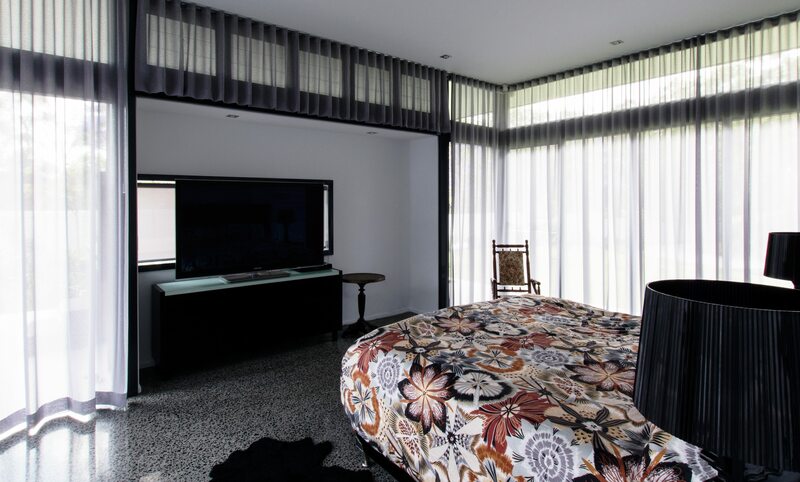 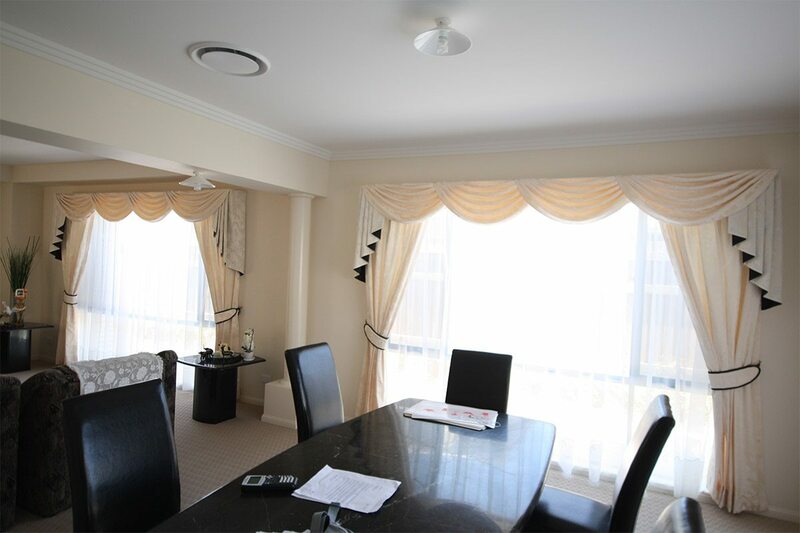 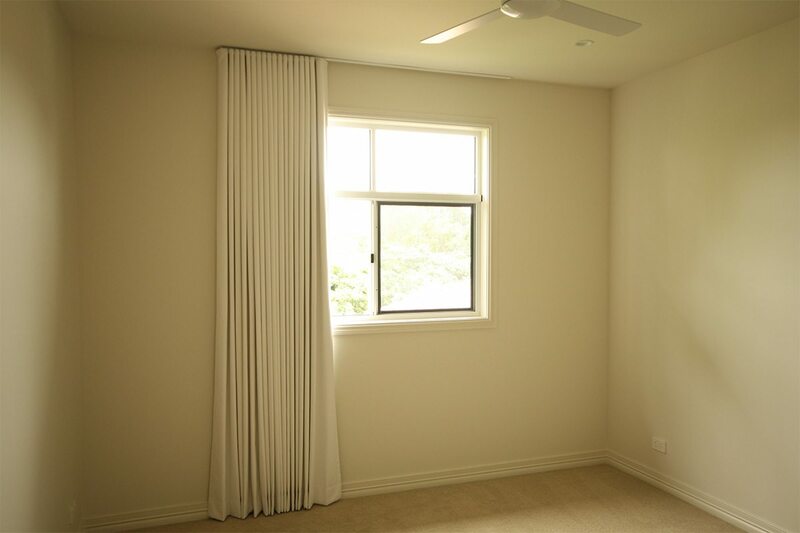 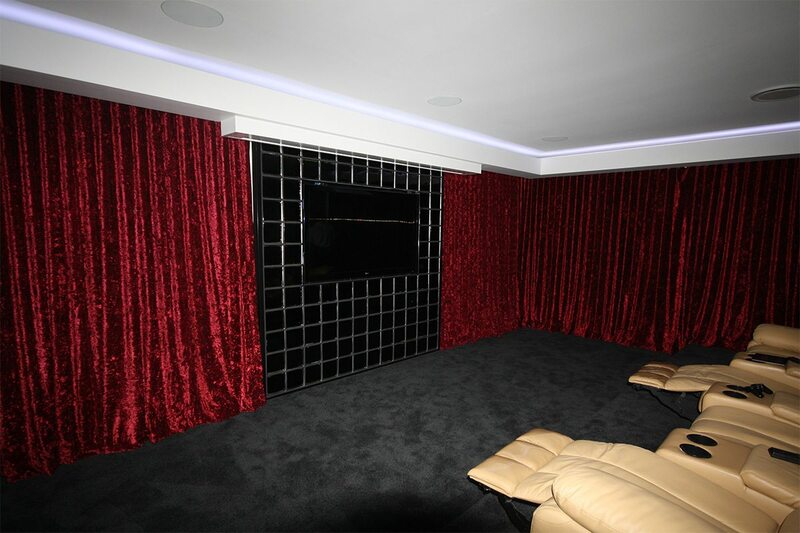 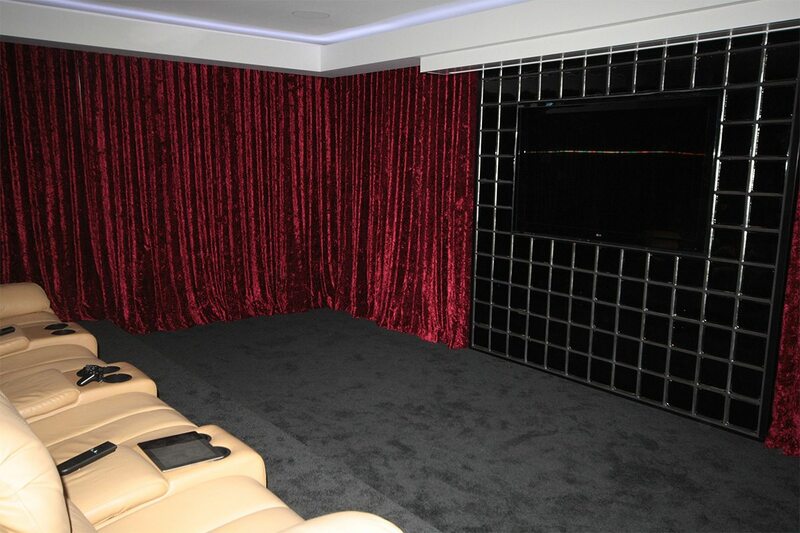 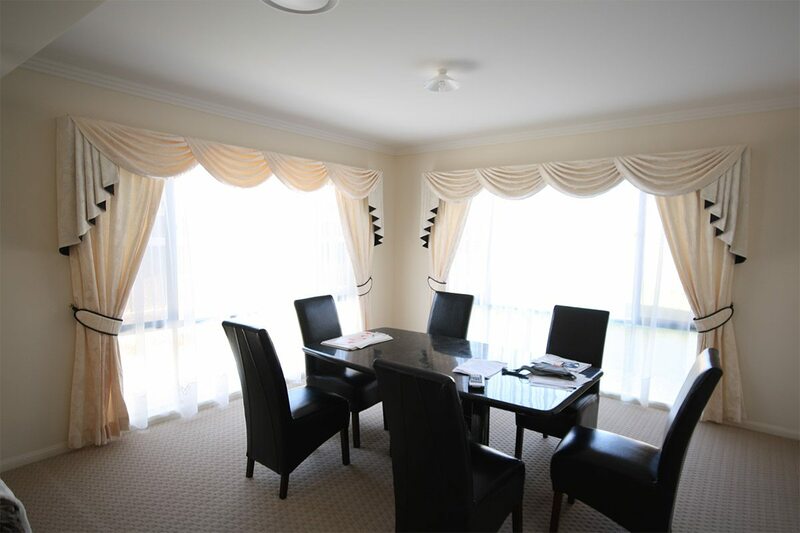 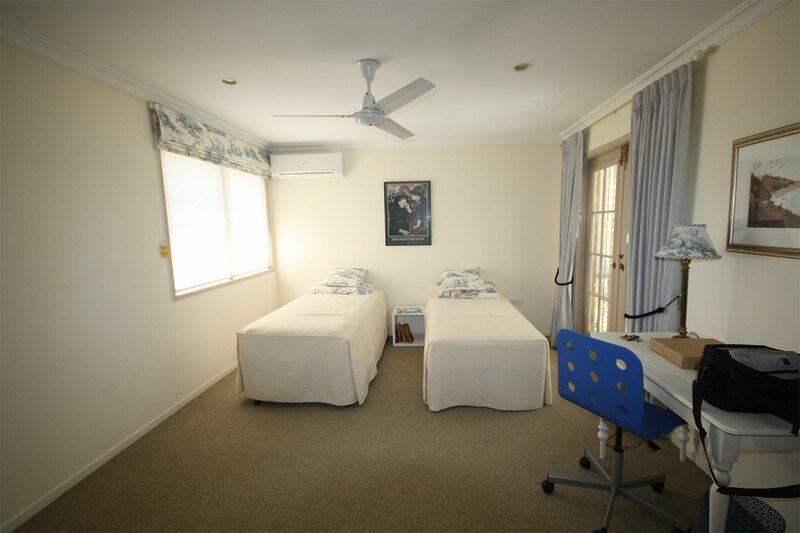 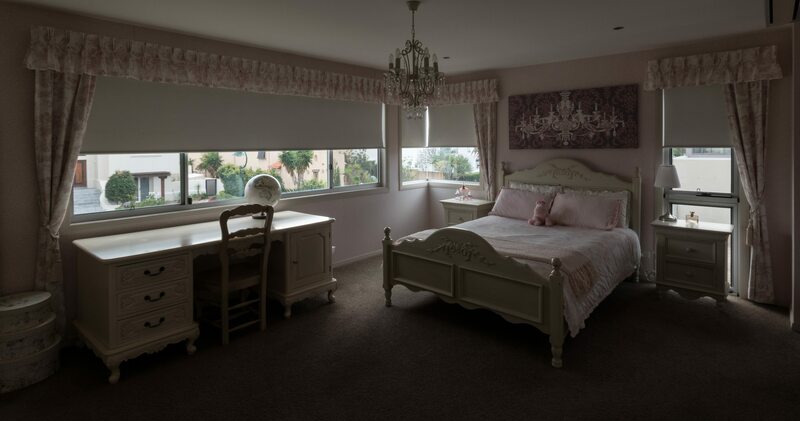 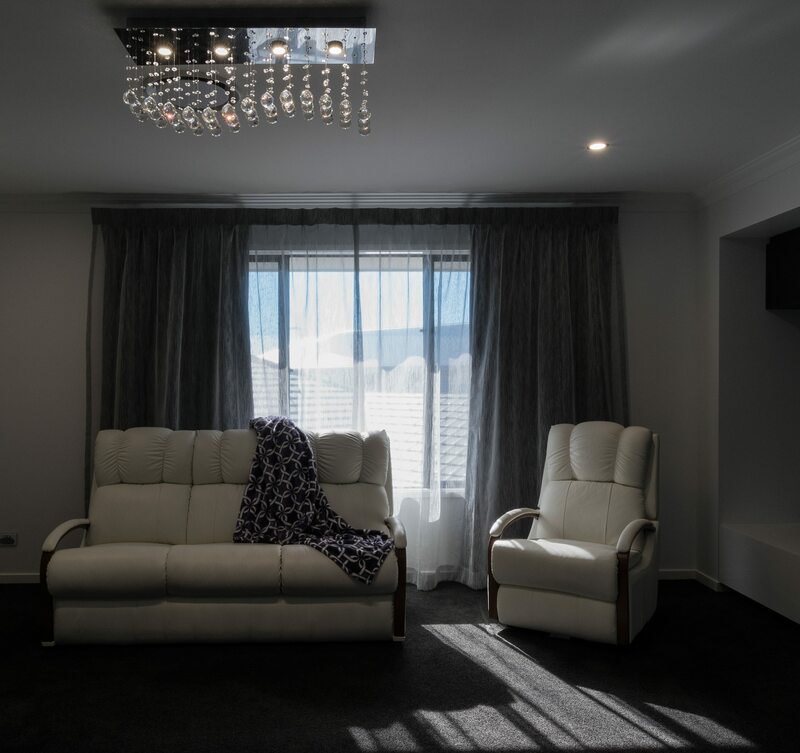 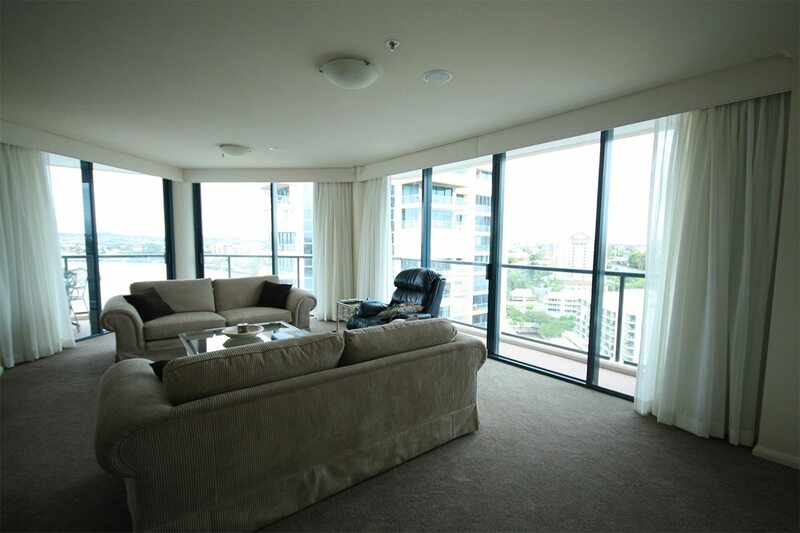 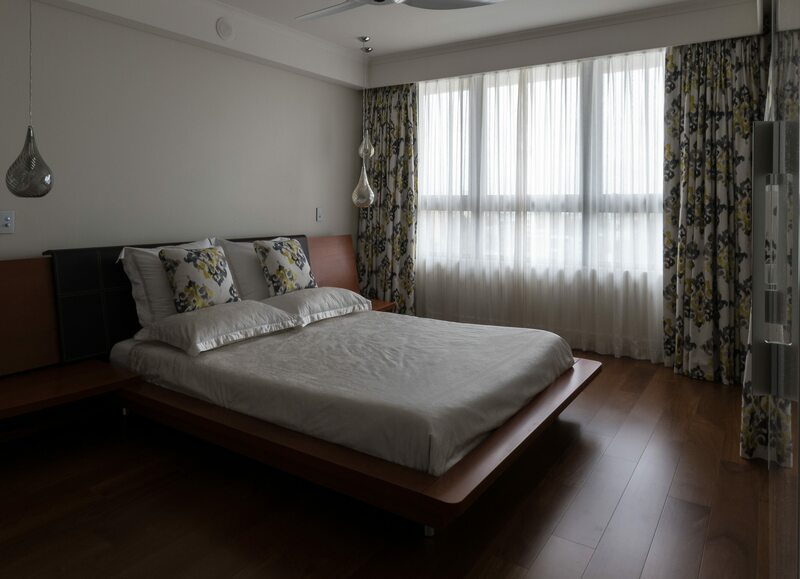 S Fold sheer curtains installed into the ceiling with roller blinds behind. 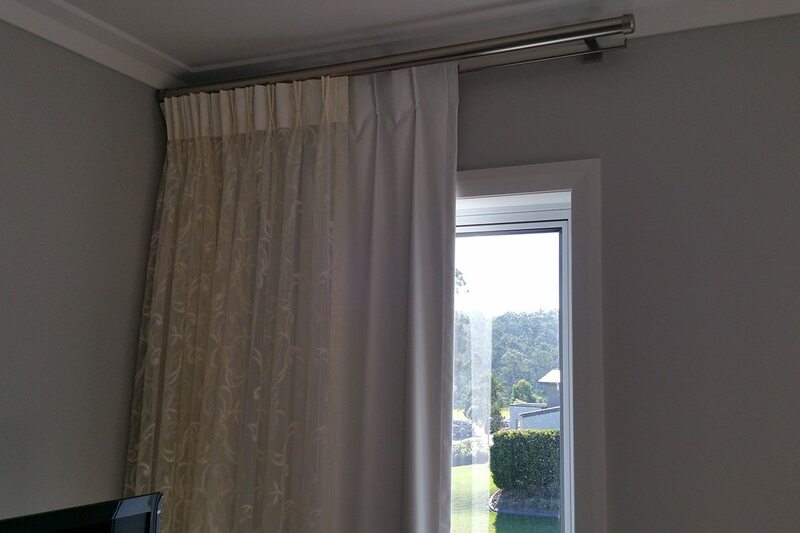 Ceiling fit track with S Fold curtains in a hallway with roller blinds behind. 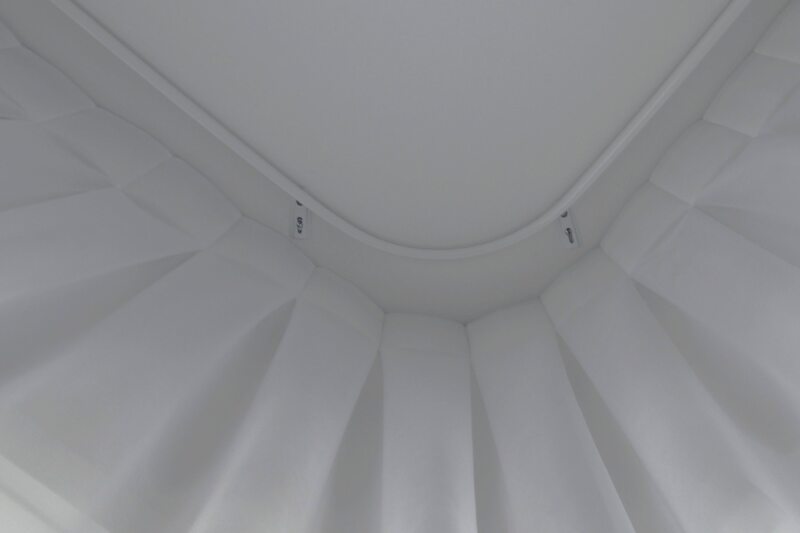 Double pinch pleat sheer installed on a bent series 58 track from the ceiling with a block out lining on the back, all pulling to the left hand side. 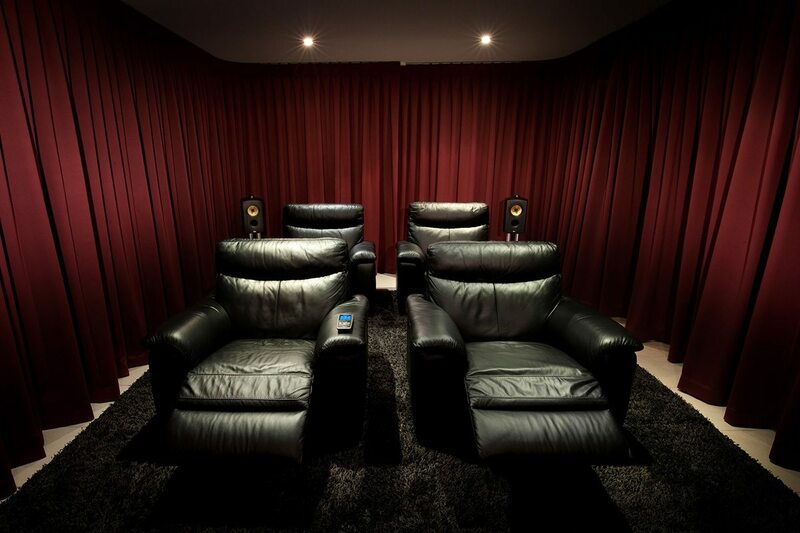 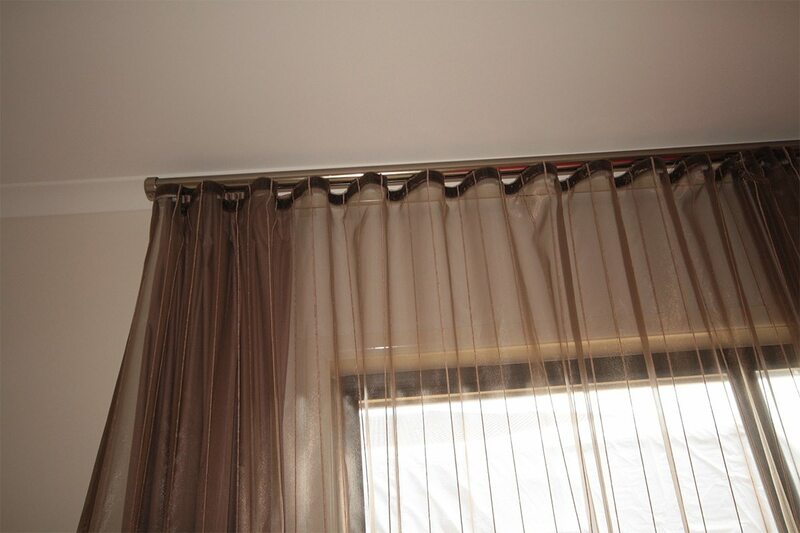 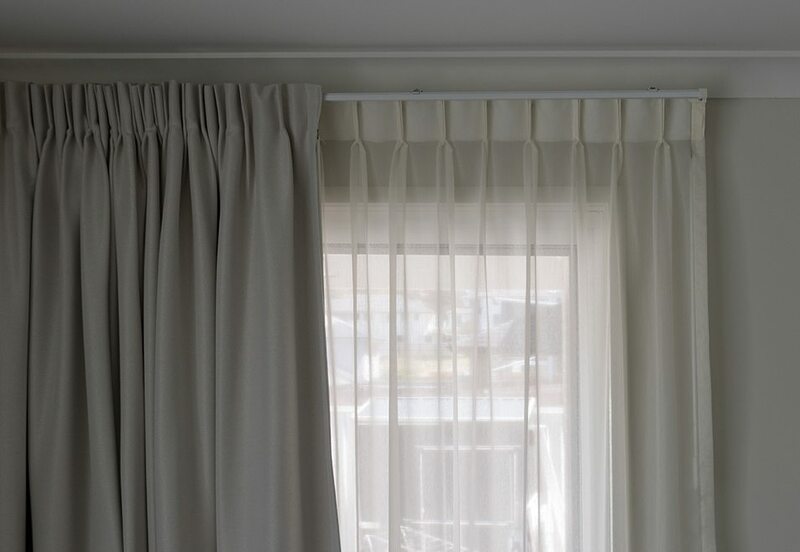 Sheer curtain with a double pinch pleat on a bent series 79 ceiling track. 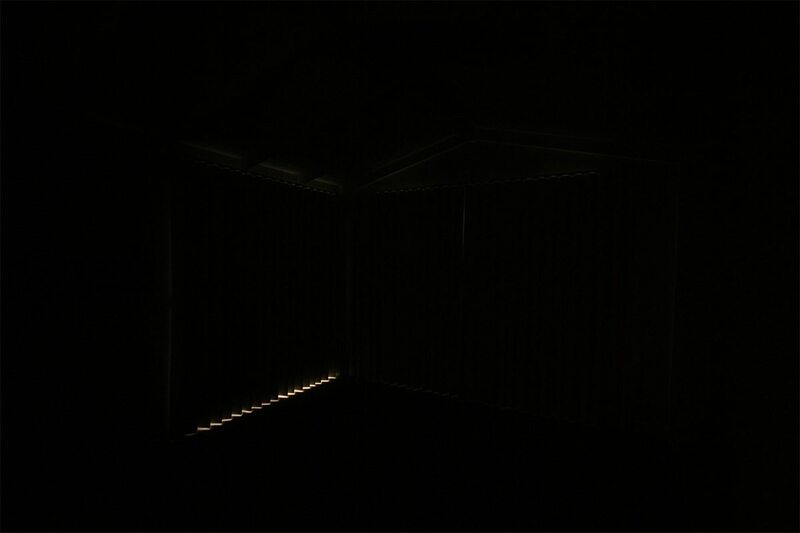 Opening one way. 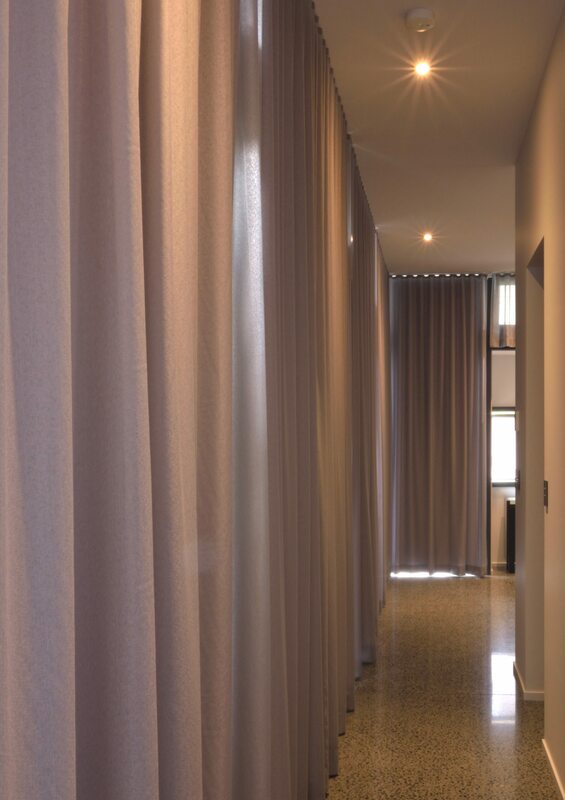 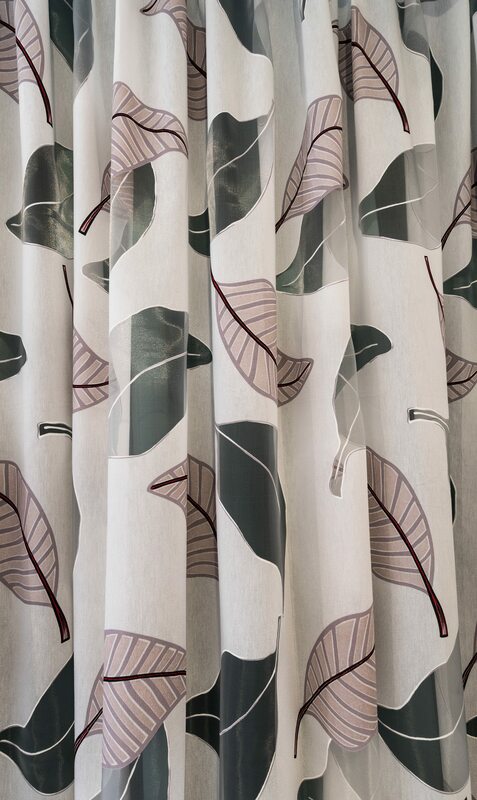 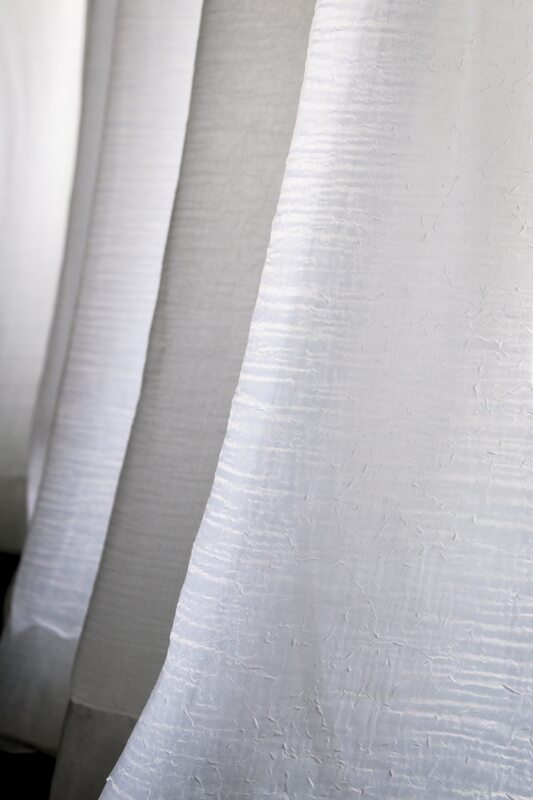 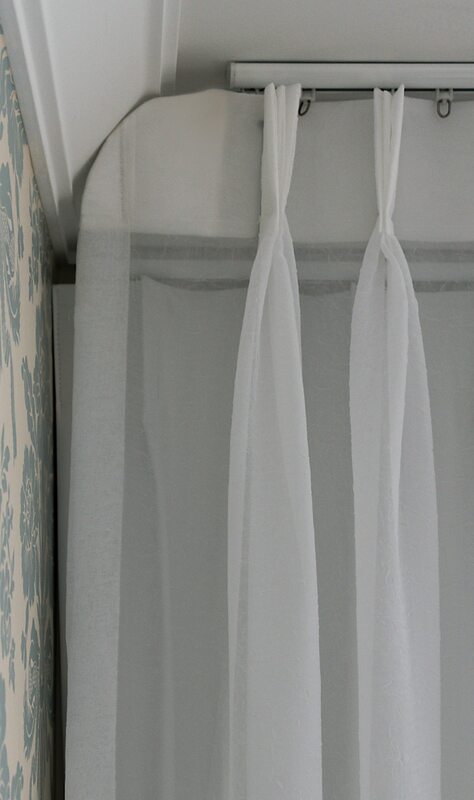 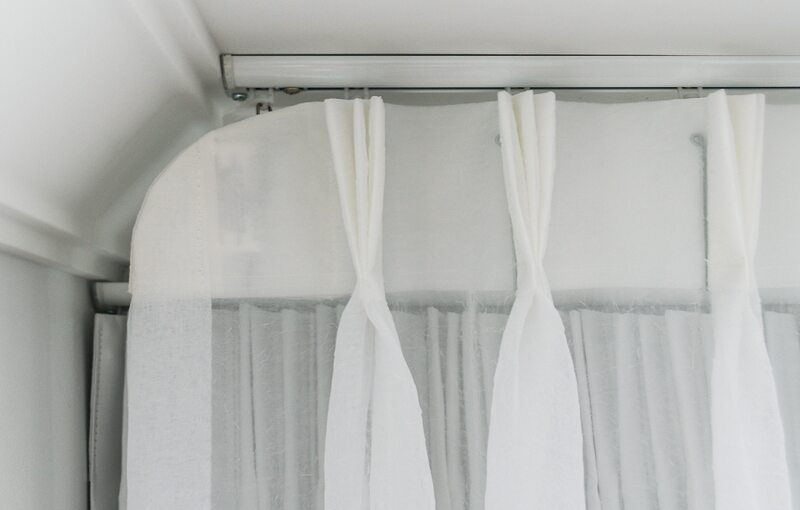 Organiza sheer curtain with a double pinched pleat from the ceiling on a bent series 58 track. 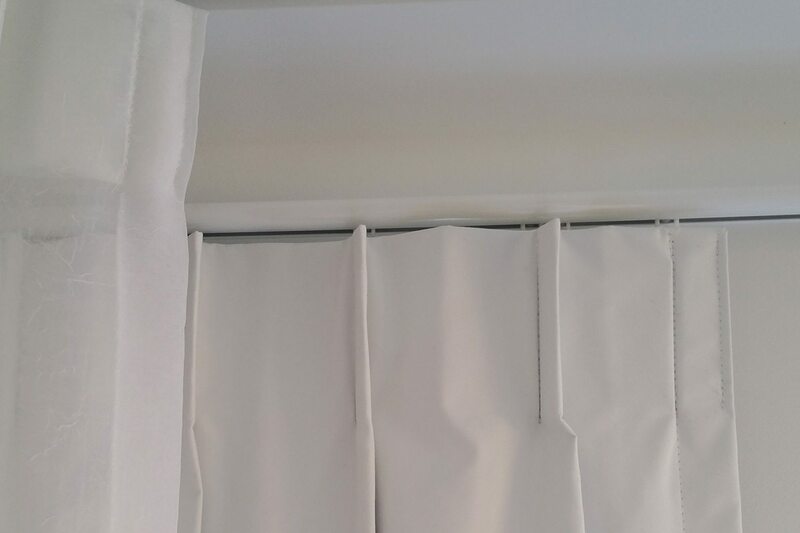 Opening one way. 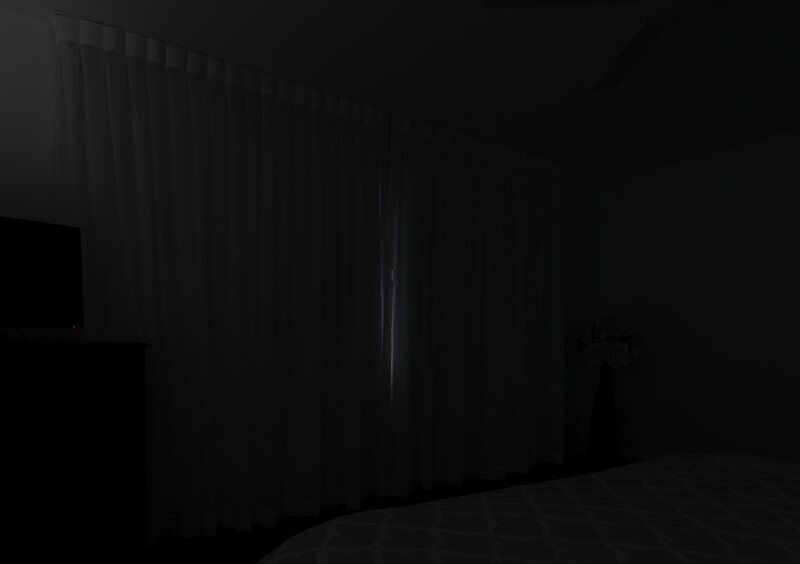 Block out curtain behind. 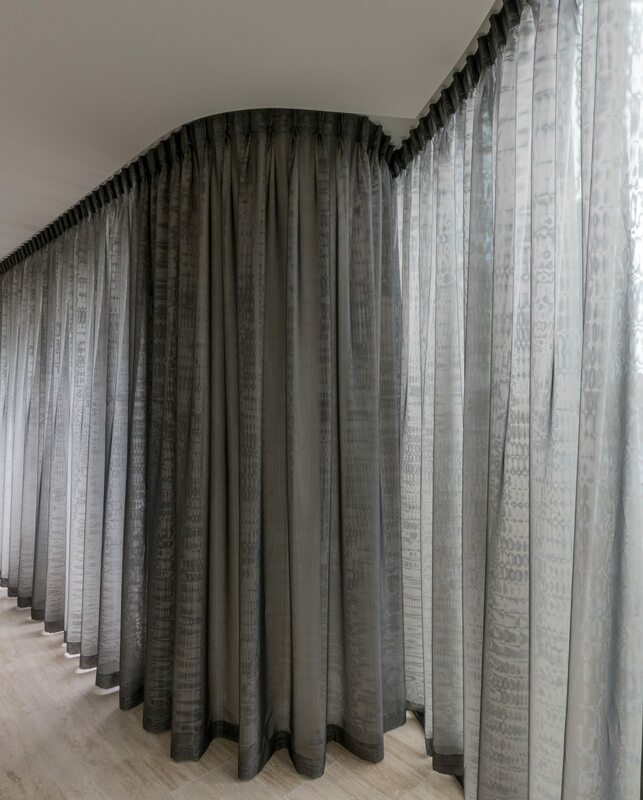 Double pinch pleat printed sheer install on a series79 track from ceiling. 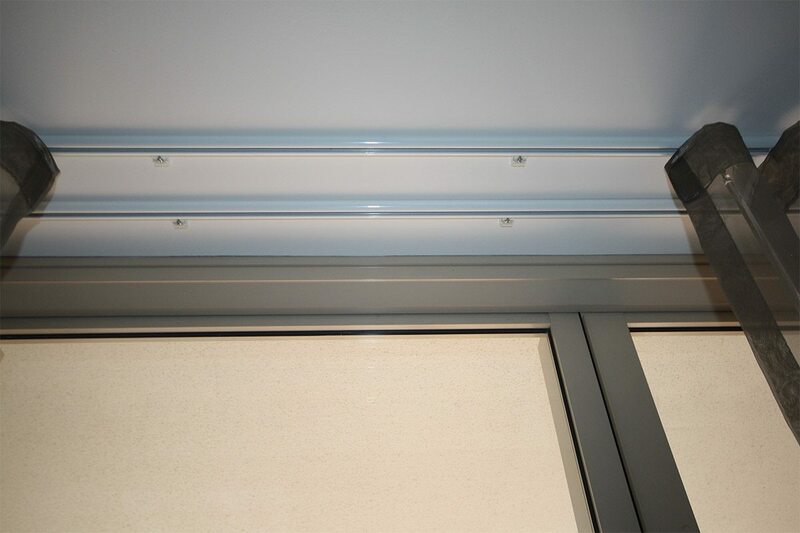 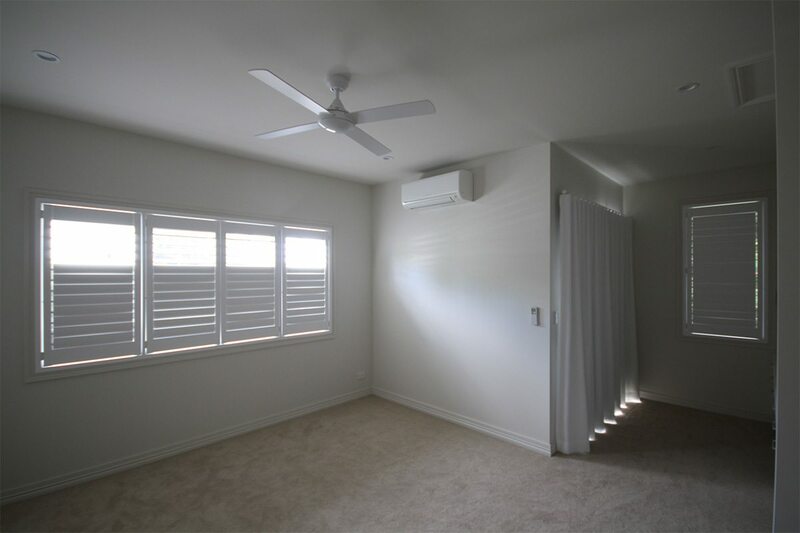 Double bent motorised tracks installed from ceiling with center open sheer on the front and block out lining on the back track. 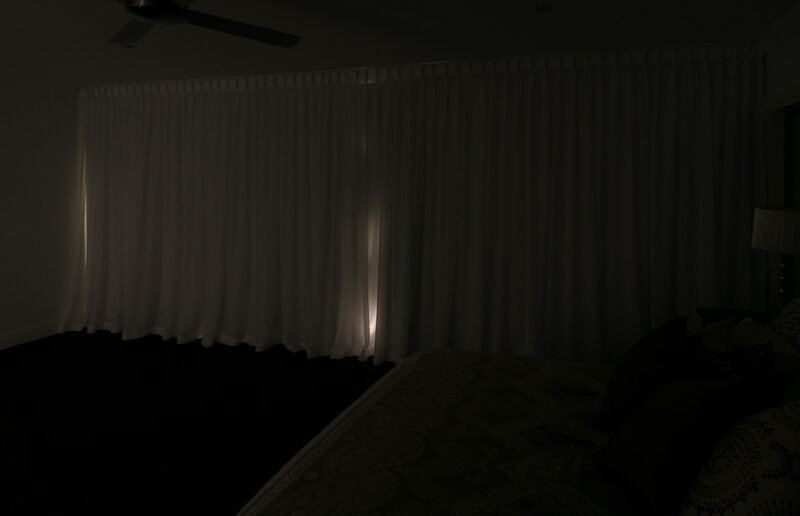 Curtains closing of an opening for sound reduction The curtain on the right is double layered.